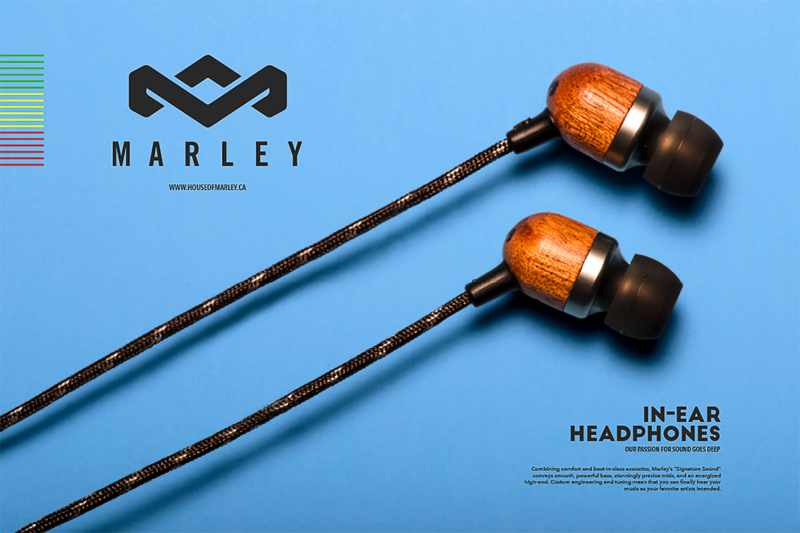 MacEwan University's Portfolio Show for the Design Studies program is the summary of the past three years of hard work and dedication by this year’s graduating class. MacEwan has provided these students with the opportunity to develop and refine their skills and craft within their majors: Illustration, Photography, and Digital Media. Eclectic showcases the different skill set of each graduate but also demonstrates their interests and talents outside of their majors. Hi, I’m Jordan Anderson. 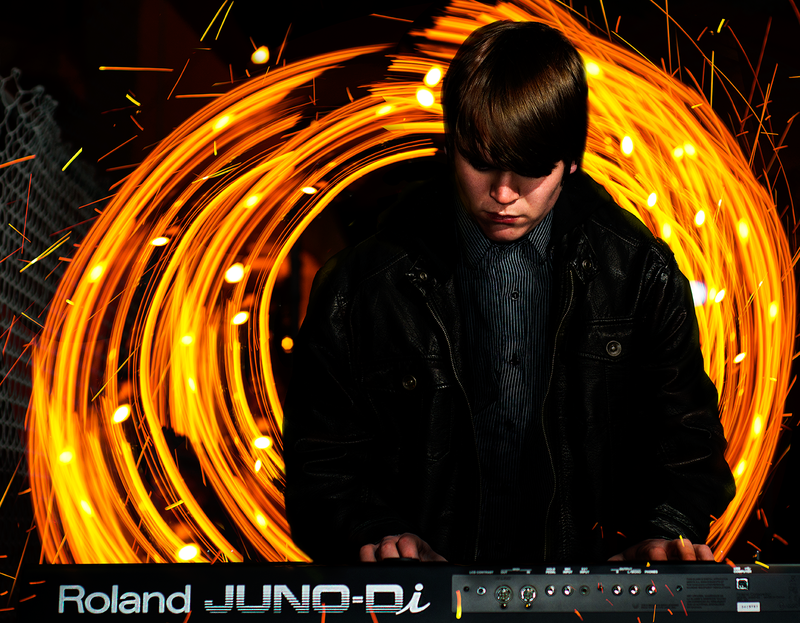 I’m a digital media designer who loves exploring all forms of creativity but particularly design and music. 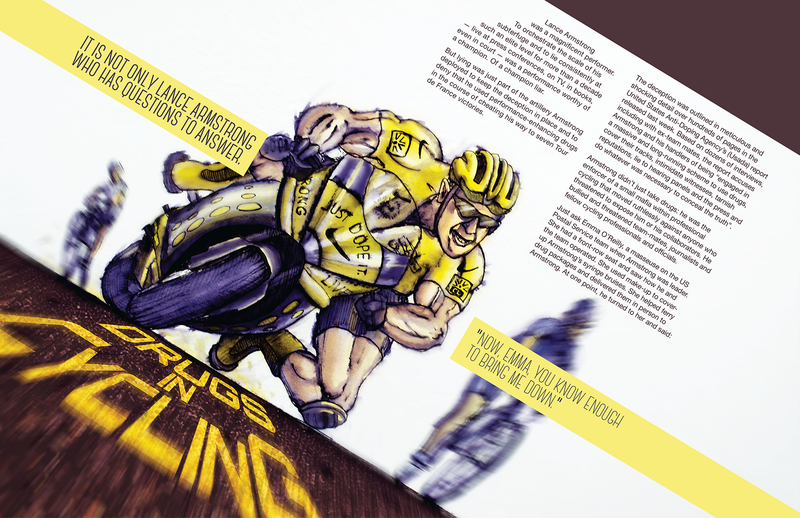 I enjoy taking on challenging visual problems and turning them into attractive, meaningful and innovative solutions. Through my education, I have grown to be proficient in UI/UX design, brand identity, 3D design and 2D/Print. When I’m not designing you can find me camping, snowboarding or grabbing a beer at Original Joe’s. Where do you draw inspiration from outside the world of design? It’s hard to pinpoint since it can vary dramatically between each project. However, I constantly depend on music, nature and culture. 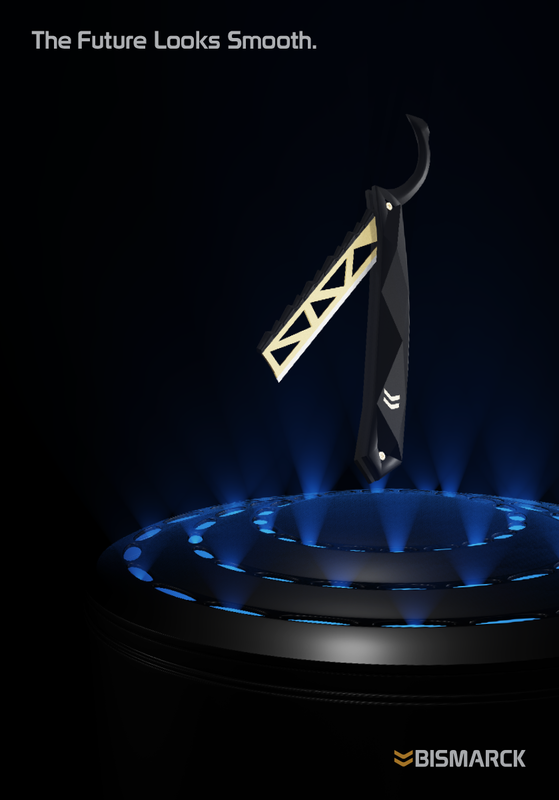 The Bismarck’s advertisement/product design is positioned so that using an open razor will become something of the future rather than the past. 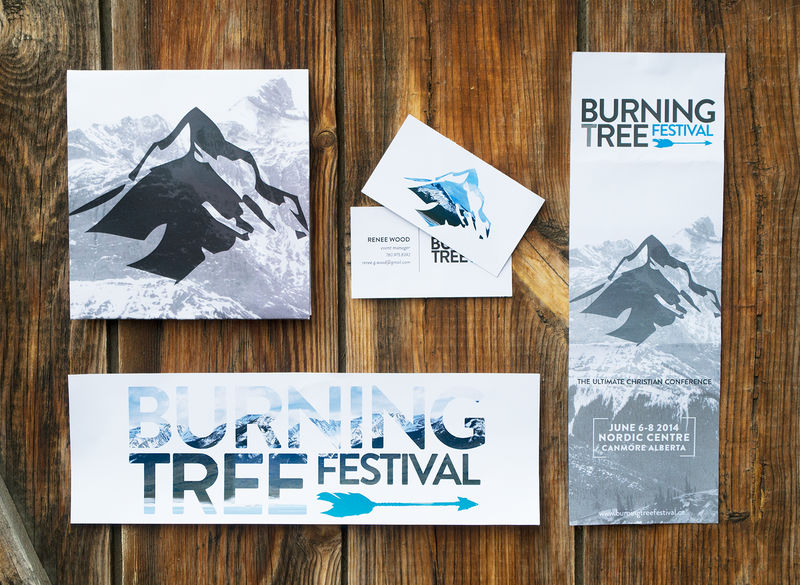 This identity system’s graphical aesthetic portrays Fort Edmonton’s historical and educational platform. Consistency and variety are balanced for a cohesive system. 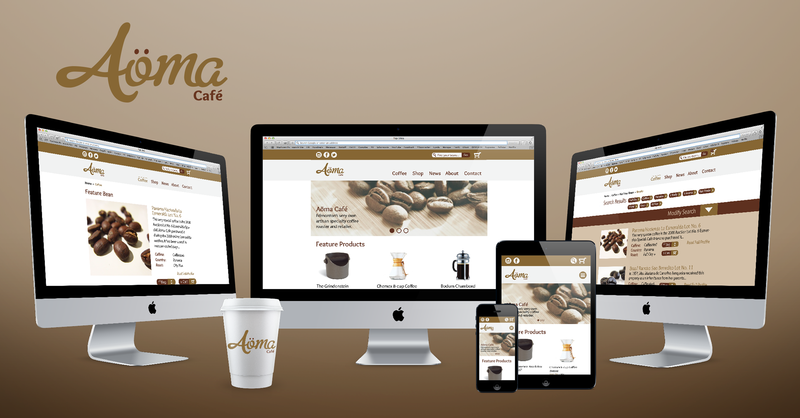 Aöma’s identity/web design represents the calm and classy atmosphere of the café itself. 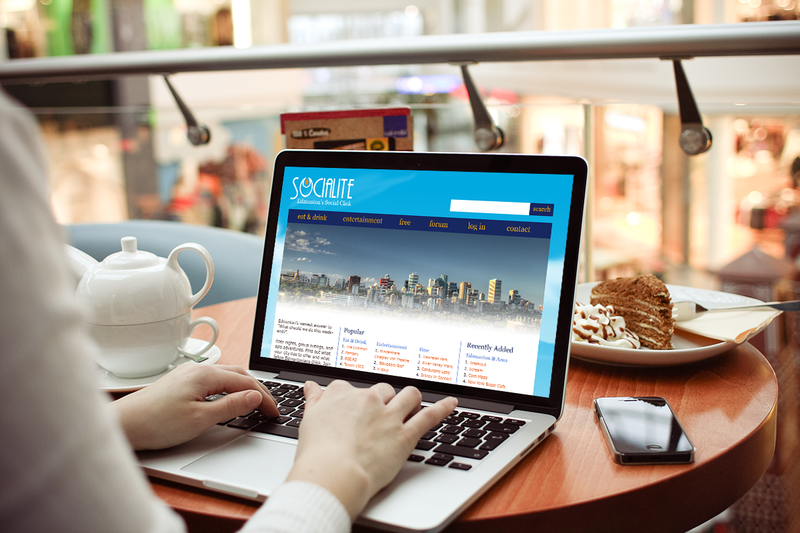 Attention was paid toward user experience in the site’s development. 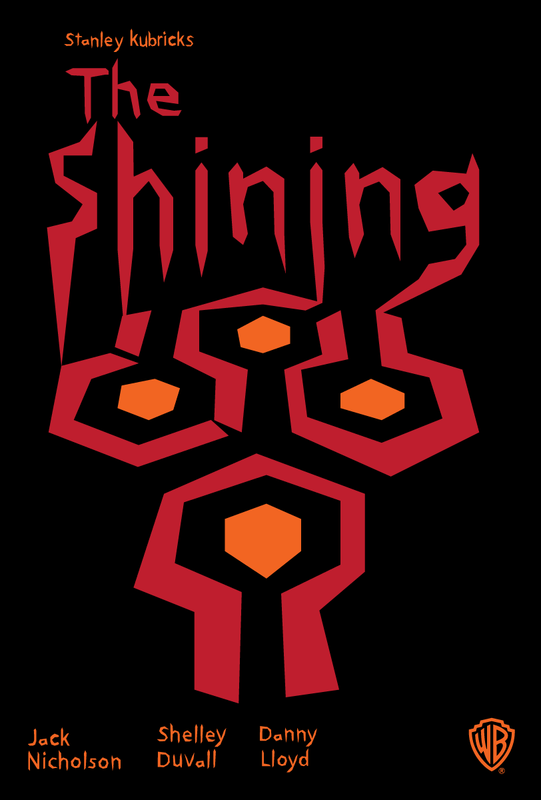 This Saul Bass tribute poster was designed to illustrate a conceptual compilation of key symbols from the dark and gruesome film The Shining. I am a creative oddball in my late twenties looking to start a career in the design or photography world. 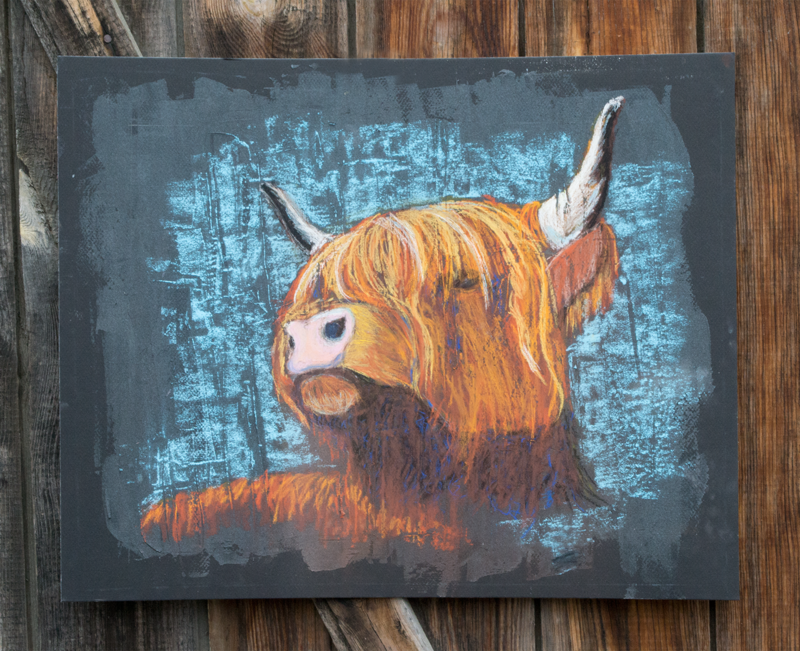 Taking a grassroots approach to my work I enjoy labouring and hand crafting my pieces and I feel much more involved and connected to my work by doing so. 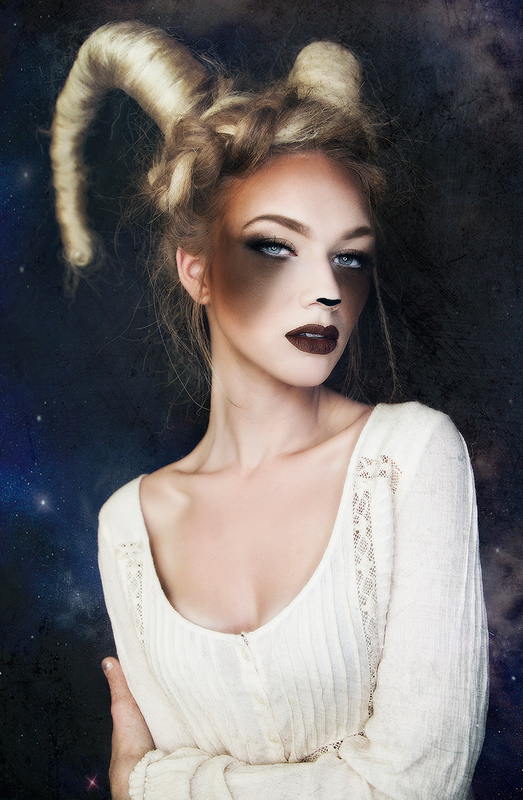 Despite my love for traditional craft I am fully capable and happy to create with contemporary digital techniques as well. I’m deeply inspired by the DIY culture and many of my friends who have taken it upon themselves to create the things that they want to see. The fist time I read this question I knew I wouldn’t have a serious answer. 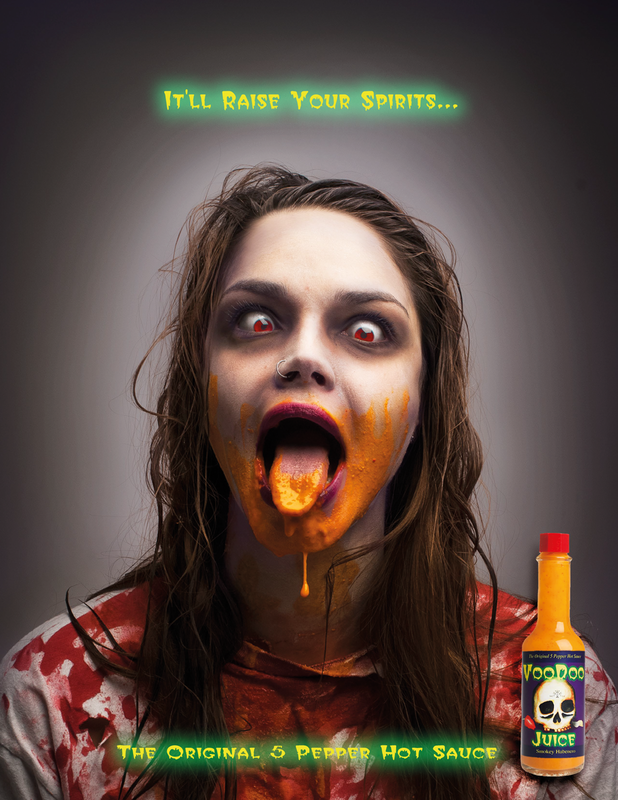 Students were to create a photo-based advertisement for a fictional hot sauce brand that they created. 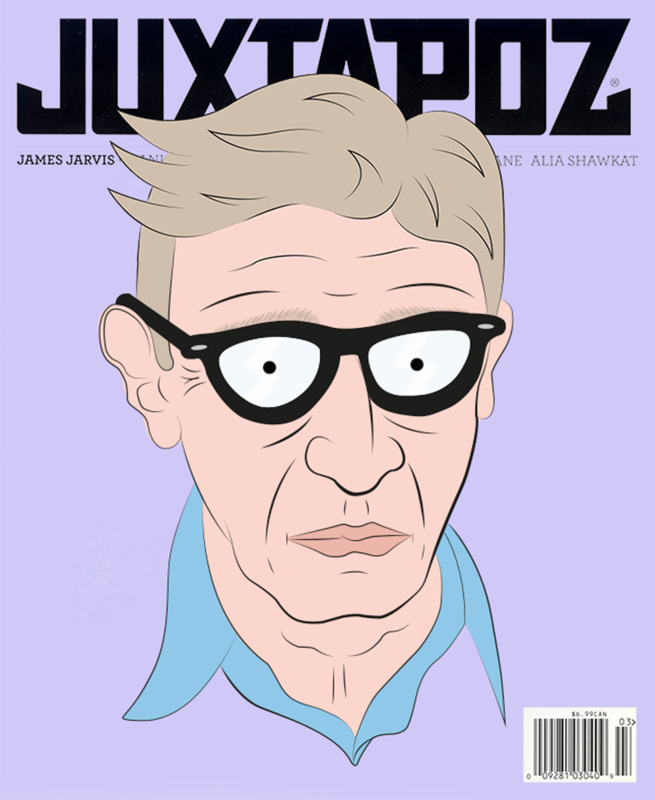 After given an image of an artist or musician students were to create a fictional publication were the assigned artist would be featured on the cover. Students were each given a small item (in this case a green vase) and expected to create a full-page photo-based advertisement of the product. If I have learned anything in the past 3 years it is that there is something incredible and invigorating about honing the ability to bring an idea into being. I’ve also learned that I will never be able to look at another restaurant menu without intense scrutiny. I am a huge sci-fi nerd, I love the campy 60s space age stuff where it has bold colours and crazy shapes. Confusing, Gooey, messy, awkward, sticky, sweet, salty, chocolaty, and delicious. That’s what my first Tim Tam Slam was like. 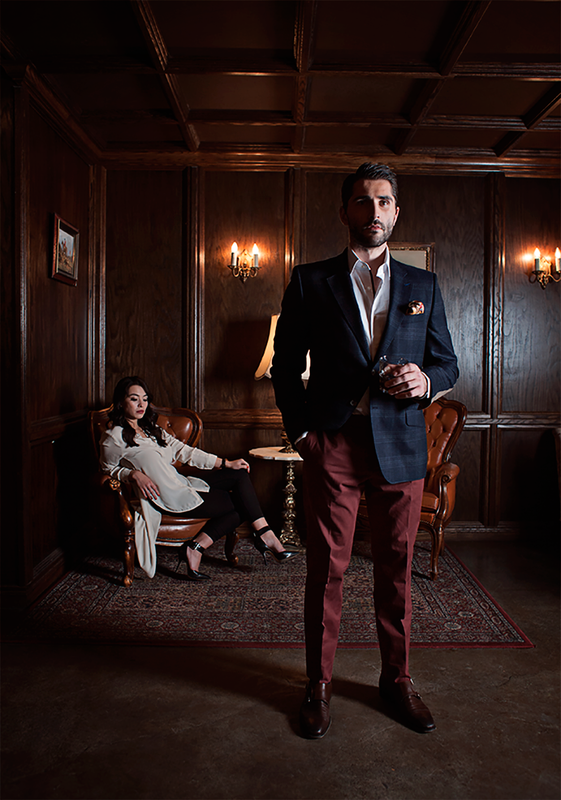 An editorial fashion shoot advertising men’s high end fashion. A collaboration with classmates. 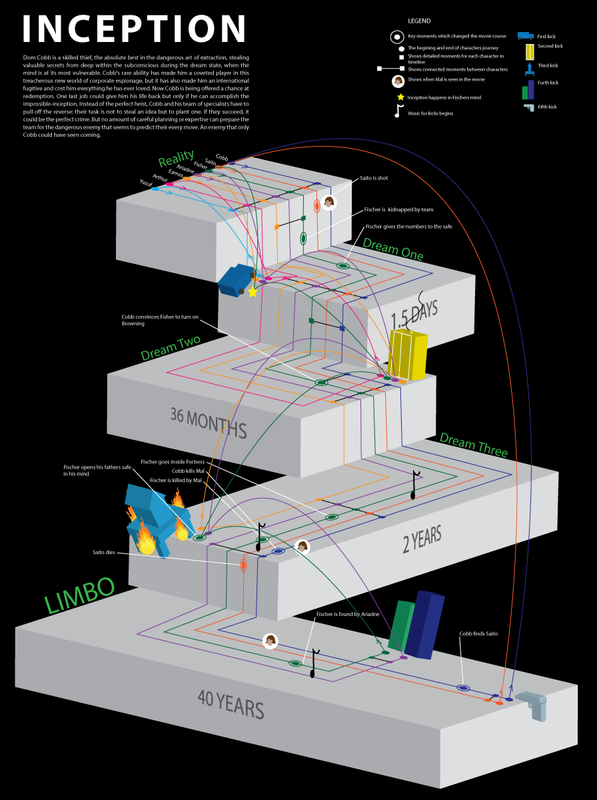 An infographic showing the timeline of the movie ‘Source Code’. Product photography for a high tech product. 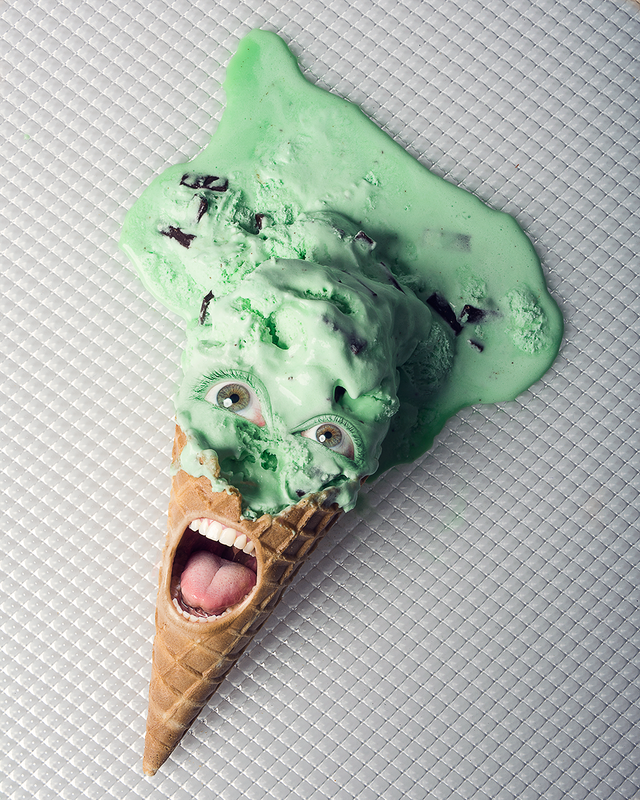 A visual pun of the words icecream cone. Hi, I’m Jenna. I was born and raised here in Edmonton. When I’m not designing I enjoy diving into a great classic adventure novel, creating new culinary dishes at home, traveling to new places, and discovering the world through my camera lens. Most of the time I end up finding inspiration without realizing I’m looking for it. Usually when I'm zoned out of the design process. The first time I remember trying to draw a realistic portrait I was 8 years old. I thought it was amazing at the time-now it looks terrible. 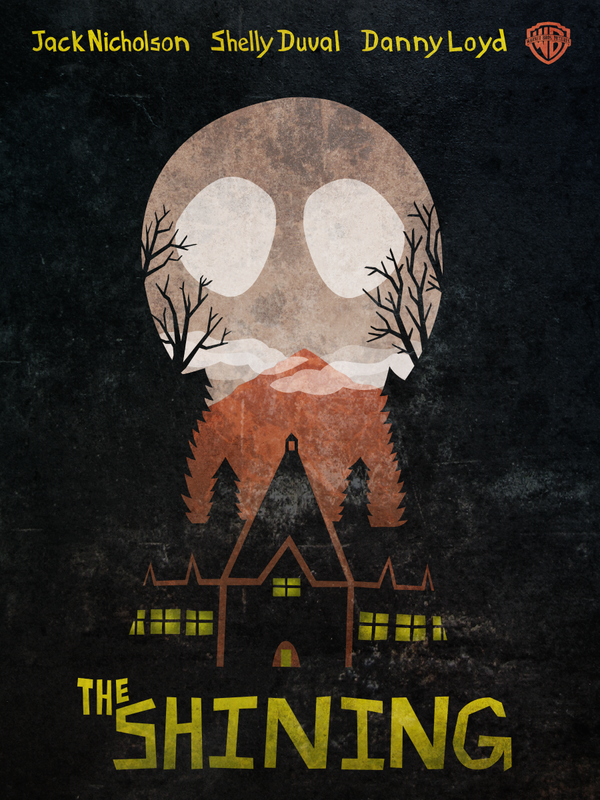 This is an interpretation of a movie poster for the The Shining, the style was based on that of the legendary Saul Bass. The intent with this project was to show the layouts and details of a complicated story line like in Inception. 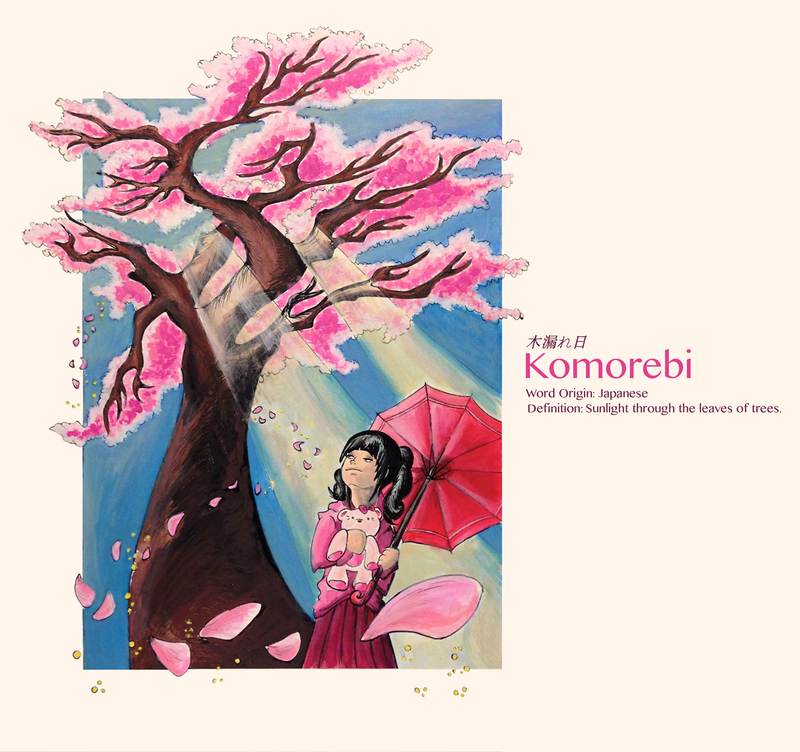 This is a website for a music artist based on their new album artwork, so that the website matched the feel of the album. 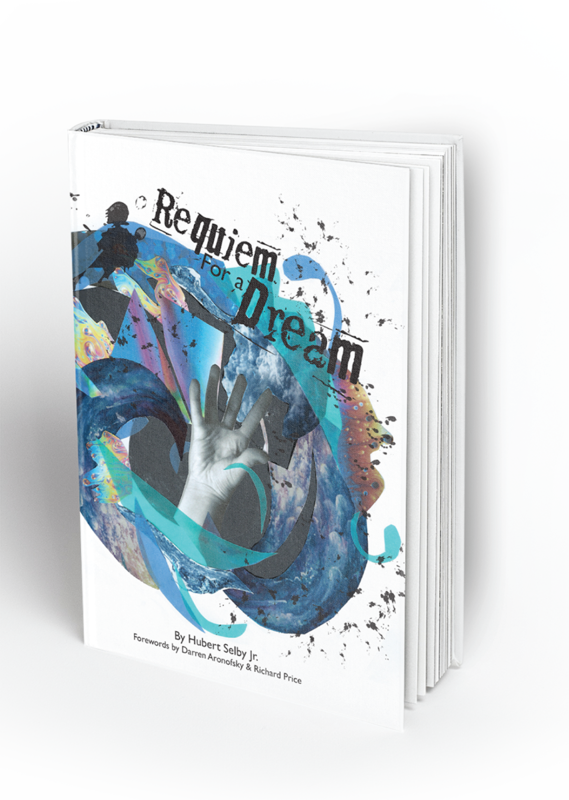 This project was a redesign of the book cover for Requiem for a Dream. 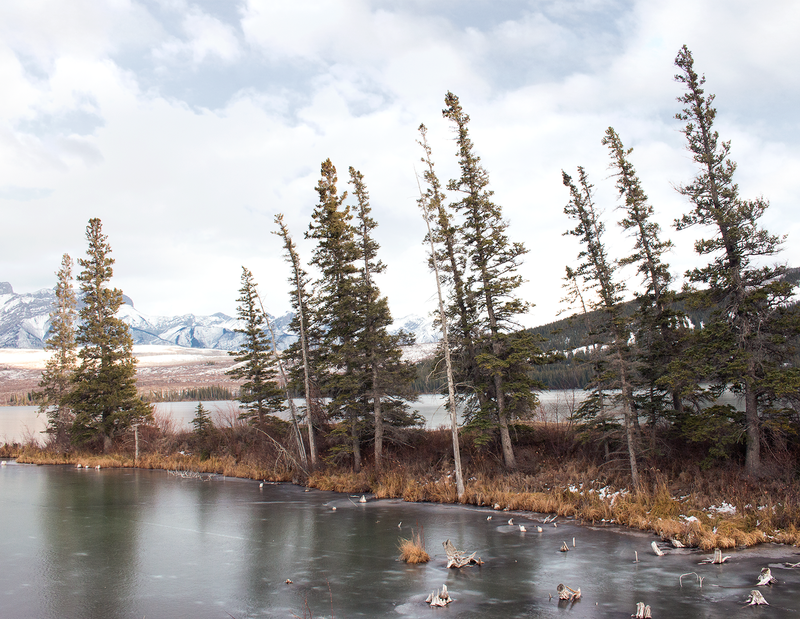 Amanda Bunning was born and raised in Hinton, Alberta. Though Edmonton is much larger, every year her roots grow deeper here. She loves illustrating issues surrounding current events, people and the environment. University has taught her the power of a well-designed idea. Moving forward she hopes she can reach people personally with those ideas. Above all, Amanda is grateful that she can spend her life being inspired and passionate about her career. I’m inspired by music, tattoo culture, my family and friends. Also by people who are passionate about what they do no matter what it is. The first time I knew I was supposed to be an artist was in eleventh grade. This year was the first time I identified as an illustrator. 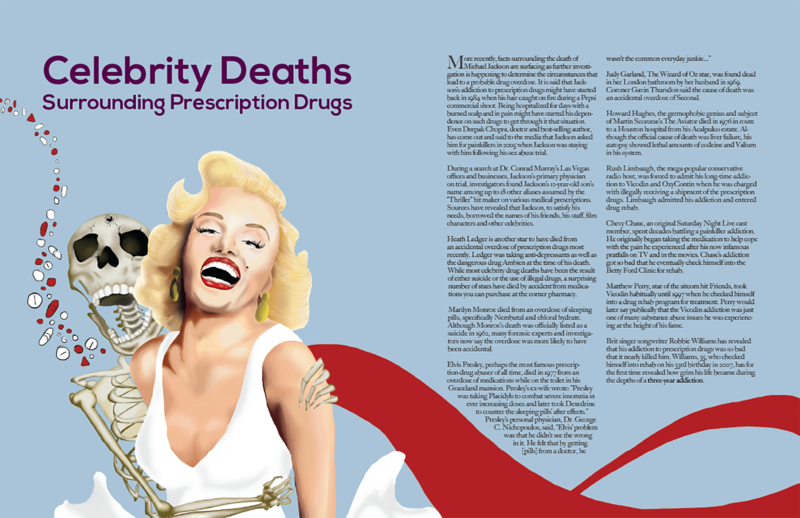 An Editorial layout based on the article “Celebrity Deaths Surrounding Prescription Drugs”. Shows how glamorized drug use is in Hollywood. 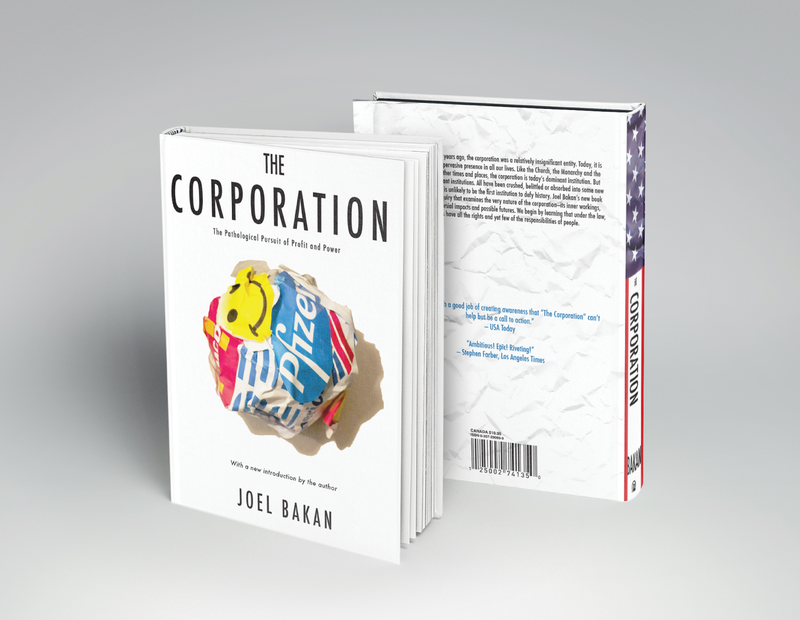 An Illustration designed to advertise for a publication company. 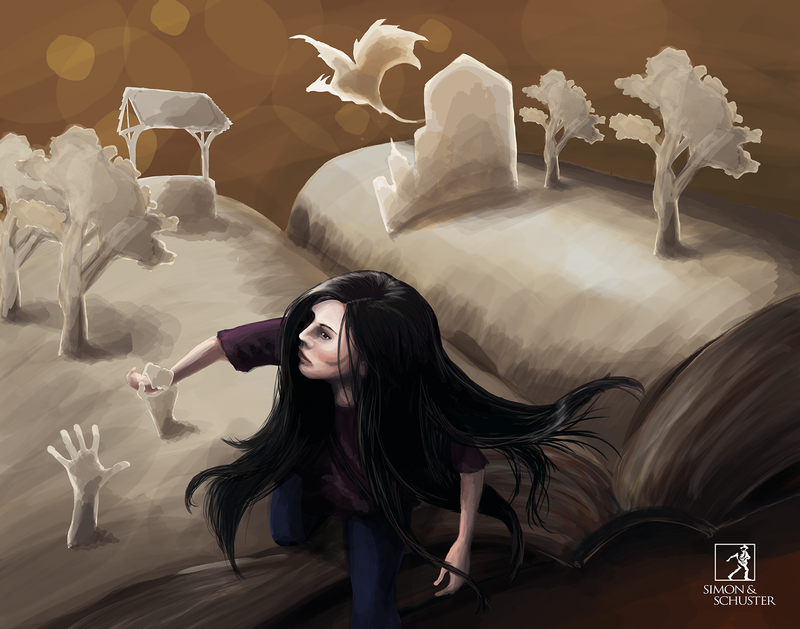 Focuses on fantasy novels and how people get captured reading them. 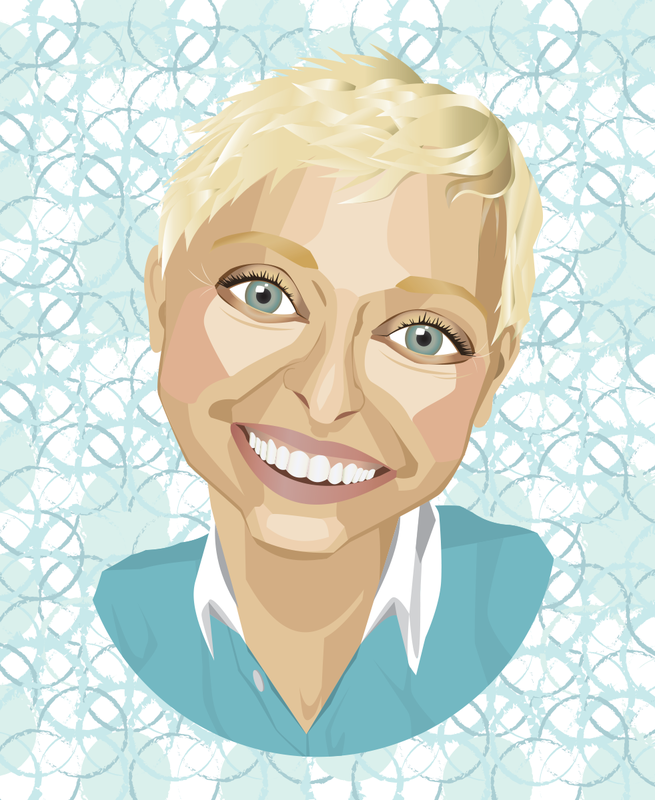 A vector portrait of Ellen displaying her bright and cheerful personality. 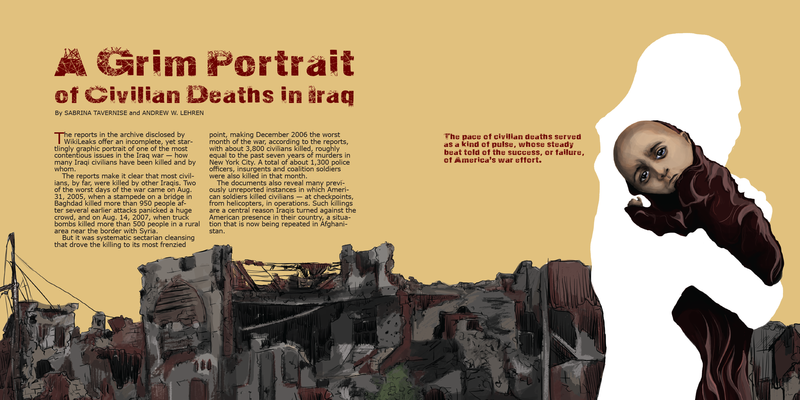 An Editorial layout based on the article “A Grim Portrait of Civilian Deaths in Iraq”. Humanizes and shows the loss of Iraq Civilians. 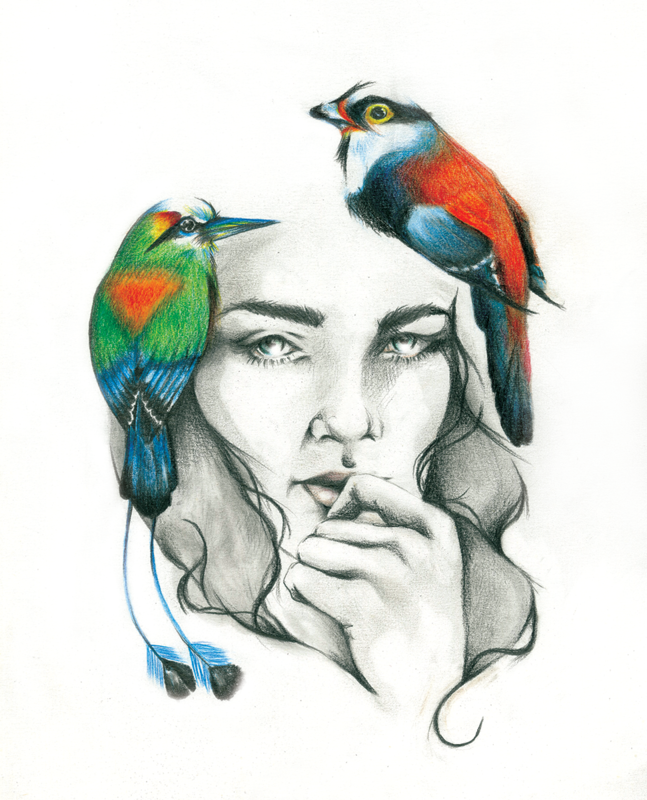 Born in raised in Edmonton, Alberta Caitlynd was exposed to the arts at a very young age. Her fondest memories are of playing hide and seek in her father’s studio and exploring various galleries in Edmonton and Calgary. From a very young age she knew that she would likely seek a career in the arts but struggled to find her own medium. Seven years ago she was given her first dSLR for Christmas and quickly realized her love for photography. I look to my childhood for inspiration where my imagination and creativity formed; it was free, untrained, and my own. With sweaty hands and quick pulse, I gripped it tightly and mounted it on the body. To this day my 50mm f/1.2 is my favorite lens. Food inspired fashion. Chili’s and chocolate, spicy and sweet, inform the mood an aesthetic of this image. The juxtaposition of the beautiful and lively against the forgotten and decayed is a commentary on disposability of things once treasured. Indian bridal fusing traditional and modern aesthetics. 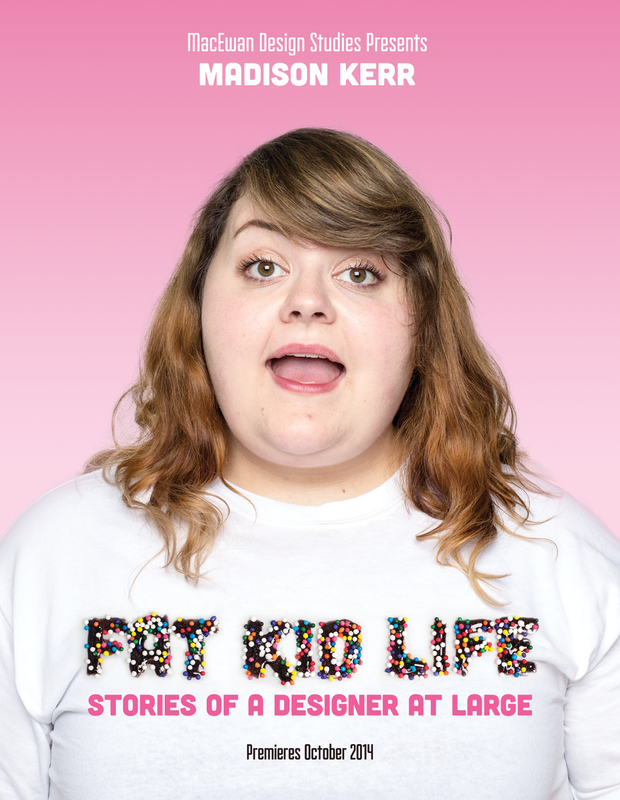 My name is Christine Carey and I am a designer and illustrator soon to hit the industry full time. My favourite part of design is the resonating power it can have, as well as good typography and a strong illustration or two. My favourite medium is graphite, closely followed by acrylics and pen and ink. Aside from my love of design I have a passion for nature, laughter and adventure, wherever it may come. In the world outside design I gain my inspiration from knowledge. When you learn, you grow and I don’t think we should ever stop growing. My first digital class was intimidating. The instructor kept saying “adobe” and I had no idea what it meant, but everyone else seemed to. 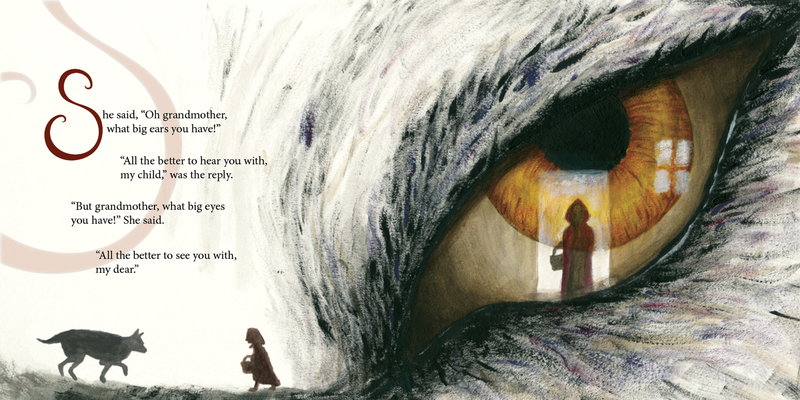 A one page spread for the fairy tale, little red riding hood. The illustration is done in acrylics using a dry brush technique. 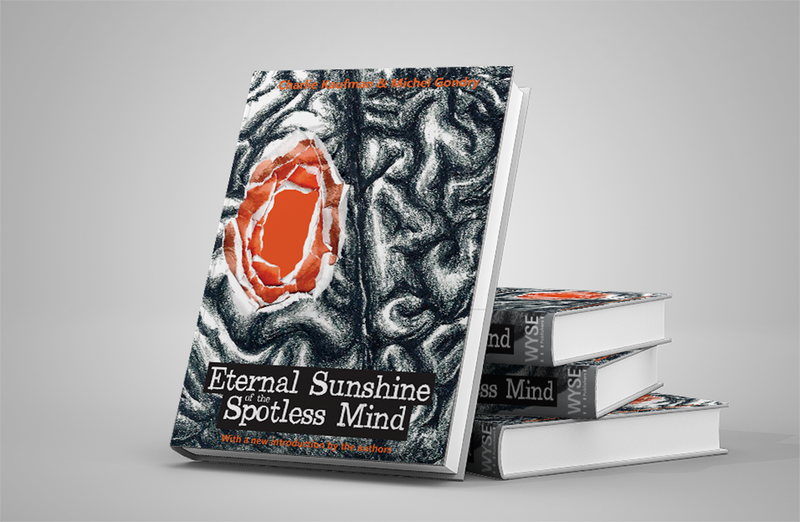 A book cover design of the movie, Eternal Sunshine of the Spotless Mind. Using the many layers of the characters memories as inspiration. 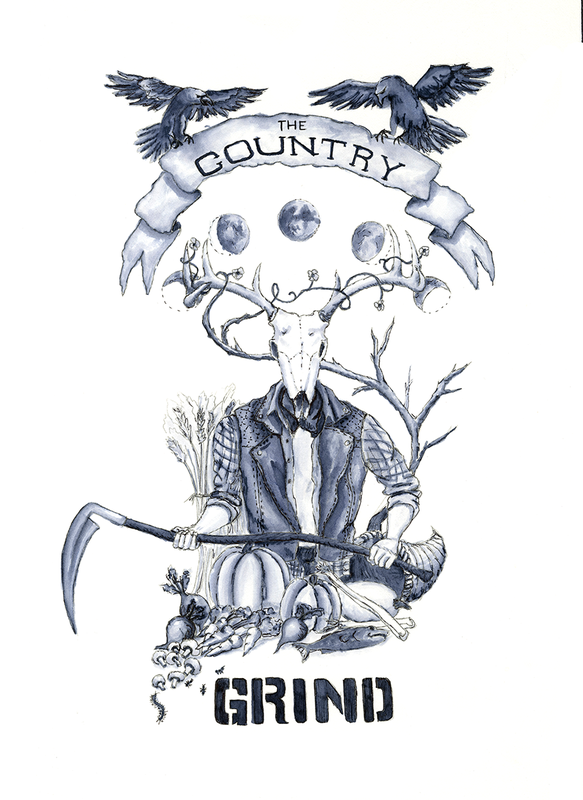 This illustration is done in Pilot fine liner and is based off an independent publication, The Country Grind, for “rural punks”. 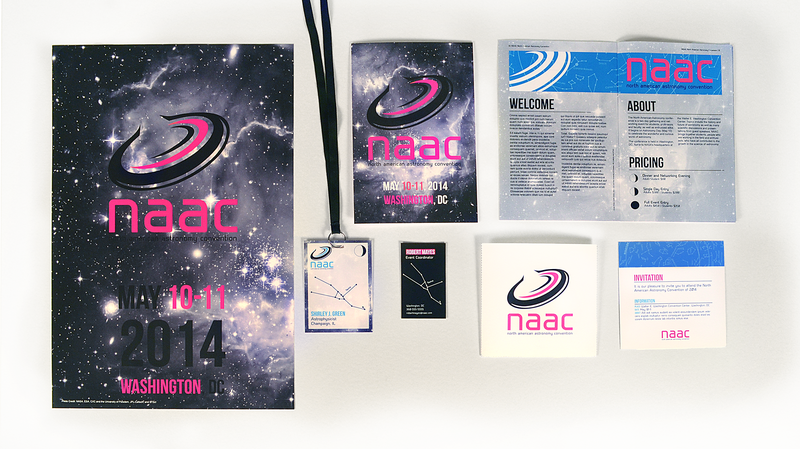 Designed for a hypothetical astronomy convention, the package includes: folding poster, program, business card, name tag and invitation. Hello, I’m Travis. 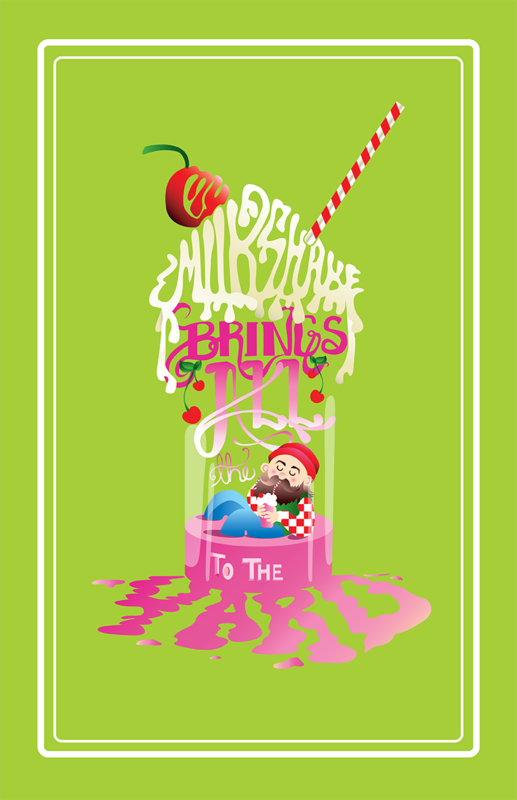 I’m a graphic designer & illustrator living in the northern, blue-collar fortress of Edmonton, Alberta. I’ve enjoyed creating since I was able to get my hands on a pencil. I’m a lover of good typography & minimalism; paradoxically I’m also a fan of messy hand drawn typography and over the top, highly detailed illustration. In my spare time I enjoy spending time with my loved ones, listening to soul music, reading comic books & drawing gooey monsters / cute lil guys. I take my inspiration from wherever. You never know what ideas might pop into your head when you’re listening to the B-side of Purple Rain. I realized I wanted to be a designer after I learned that comic book artists don’t make very much money & when I discovered typography. 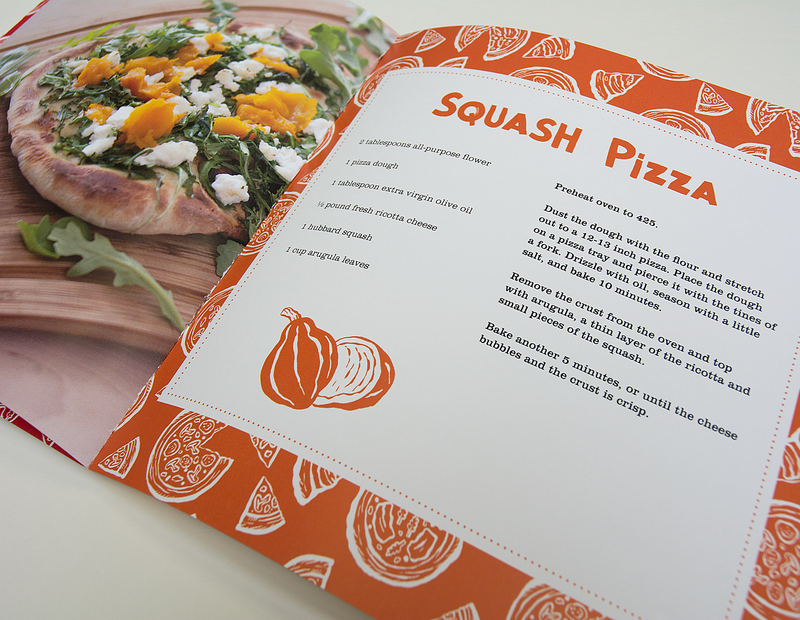 Interior spread of a pizza themed cookbook. Album Art for local garage rockers. 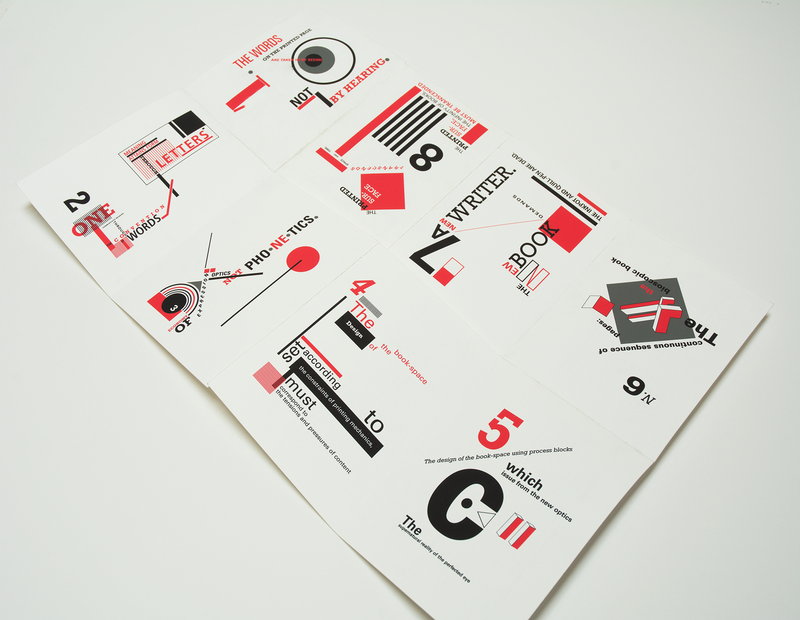 A poster that can be folded into a booklet; each page a reflection of El Lissitzky’s typography of topography. By M. Wellborn, J. Dyck, and I. My motivation to design is to create meaningful work that has strong concepts, stories, and craft behind them. This is going to get corny, but being a designer has been a dream job of mine since a young age. Growing up, I’d spend countless hours in my basement teaching myself HTML, Photoshop 7, and downloading fonts. I absolutely love visual communication and web design but my love of learning has made me want to expand my knowledge on more facets of design. I’m inspired by the people around me, my surroundings, daily interactions, and rap music. It was too big to fit in such a tight space. 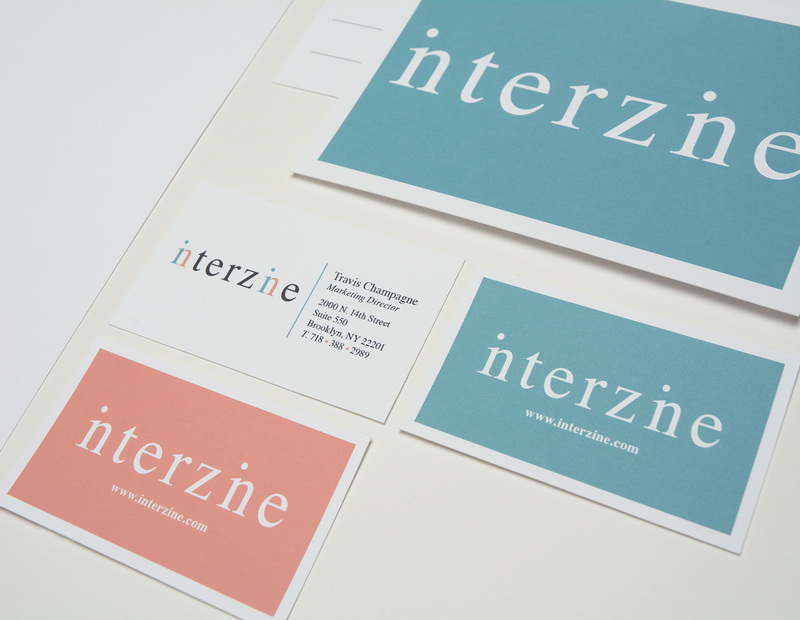 I just kept working and working at it and eventually just kerned the hell out of the type. 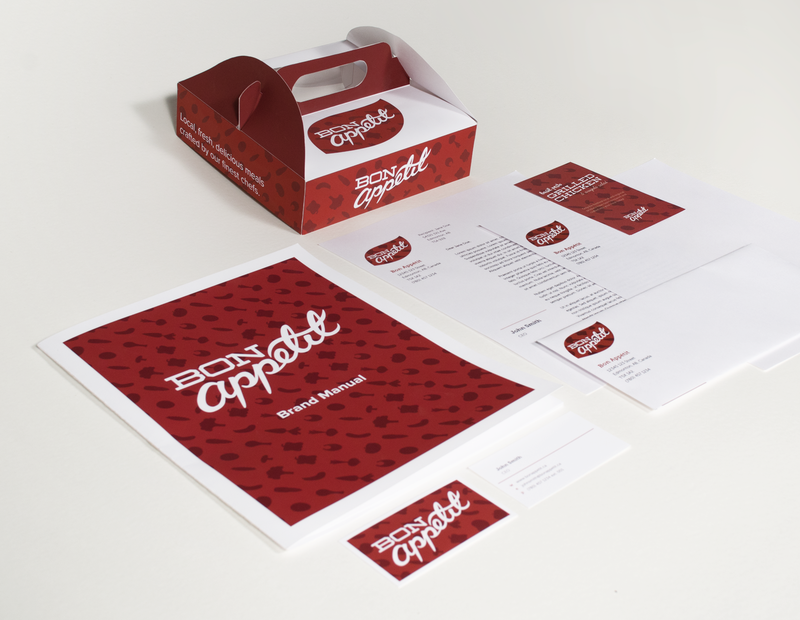 Corporate identity and branding package for a farm-to-fork company specializing in take-home meals. 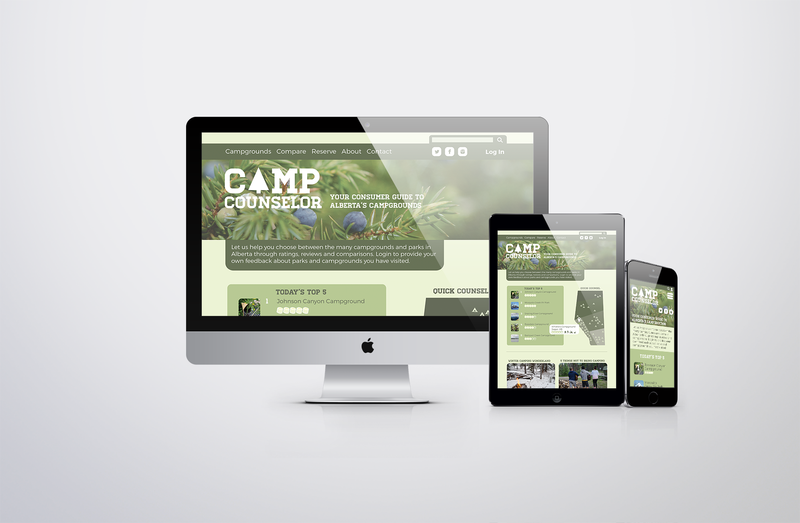 User interface design for a local non-profit organization, Chimo Youth Retreat Centre. 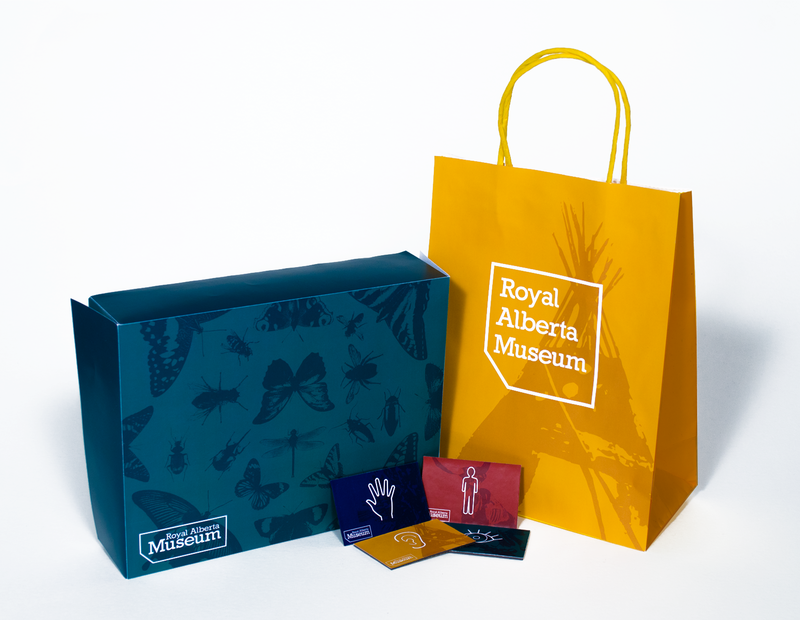 Identity and promotional items fitting with the rebrand and theme, "Senses", for the Royal Alberta Museum. 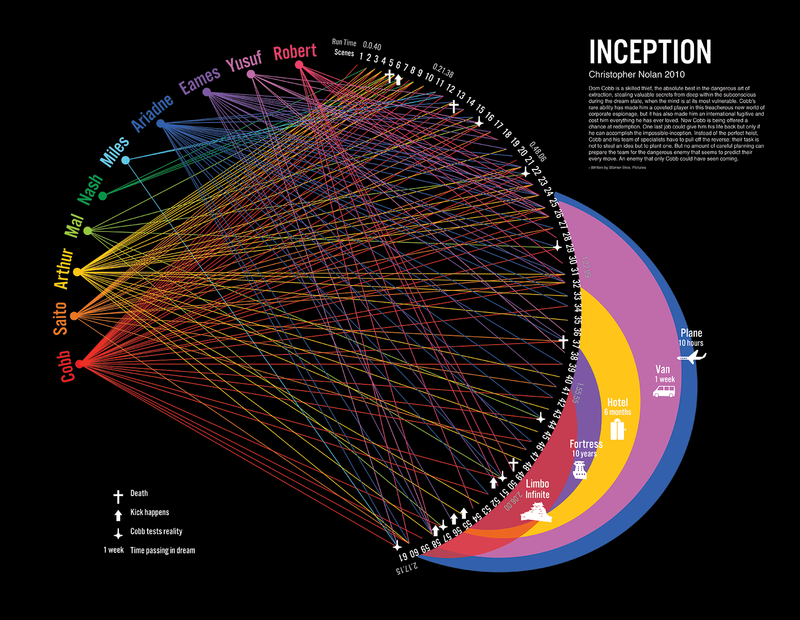 An infographic poster visualizing scenes, characters, symbols, and dream layers in the Christopher Nolan film, Inception. Hey there! My name is Kaitlyn. Illustration is my favorite form of communication. It takes careful concentration and planning, and the end result can hold so much meaning, beauty, or both! I enjoy the process of creating. It has always been very soothing for me. The world is such a lovely place to live in, I love staring at the sunrise, sunset, and everything in between. Those things that can’t be seen with the naked eye. This made me think about the first time I licked a 9v battery, and it made me shiver. 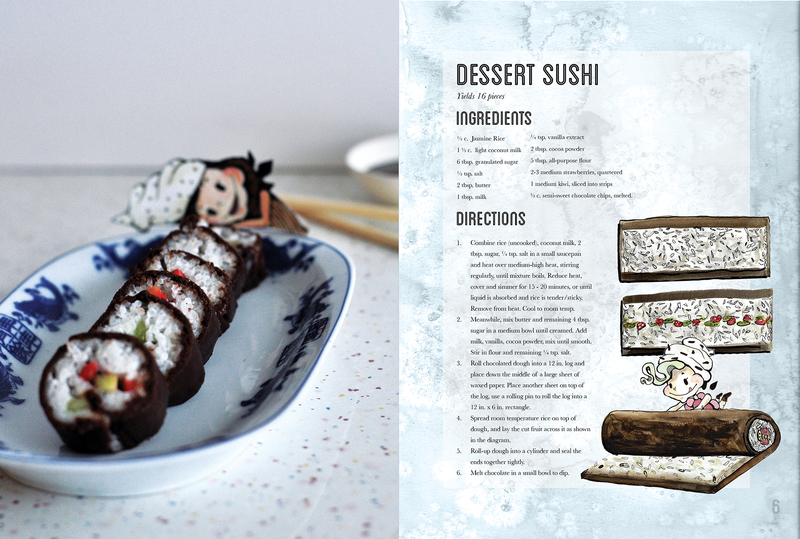 A spread from a recipe book for the dessert version of various foods. See the sweeter side of life. 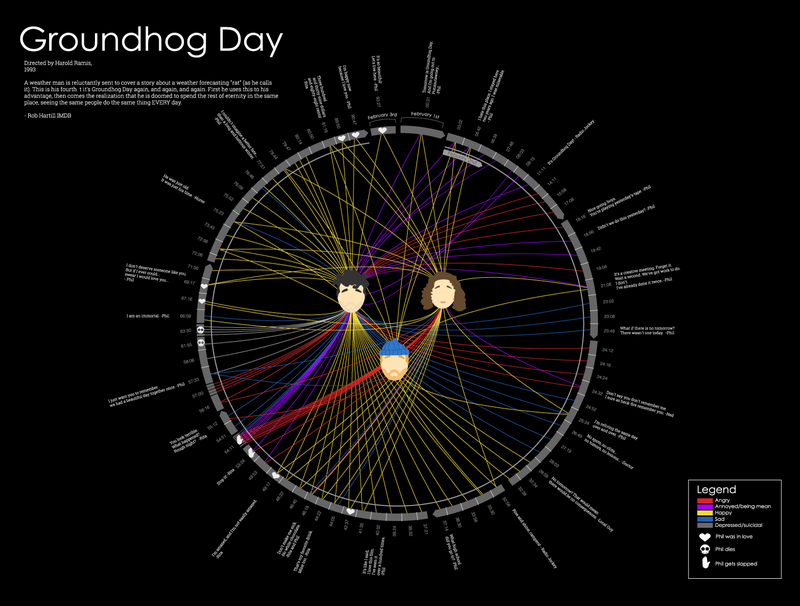 An infographic to represent the movie "Groundhog Day", and all of the time loops it entails. 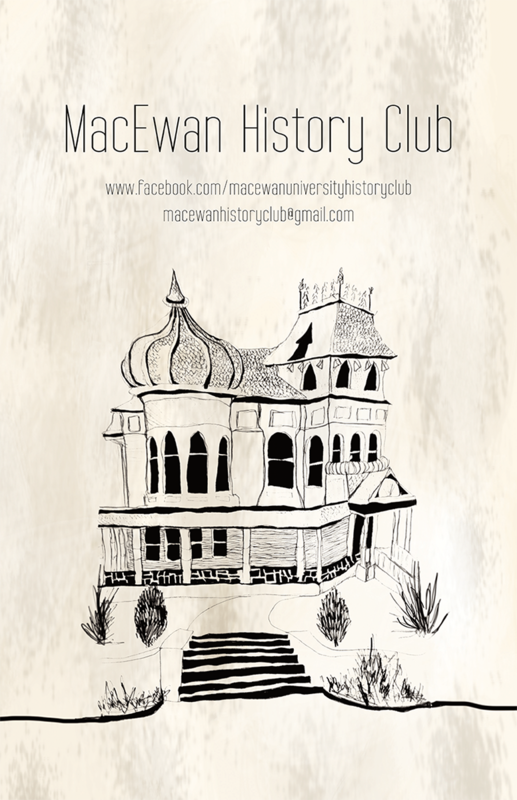 A poster for the MacEwan History club, a new club that came to be this year. 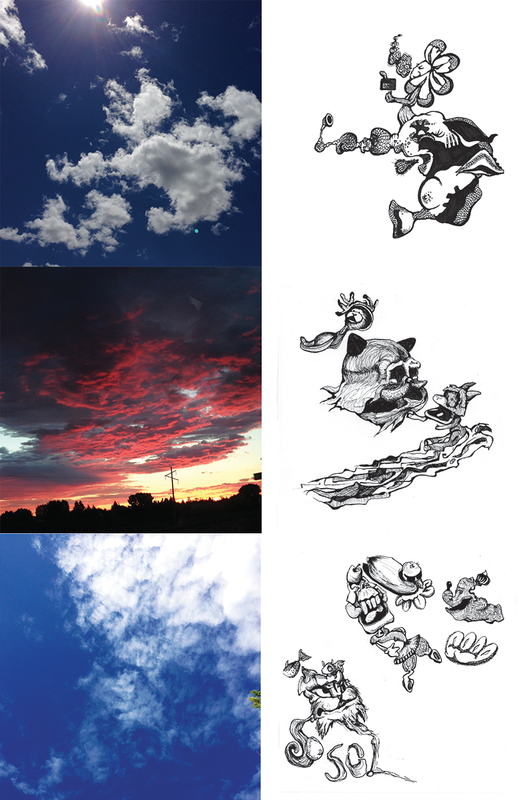 A depiction of what I see in the clouds, what do you see? Hi there! I’m Amanda, an outdoor enthusiast, a dog lover, and ice cream expert! During my three years as a Design Studies student, I’ve used each project as an opportunity to explore everything that great design has to offer; colour, typography, and simplicity to name a few. When I’m not busy being curious about design, I’m most likely heading to the mountains or Barbequing with friends…Fresh air can really spark inspiration, so can a good road trip! Inspiration always seems to come from conversations I’ve been involved in. You can learn so much from someone you’ve only met for 5 minutes. The first time I learnt about reductive design…It was love at first sight. 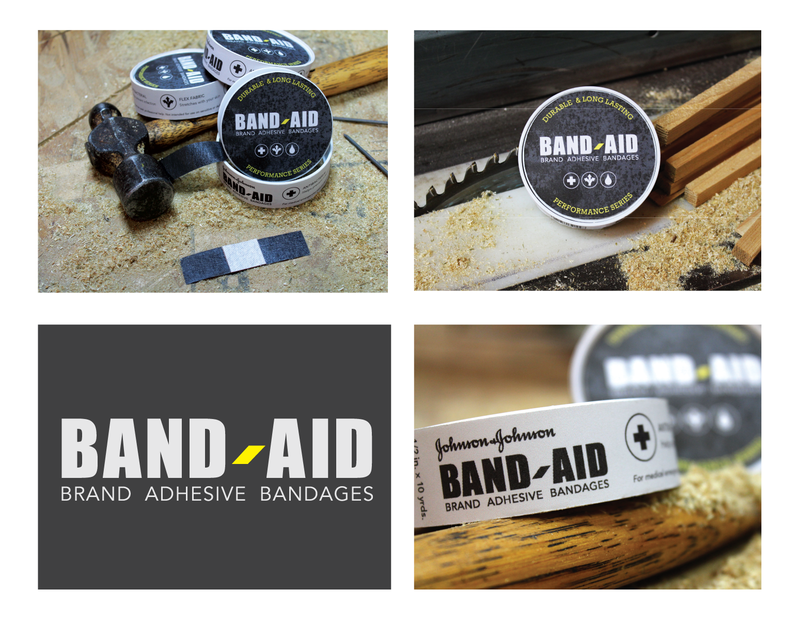 A new logo and packaging was designed for Band Aid Brand, targeting men in the construction industry. 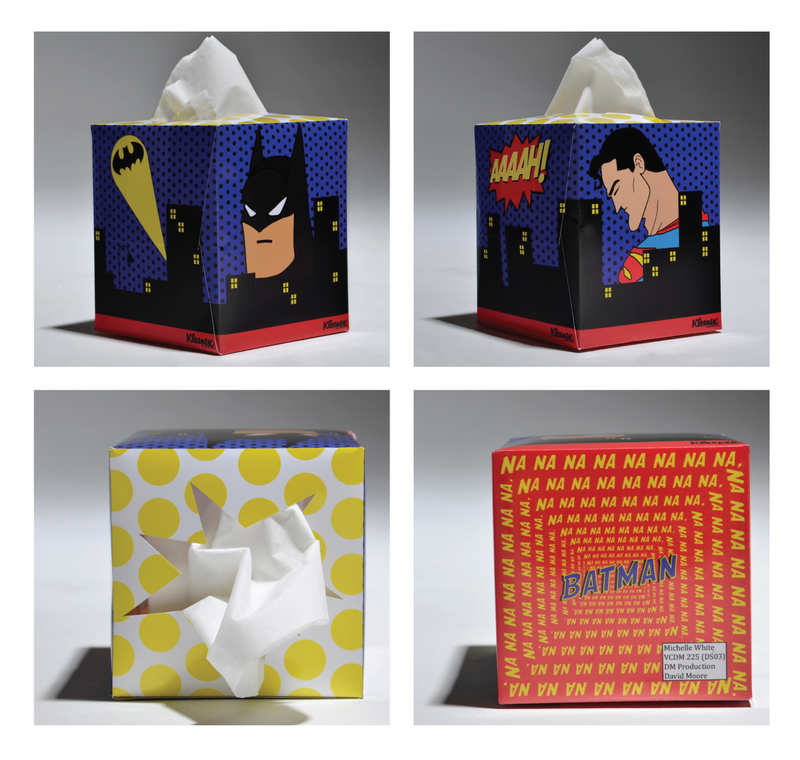 A new design was added to the Kleenex tissue brand, adding some more fun for a large target audience. 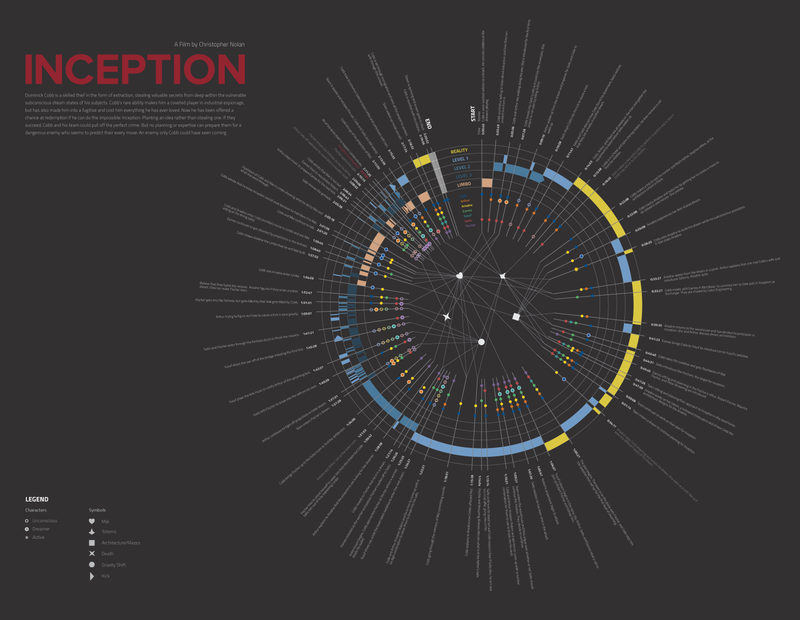 Designed for the film Inception to display key components and multiple layers of information. 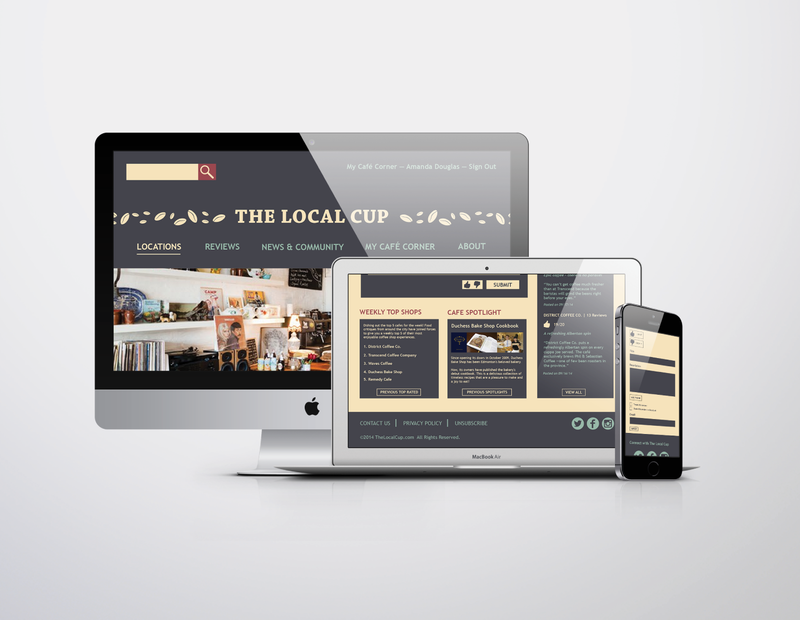 The Local Cup is a consumer rating website dedicated to providing reviews and feedback on local cafes and bakeries around Edmonton. My name is Sarah Duchesneau-Callihoo, and I am passionate about digital media. 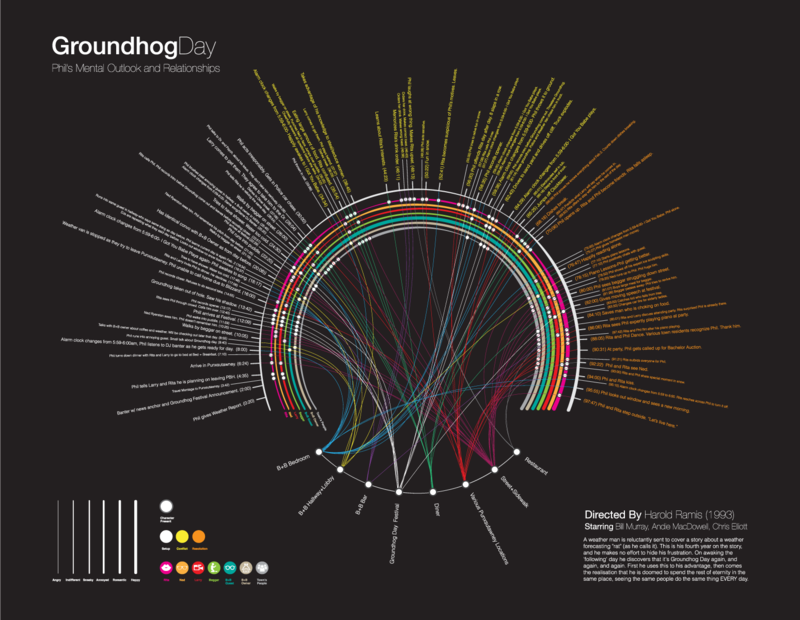 I am interested in everything web based, and strive to create user interfaces that are both engaging and functional. My passion for the online world won’t stop me from exploring print. I am a problem solver and love sudoku as much as I love figuring out how to organize information! I am an avid gamer, and interact with the online world quite a lot. Much of my inspiration comes from there. My first mango was in the Philippines. I began with the best, and now it’s never as good. Thank goodness design can always get better. 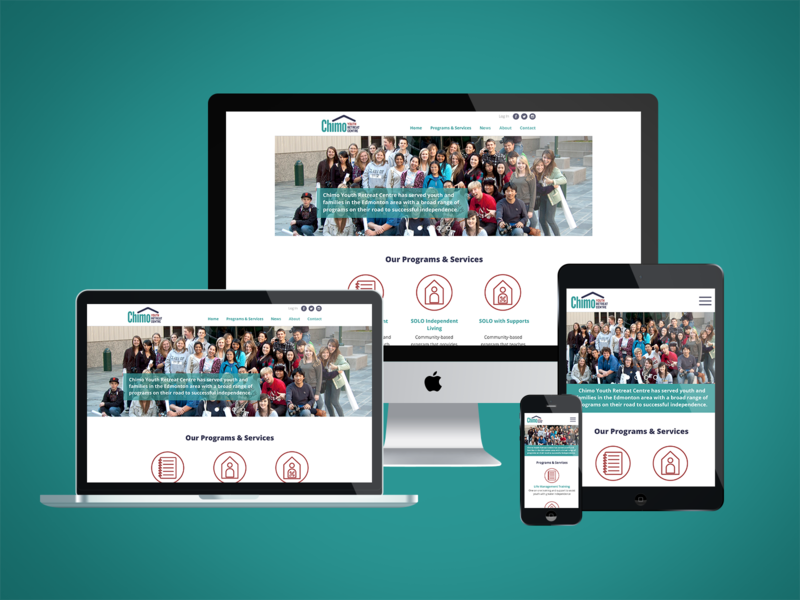 A re-designed, responsive website for the CHIMO Youth Retreat Centre that is geared toward their intended demographic. 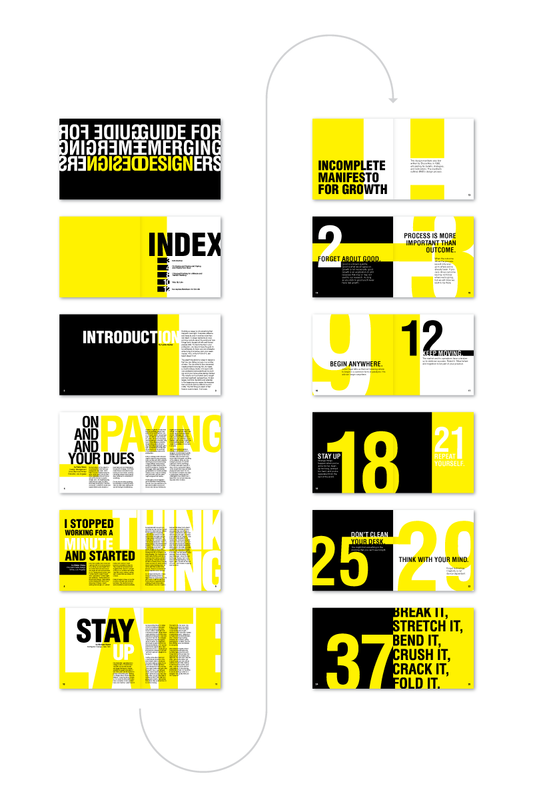 A booklet that explores the use of typography to create a variety of pages within the constraints of limited colour and a single typeface. A Kleenex box cover that features a totem pole pattern and pop out wings. 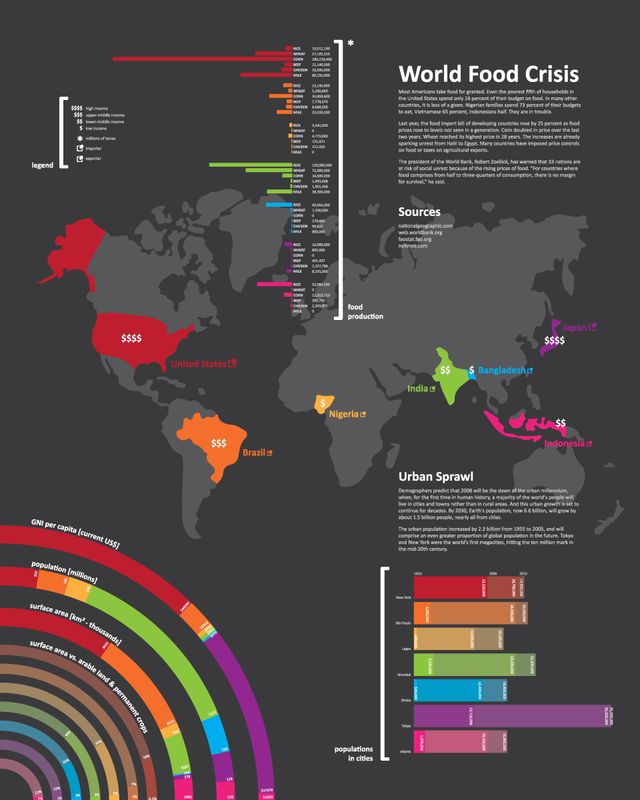 An infographic to bring awareness about the world hunger issue and how different countries compare. I was born in Oxford and grew up on a small family farm in Southern Manitoba. Before MacEwan, I completed my MA in English & Film Studies at the University of Alberta. When I’m not hunched over my desk, I can usually be found volunteering with the Society of Northern Alberta Print Artists, DJing at CJSR, or passing motorists on my bicycle. I fooled everyone into thinking it wasn’t. 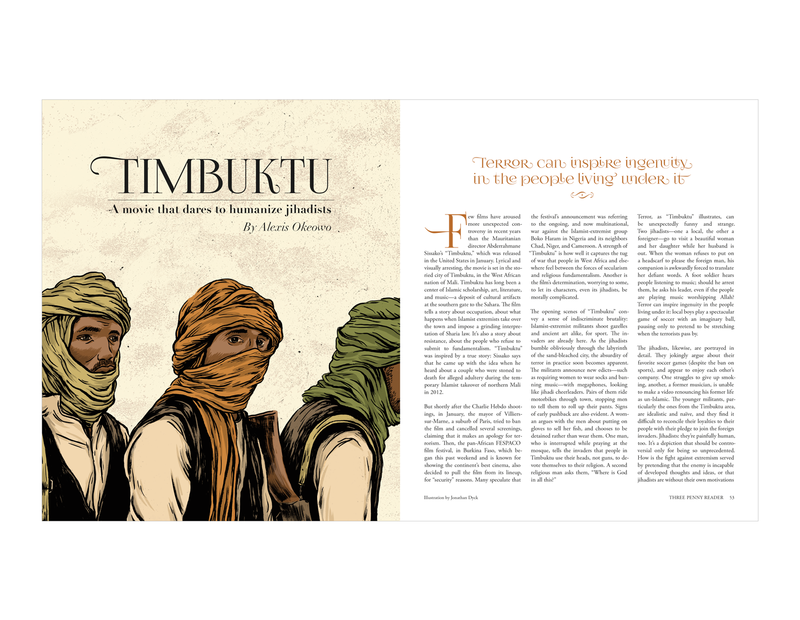 Editorial illustration and layout for a review of the film, Timbuktu. 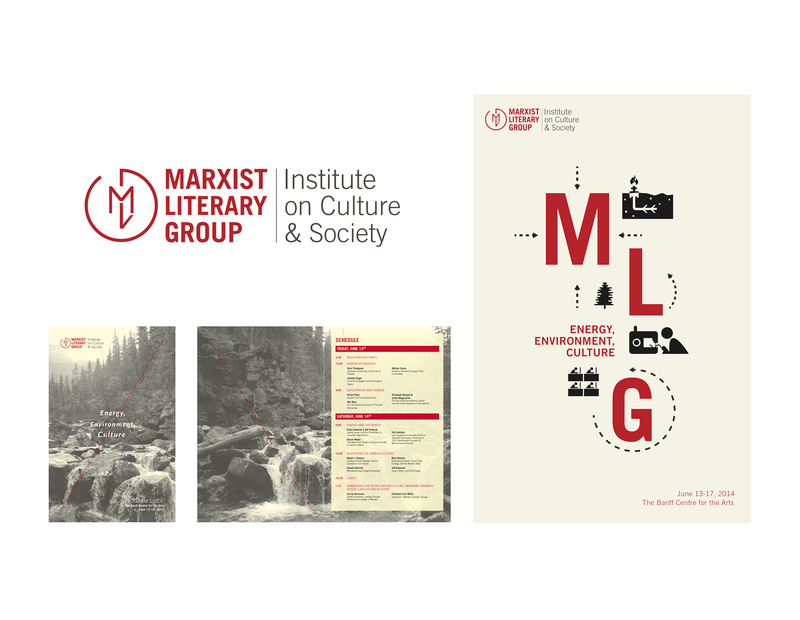 Logo design for MLG and conference package design for their annual Institute on Culture & Society, which focused on the theme, "Environment, Energy, Culture." 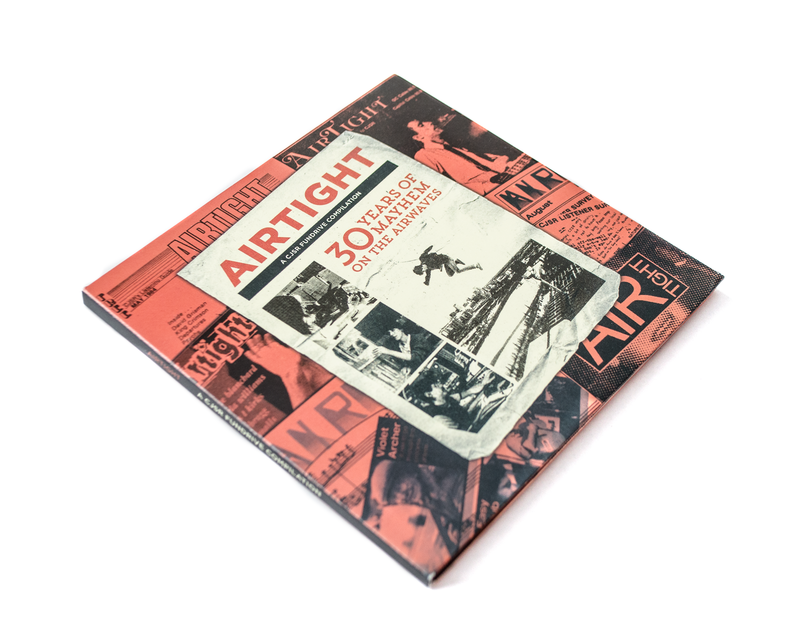 Packaging design for "Airtight," CJSR’s 30th anniversary CD compilation, featuring images from its publication archive. 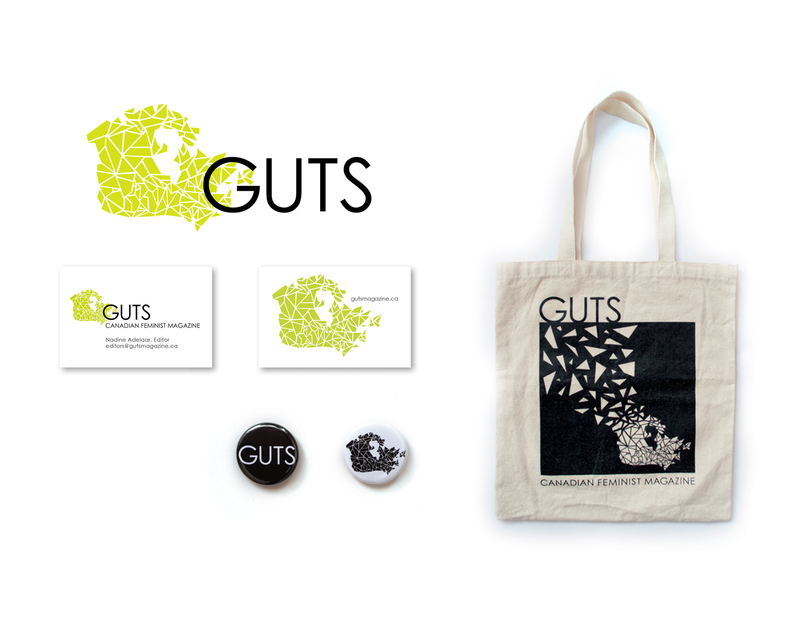 Logo design and identity applications for GUTS Canadian Feminist Magazine. My name is Marina Eastwood and I am a young illustrator and website designer currently living in my hometown Edmonton, Alberta. I’m always looking for new ways to create and be inspired. I like taking hikes with my dog, drinking tea, seeing movies, reading and sleeping in on the weekends. My favourite medium is watercolour; I just love putting it down on paper and seeing the organic shapes it creates come to life. I draw inspiration from my dreams. I’ll go to sleep with the question and wake up with a beautiful answer. The first time I used acrylic paint (aside from in elementary school) I ended up getting paint on way more than just the canvas. 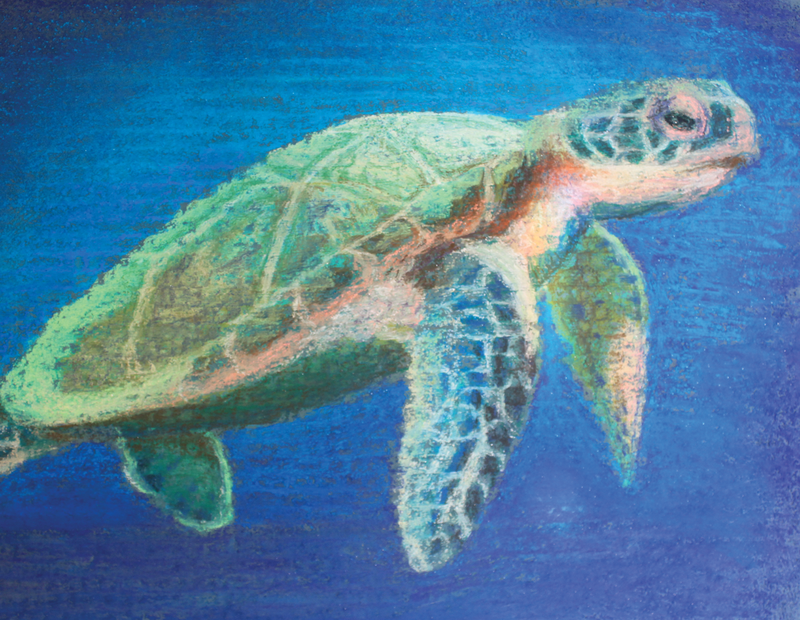 A painting of a sea-turtle using soft pastels. 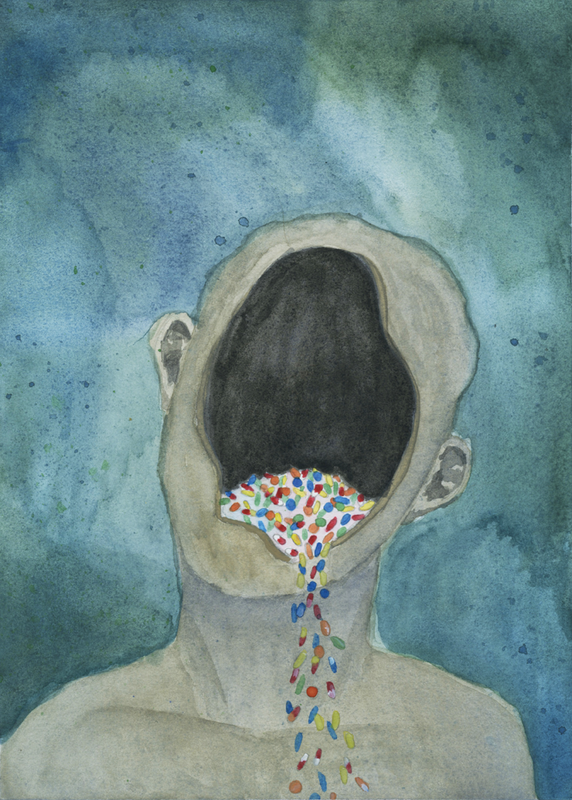 An editorial illustration to accompany an article about prescription drug abuse using watercolours. 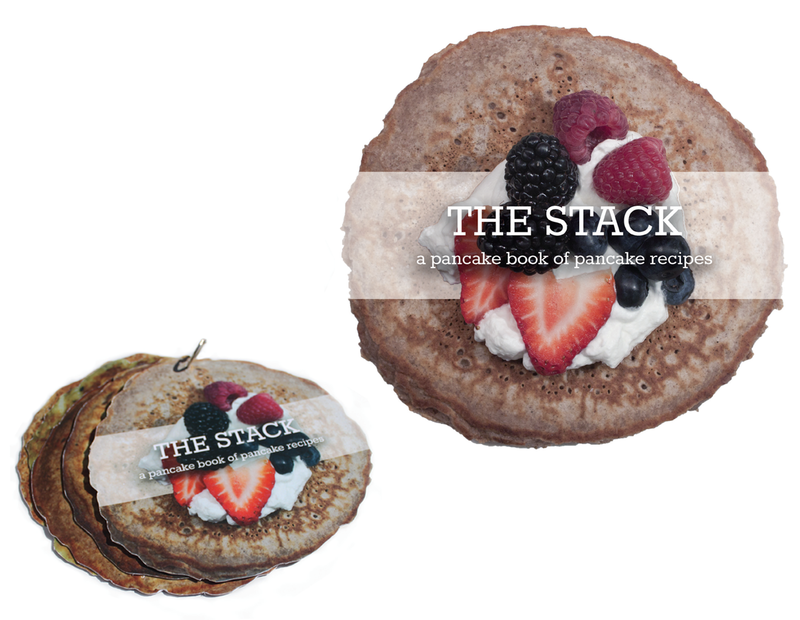 A cookbook featuring pancake recipes in the shape of a stack of pancakes. 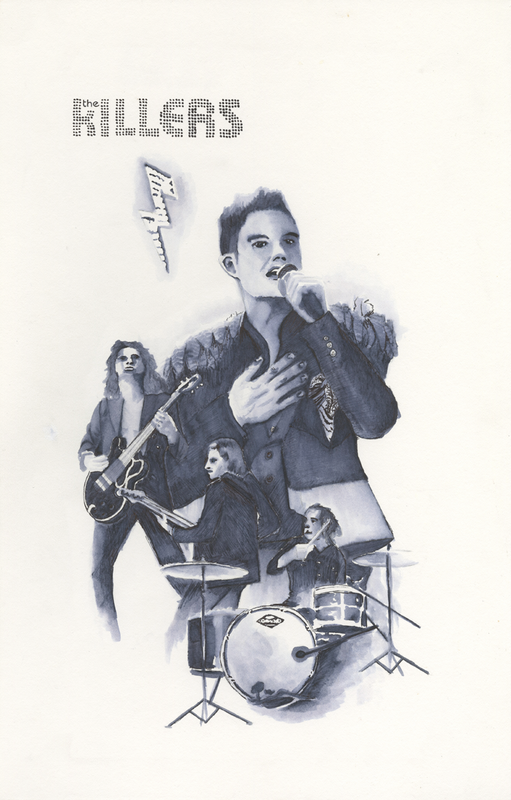 A composition poster for the band The Killers in ink wash.
Born and raised in the prairies of Alberta, my appreciation for design developed at a young age. During these years, I devoted much of my time to art classes and activities that allowed me to expand my creativity. Today I am looking forward to using the many skills I have developed at MacEwan in whatever opportunities may appear in my future. I also enjoy biking, swimming, and reading. And caffeine. The atmosphere of the late evening is what brings me inspiration. The stars...the cool air...Carpe Noctem! The first time I knew I wanted to be a designer was in Grade 6. I spent more time designing projects in PowerPoint than on finding sources. 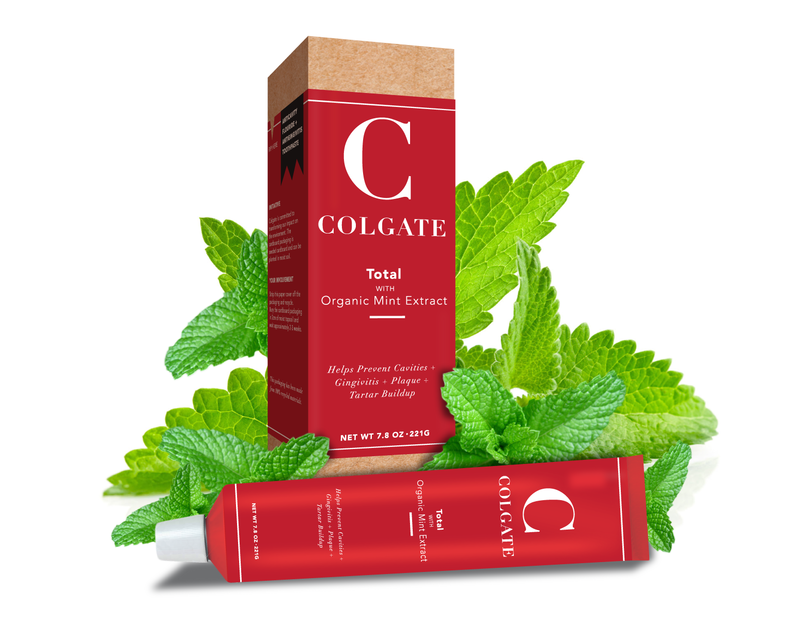 The objective of this project was to redesign the identity and packaging of Colgate Total to appeal to the Millennial demographic. 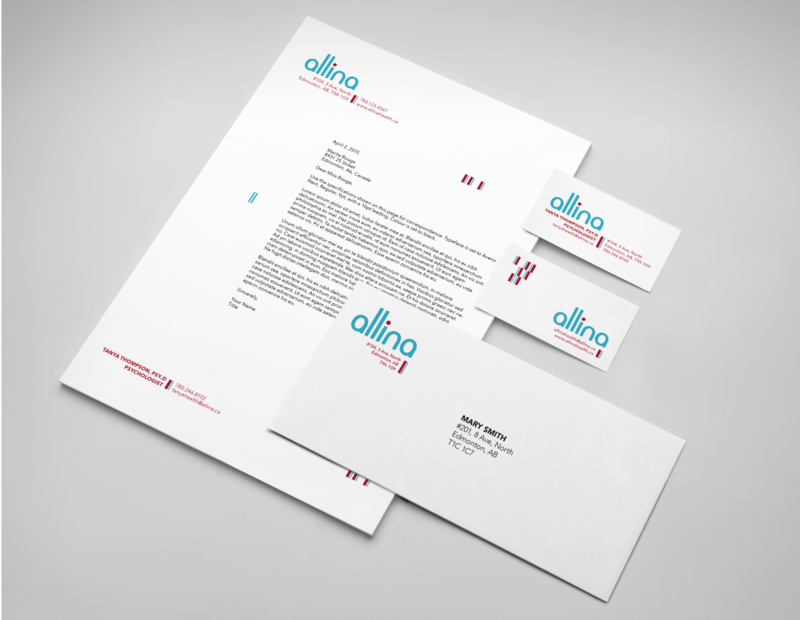 The objective of this project was to design a wordmark and a corresponding identity system for Allina, a private healthcare company. 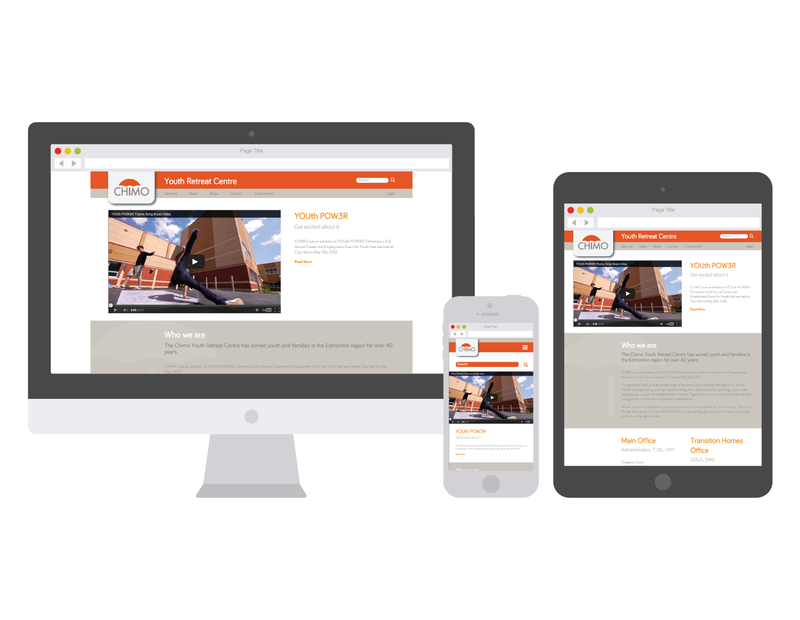 The objective of this project was to research Calgary Outlink's audience and redesign their site to effectively serve their target audience. 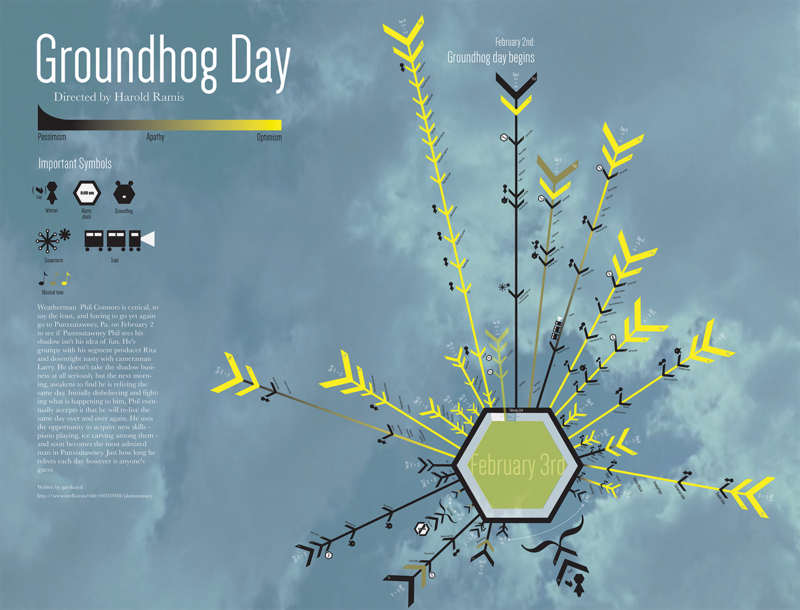 The objective of this project was to design a timeline that communicates both macro and micro concepts/events from the film Groundhog Day. Not much to tell, I enjoy illustrating, tattoos, shooting at the range, and learning new languages. This all tends to influence my creative style and method. I’m often characterized as someone who is blunt, has a sarcastic sense of humour, and works well under pressure. All in all, pretty much what you see is what you get. Tattoos, long walks through the woods, social media, current events. The first project in this course was gruelling and long but prepared me for the next three years in this program and for that I am grateful. 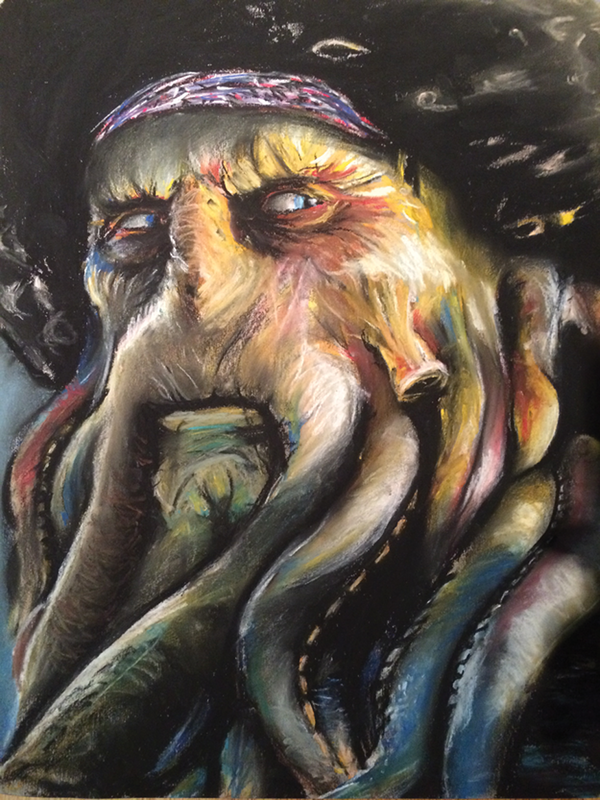 Portrait of Davey Jones from the Pirates of the Caribbean film series. 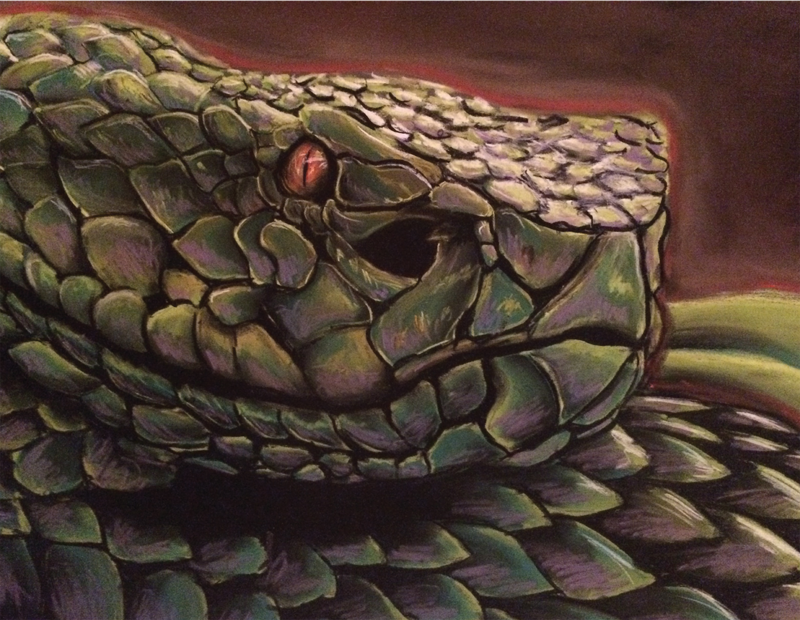 Portrait of a green viper. 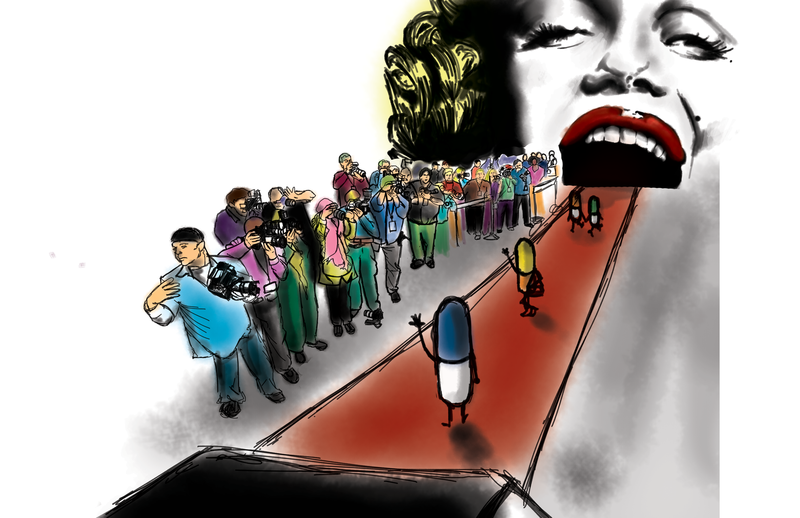 An illustration done for an article on the overdoses of celebrities via prescription drugs. An Edmonton born creative, with a hint of Hawaiian roots and a hustle like you’ve never seen. I’m in love with creative minds and the art of unspoken emotion. I believe that beauty lies in simplicity and that dreams are better in black & white. I also believe that any combination involving bacon and whiskey are basic guidelines to a successful life. I spend my days interacting with people in search of genuine emotion to hold moments of honesty and authenticity. I understand that life is the longest thing I will experience, and that every moment deserves to be remembered. People inspire me. You, and me, and us, and everyone. Her thoughts and his thoughts. They all connect and they all matter. Sunny July afternoon. Palms were sweaty, breaths were short. I stared right at it and jumped on. Pedal, crash, and Tony’s truck was toast. A portrait series expressing the theme of “My mother told me…” When I was young, my mother told me to never play with my food. A self-directed final project expressing human emotion through a visual narrative targeted towards a contemporary fine art audience. A self-promotion poster project was given to help us grow stronger and focus on how we want the world to view us, as a person and as a creative. 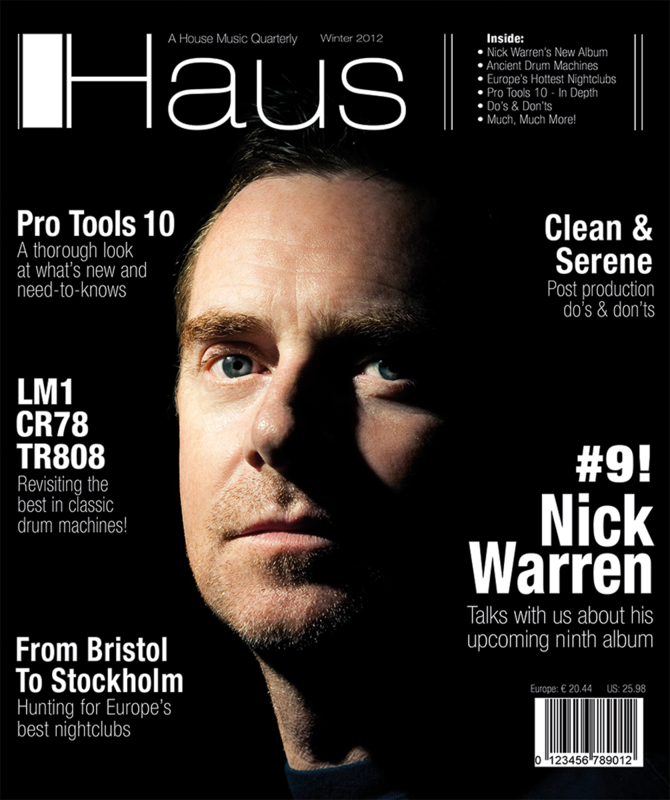 This cover was produced for the cover of a high-end international magazine. 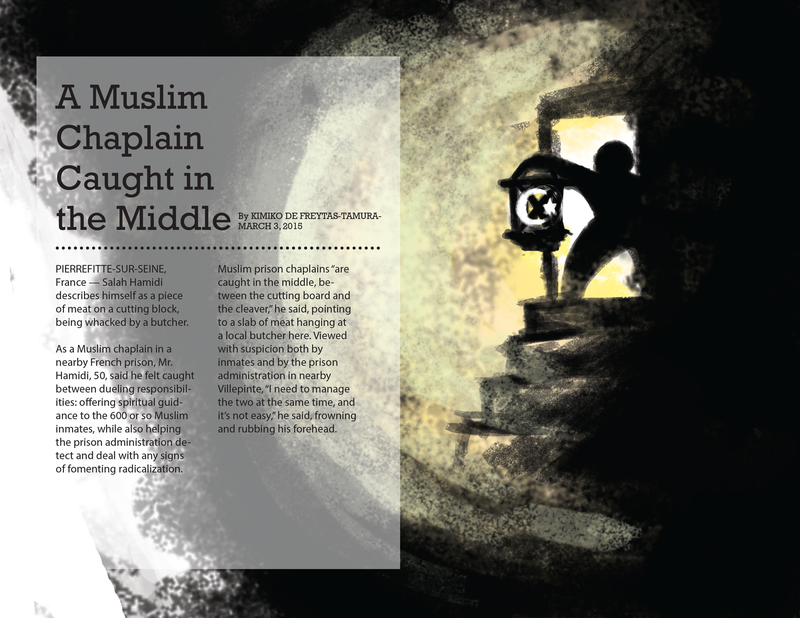 It also included layout design, which mimicked the magazine’s design aesthetic. I see my self as a fun, expressive, and social person and I enjoy using my photography skills to capture artistic visions and capture moments of happiness. I enjoy shooting fashion and product but am open to photograph any thing. Im the type of person who always loves a challenge and lives to learn new things with every experience I have. From my experience with traditional arts background to come up with unique concepts & getting inspiration from the simple things around me. At the age of about 15 and received my first DSLR for christmas, I had officially fallen in love with photography since. Image representing the product being a luxury gold flake chocolate, where the image is on the inside of the box. 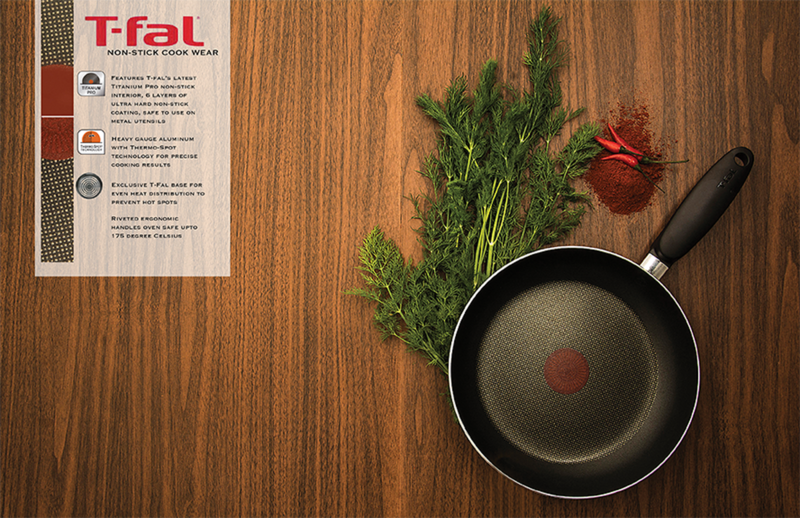 Magazine layout outlining a high tech product, t-fal cook-wear. 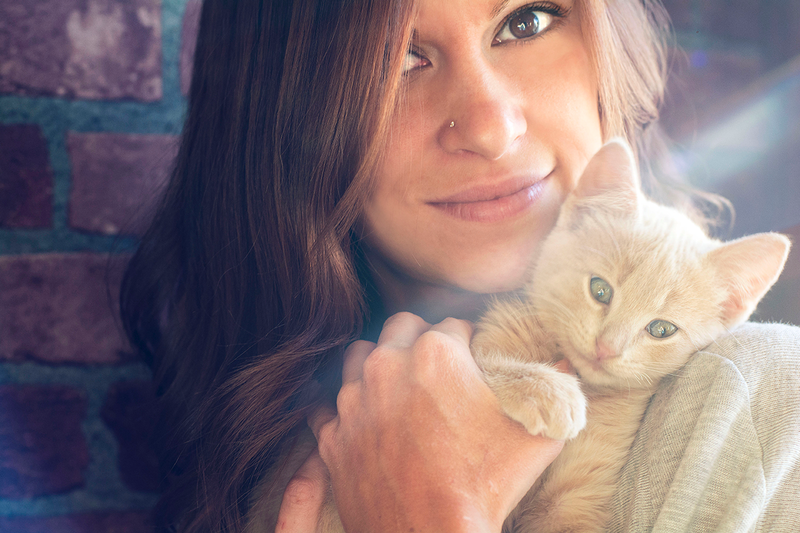 Image was part of a series about adopting cats and they life style of owning a cat. 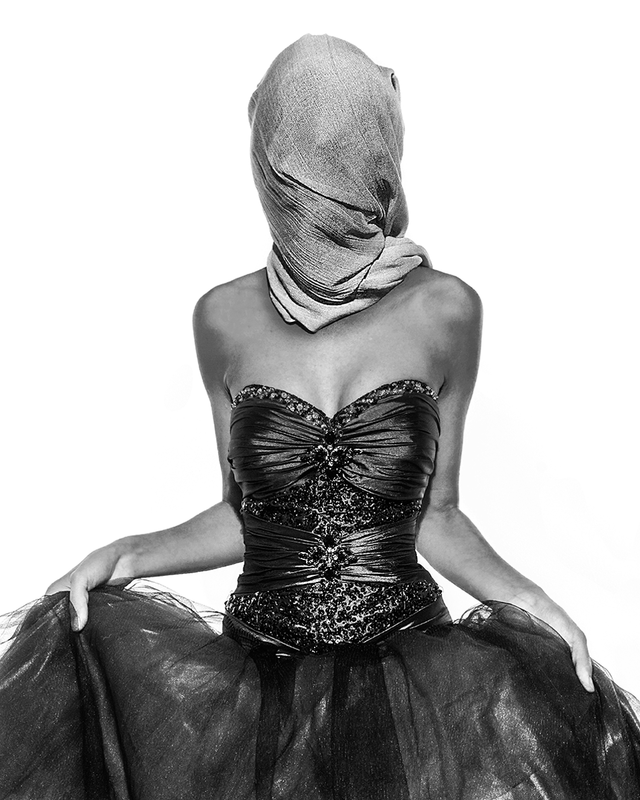 Image was inspired by Irving Penn, as we needed to create images in our researched photographers style. I grew up wanting to be a ballerina; I admired the way that ballerinas could create something beautiful out of nothing. When I first put on the little pink leotard, however, my rose coloured glass quickly faded and I gave up on that dream. But my love for making things beautiful stayed with me. I love traveling and experiencing new things, especially if those things are new restaurants and coffee shops. When I’m not designing you’ll catch me honing my hand lettering skills, going for walks in the sunshine, or day dreaming about all the trips I’ll take someday. Good food, good beer, and good friends. My first time was sloppy, exhilarating, colourful, and freeing. The first day I ever painted was the first day my life really began. 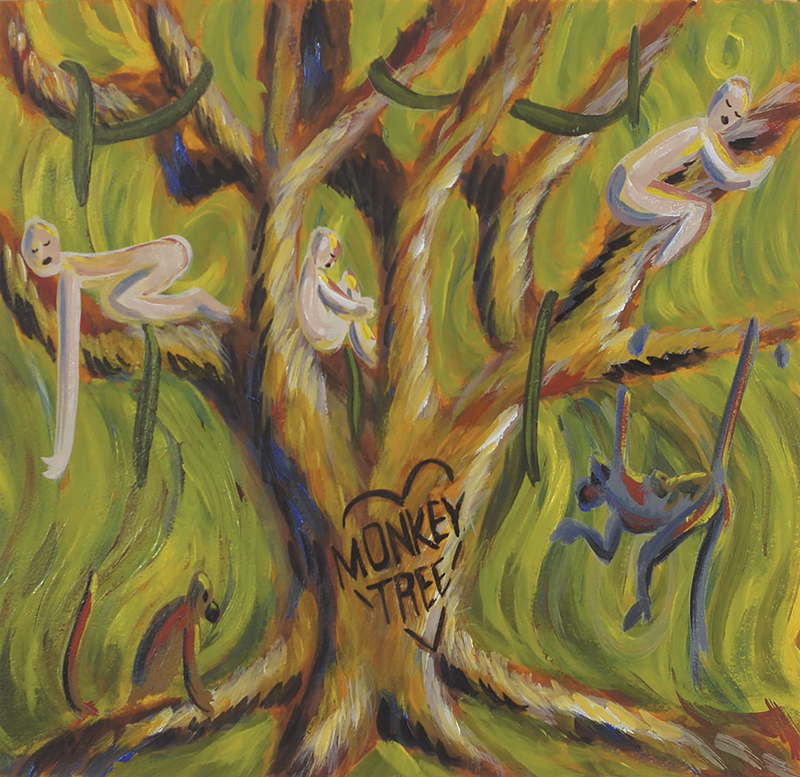 An interpretation of the song "Monkey Tree" by the band Mother Mother. 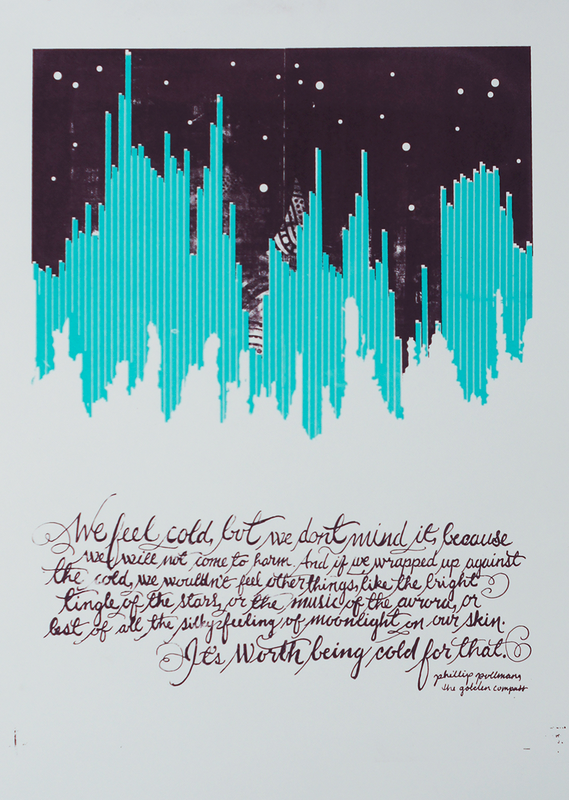 A poster designed for the Design Students Organization, highlighting the beauty of our winter city. 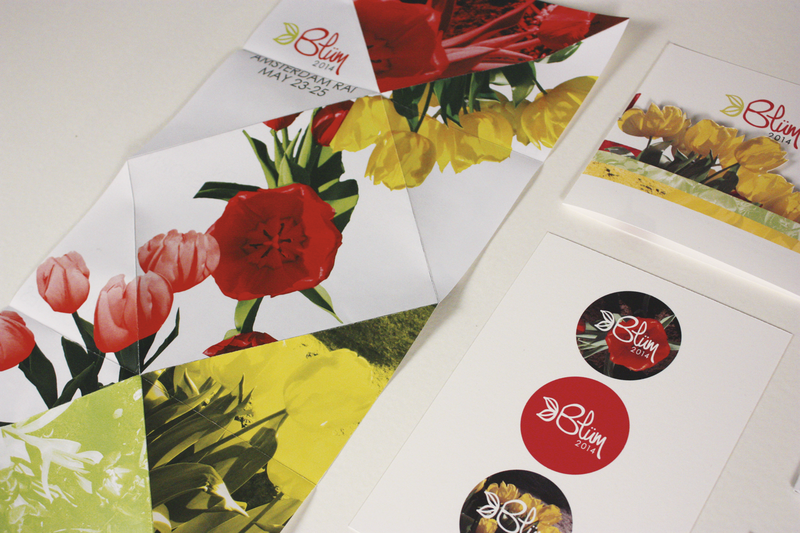 Designs for a fictional tulip conference in Amsterdam. 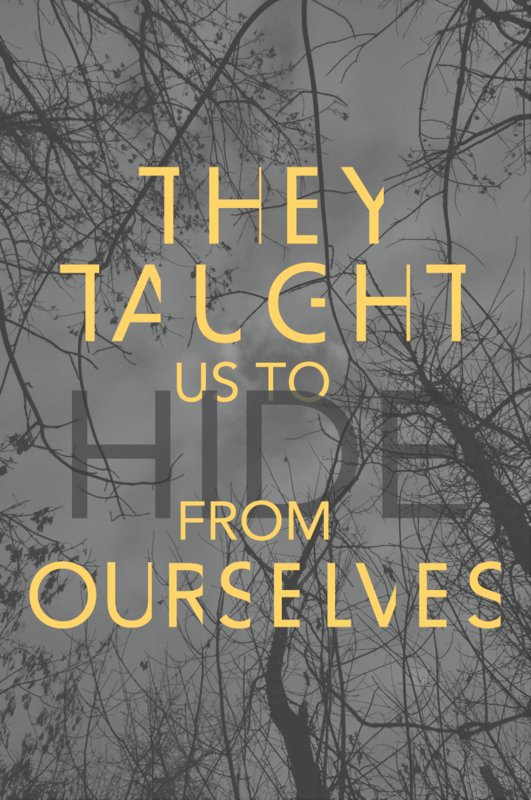 The second instalment in a series of three posters created to promote the book "Indian Horse." I was born in Warsaw, Poland and immigrated to Canada when I was two. 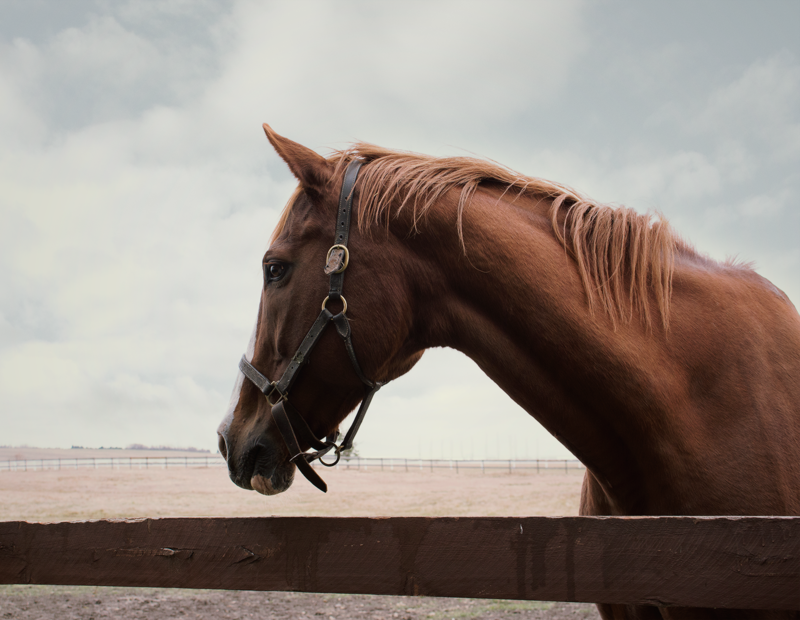 I enjoy being surrounded by nature and I have a passion for landscape and equestrian photography. I have been riding horses for more than 15 years; attending horse shows was what started my interest in photography and making a career out of it. 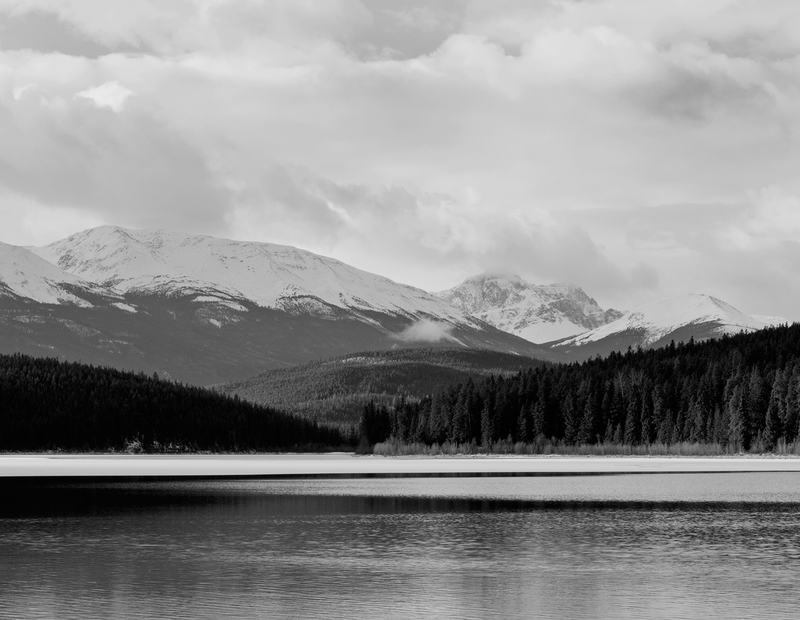 Most of my inspiration comes from travel and viewing the natural world. Also, reading books and watching certain movies influence too. The first time I shot a horse show with my DSLR camera was just terrible. Too much rain and couldn’t get the right focus to save my life! On a farm in Leduc County. A park in the West end. My name is Shelby and I am passionate about illustration and design. All my life I have been creative through art and design classes and I knew then that my career would involve being creative in some way. Design enables me to use my skills in illustration, layout, type, and conceptual thinking to solve the problems of others. I am always willing to grow my skill set and try new techniques to become better in my field. If you want to know more about me, I also love to create surface design and take photographs. I find inspiration through my experiences travelling, whether it is on a road trip or to another country. My first experience with design was in high school when I started silkscreening. It was troubling at first, but then I fell in love with it. 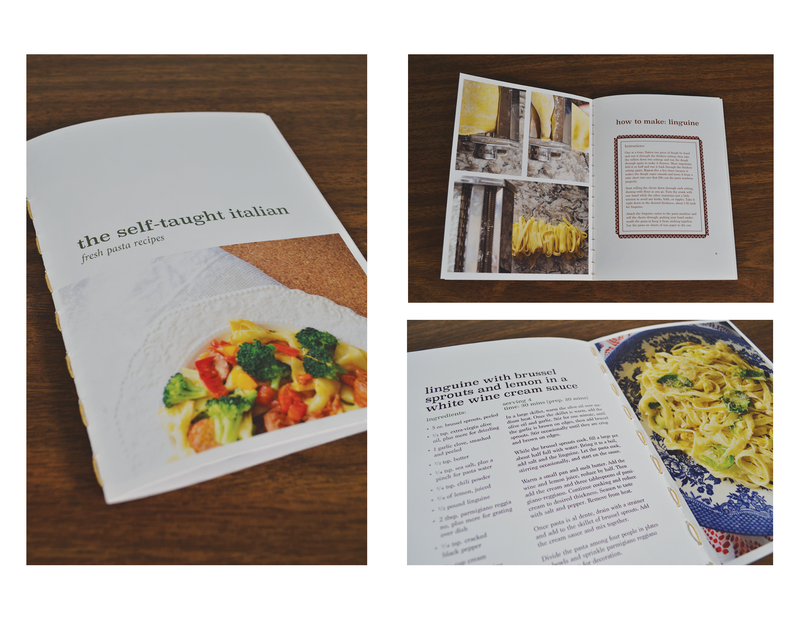 A cookbook on how to make Italian pasta and dishes with fresh ingredients. The book includes a list of tools, pasta techniques, and recipes. 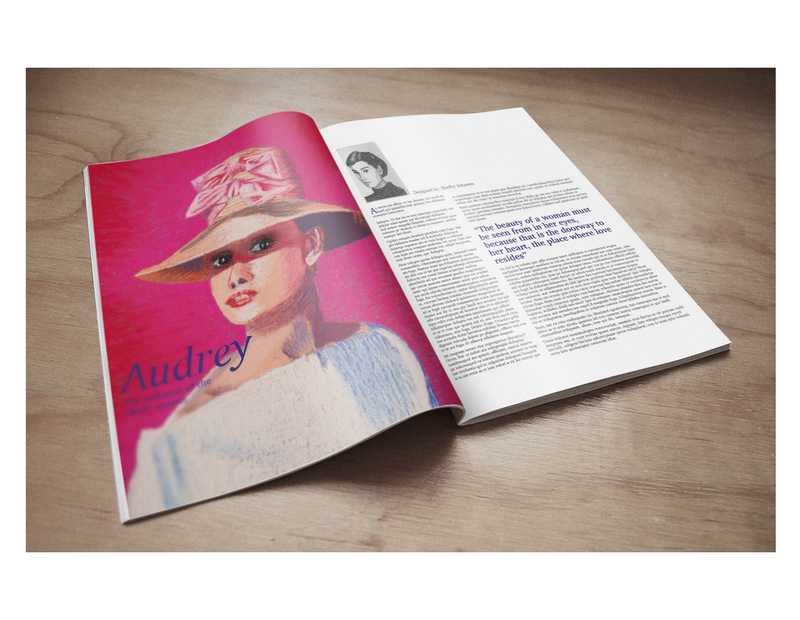 A magazine spread incorporating two Audrey Hepburn illustrations, one pastel and one graphite. 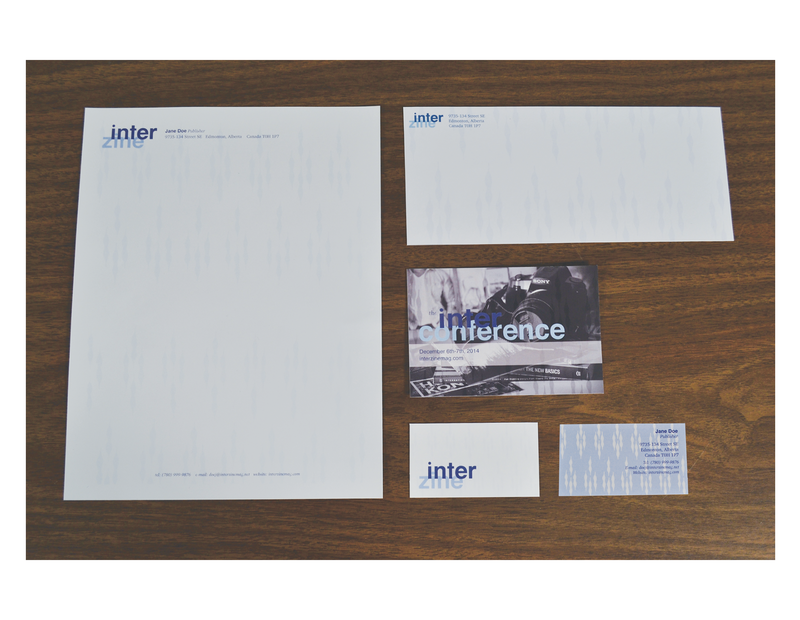 Corporate stationary for a fictitious online design magazine that caters to all fields of design. 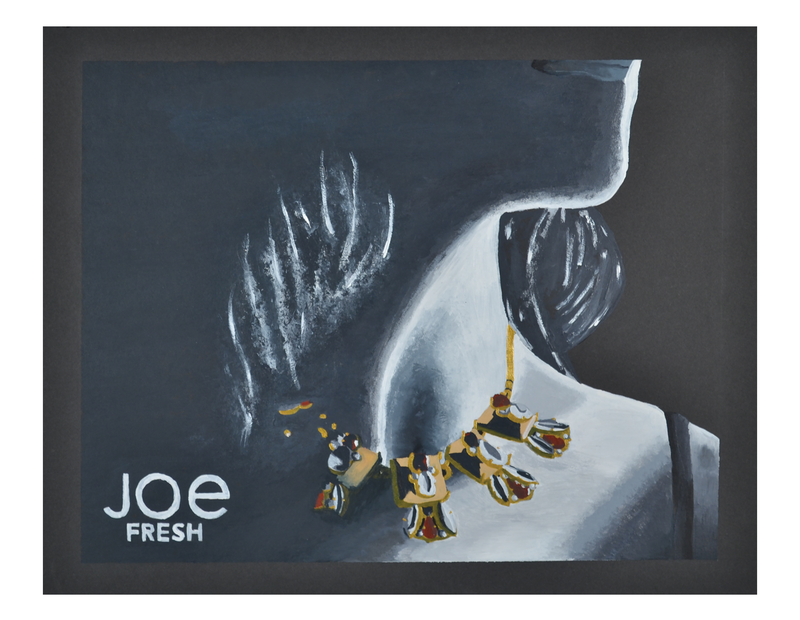 An ad for jewelry included in the fashion line of Joe Fresh. My name is Shireen Keith. I’m a recent graduate from Grant MacEwan University, majoring in Digital Media. I was born and raised in Edmonton, Alberta. Design is my passion; bugs are my weakness, yet the outdoors and traveling are my interest and inspiration. Creating and designing is what I love to do and when I’m not doing that, you can usually find me having a cold beer with friends at a local pub. 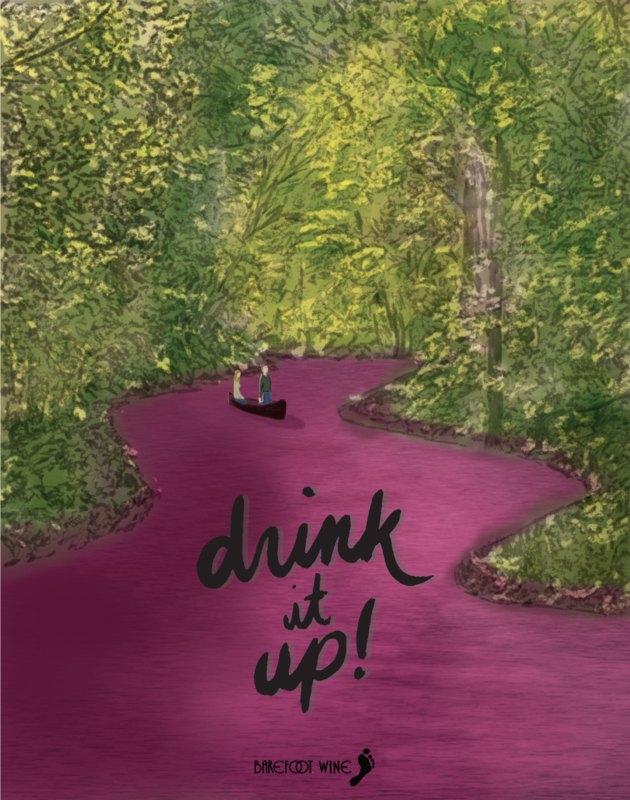 Many times I draw inspiration from the bottom of a wine bottle. I was pretty nervous, I had to do some researching, but 3 years ago I finally decided I was ready. MacEwan turned out to be a great choice! 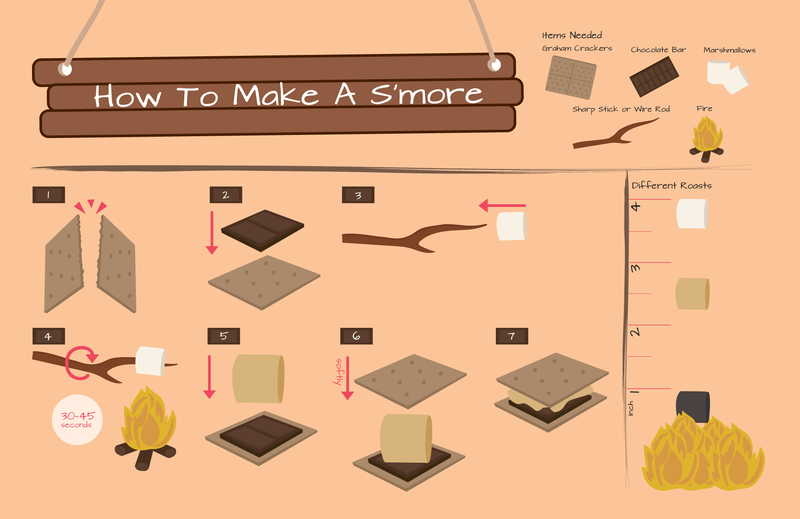 An info graphic that visually explains (with as little words as possible) how to make a s’more. 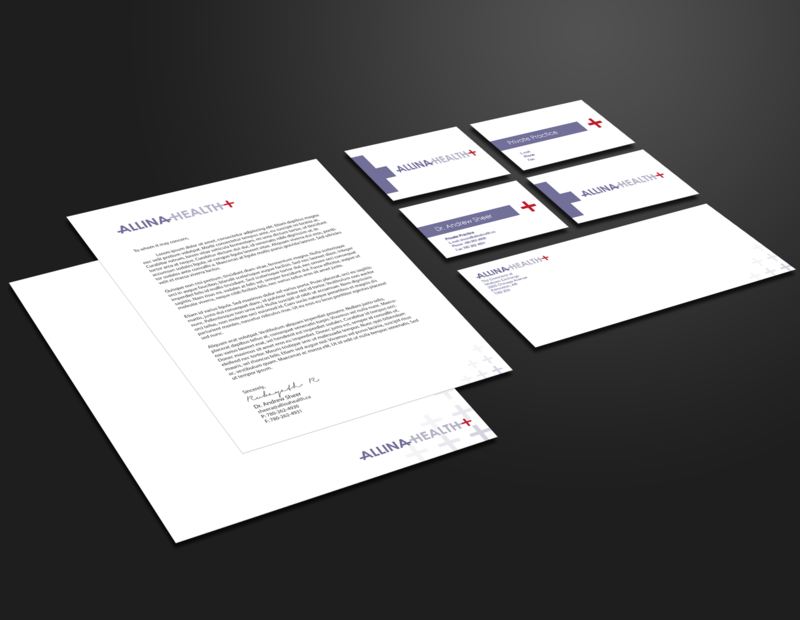 A group project that involved researching a local non-profit organization and re-branding their existing identity. Watching the film Run Lola Run and collecting information to create a visually interesting representation of the information we had gathered. 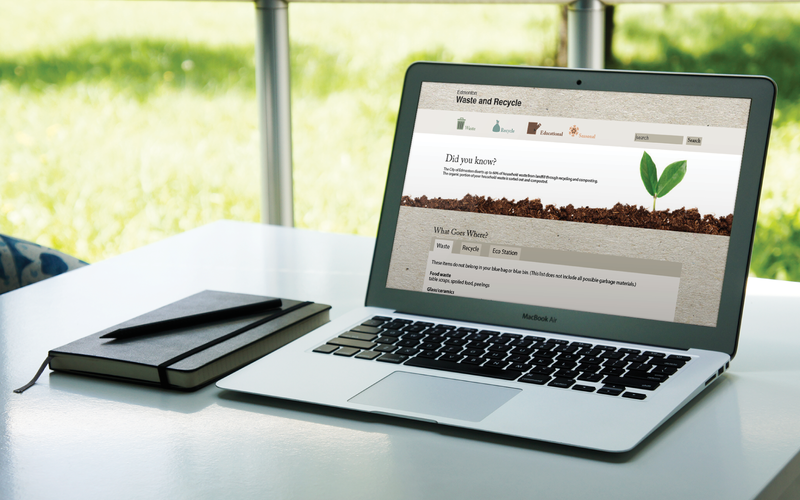 Taking existing information from the City of Edmonton website for Waste and Recycle and creating a new look for this section of the website. Well here’s a bit about me: I’m an outgoing, fun-seeking kind of girl who looks for the humour in every situation! Although independent, I also enjoy working collaboratively on a variety of projects where we can have a couple laughs along the way. My design style varies from project to project as goals and objectives also change from one to the next; but overall I aim to create clean, organized work that still got a punch of personality. As I venture into the real world I aspire to keep growing as a designer and jump on opportunities as they come. Honestly, everything around me! Every person, place, or thing offers something inspiring in its own unique way. I don’t always rip my dress, but when I do I make sure to flash the entire office. Although it’s my first, I know I’m not the only one. 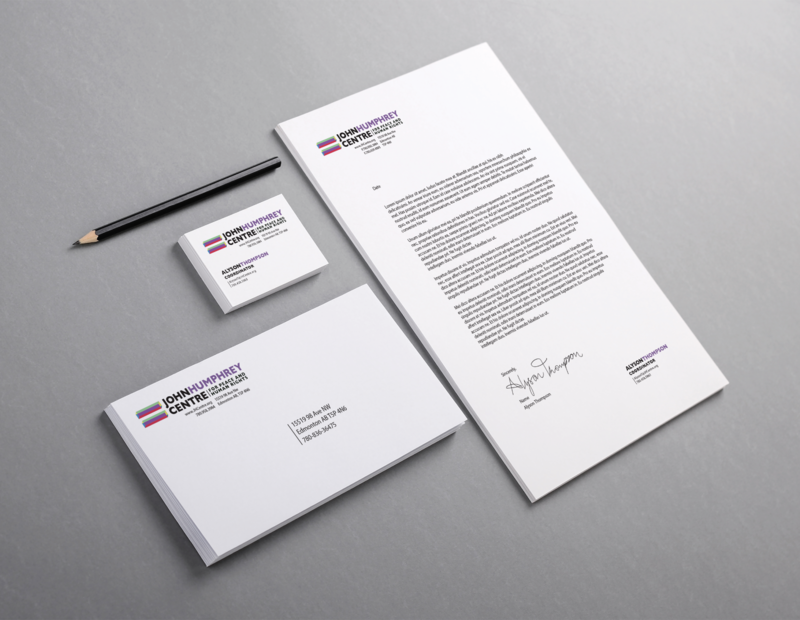 This project’s objective was to create an identity for a large medical organization and apply it to stationary and business cards. 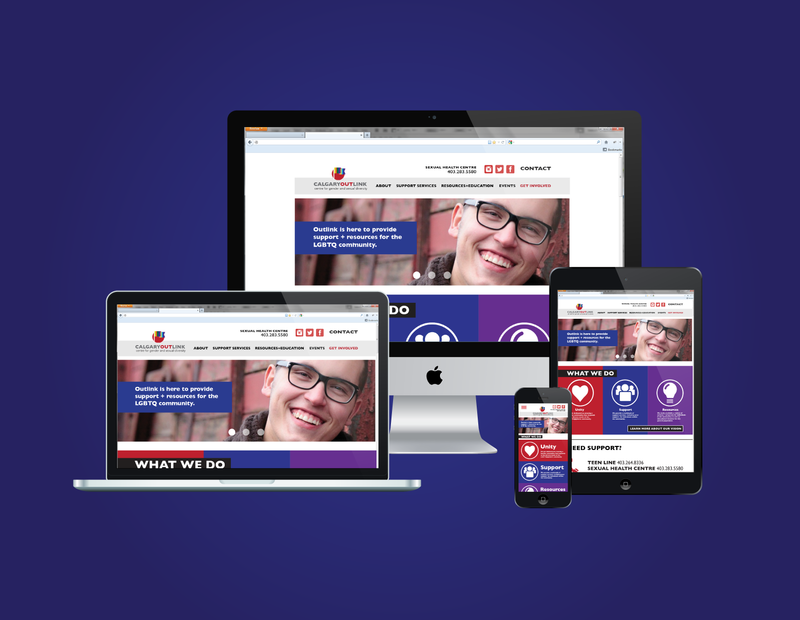 For this project we designed and coded a responsive site for The Chimo Youth Retreat Centre, an outreach source for struggling youth. 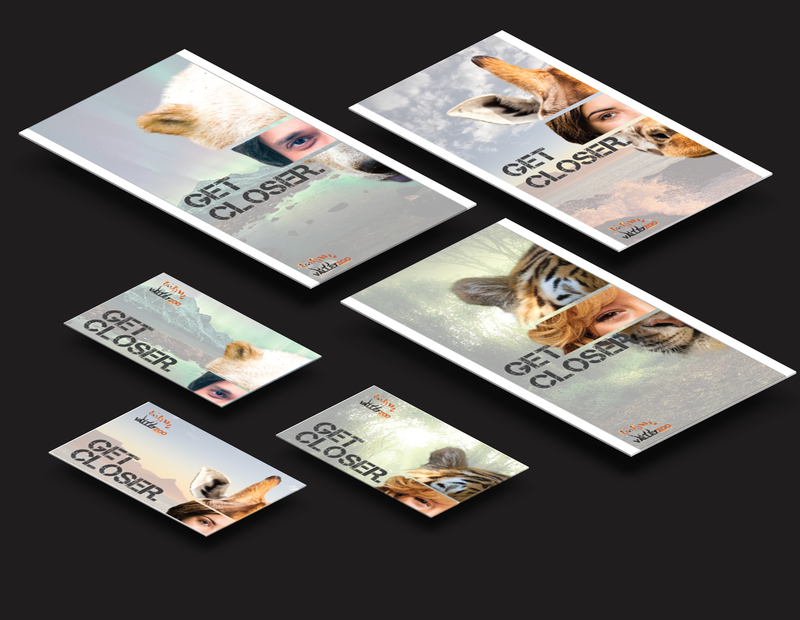 In this assignment, we created a campaign series and applied it to multiple promotional pieces such as street banners and gift cards. 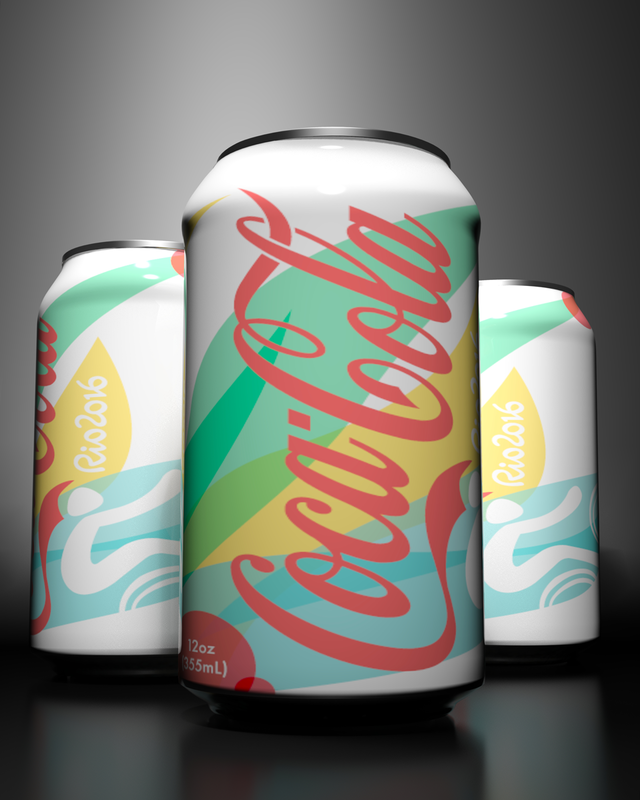 Using a combination of Maya and Photoshop we digitally rendered a pop can and designed the graphics to be applied to the item. Hi! I’m Madison. I am a photographer, designer, and probably your BFF. I love telling stories, surrounding myself with love, and eating delicious food. I am also rendered almost completely useless whenever I see any sort of animal, baby or otherwise. Some of my role models include, but are not limited to, my parents, Annie Leibovitz, Wonder Woman, and Beyoncé. I find people inspiring. We all come from such different places and I love learning what makes us all unique. It was what you would expect: messy, fleeting, and ultimately unsatisfying. You never forget your first time with Chicken McNuggets. A lifestyle shot for a commercial product campaign. 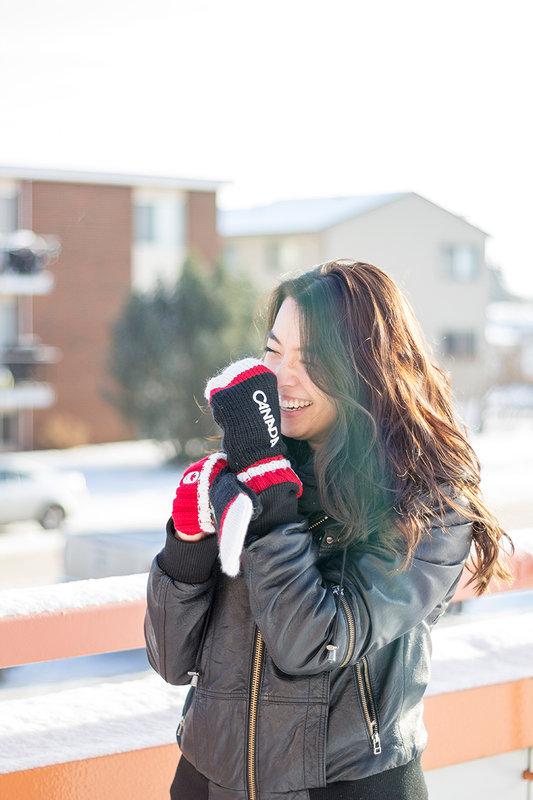 The product being displayed is The Hudson’s Bay Red Olympic Mittens. A lifestyle shot to accompany a food magazine spread. The article was about the comforts of cinnamon cake. 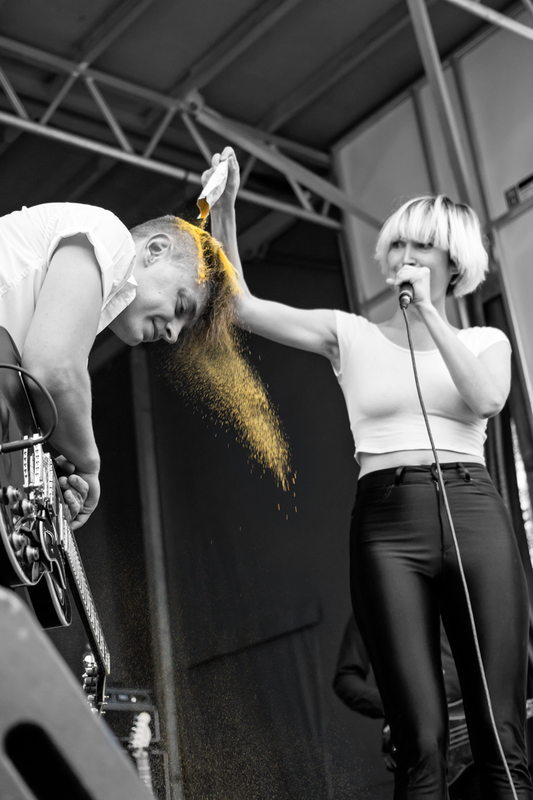 Shot while on assignment for MacEwan’s paper, The Griff, July Talk got a little cheesy during their performance at MacEwan’s Fall Fest. A poster for a fictional solo show of my design work. The assignment was meant to display all of the things that fit in to your design personality. My name is Danielle Kovacic. I am a graphic designer who thrives off of challenges, and loves to experiment with new ideas in hopes of creating designs that deviate from the normal, are distinctive and unique. I draw as much inspiration from the present as the past in hopes to create work that is shocking, memorable and engaging to others. I am passionate about history, physical activity and health, fashion, coffee and sewing. Alike many individuals, I draw a lot of inspiration from my family and friends, especially if there is wine present. My wonderful (& patient!) family & friends have been my true source of inspiration. As well, anything weird, dark, and macabre inspires me. The first time i realized that i would have to be coding html/css, I was scared for my life. Now, I can put that fear to rest! Hey, my name is Nathan Labrecque and I’m a designer, musician, and wordsmith with a passion for any and all forms of creative expression. From my humble beginnings as a soft-spoken youngster who best expressed himself through pencil, paper, and hitting things with sticks, I have since honed my skills and expanded my horizons to the tantalizingly technological yet terribly tumultuous world of digital media, graphic design, and alliteration. 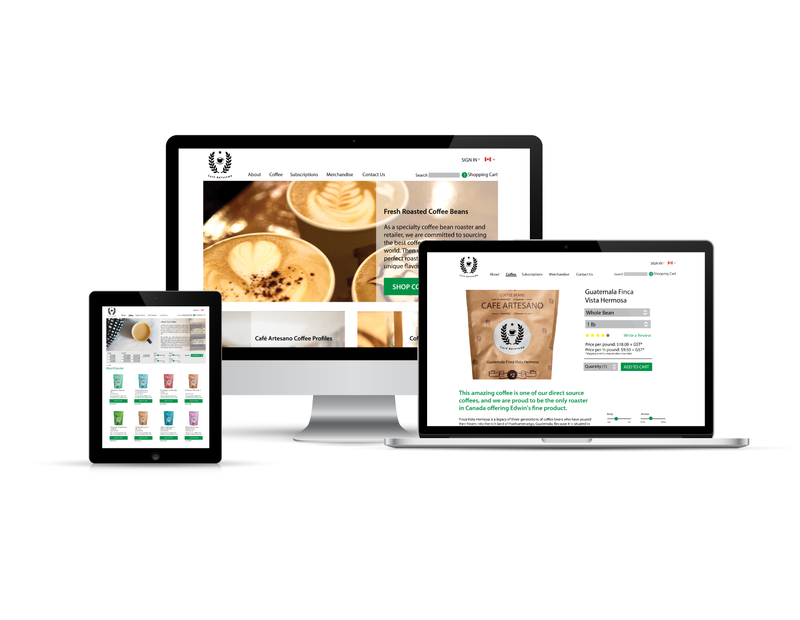 Whether it be designing and building a website or formulating a funky drum groove, I love the challenge of creating something completely original. My primary source of inspiration comes from the world of music, most significantly the progressive rock and metal genres. Magical. Sweat glistened on my forehead and I trembled slightly as I grasped the smooth wood in my hands…the first time I played the drums. 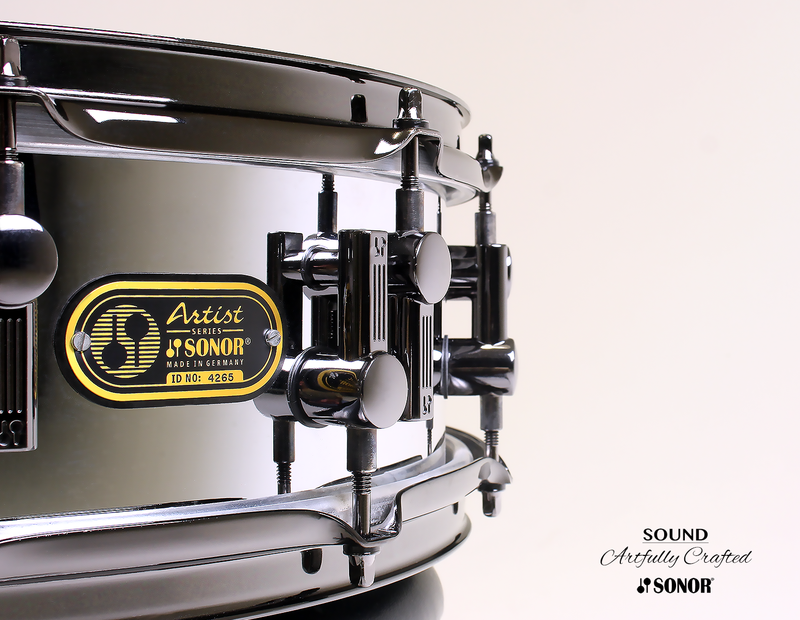 Single print ad showcasing the beauty and craft of German made Sonor drums. 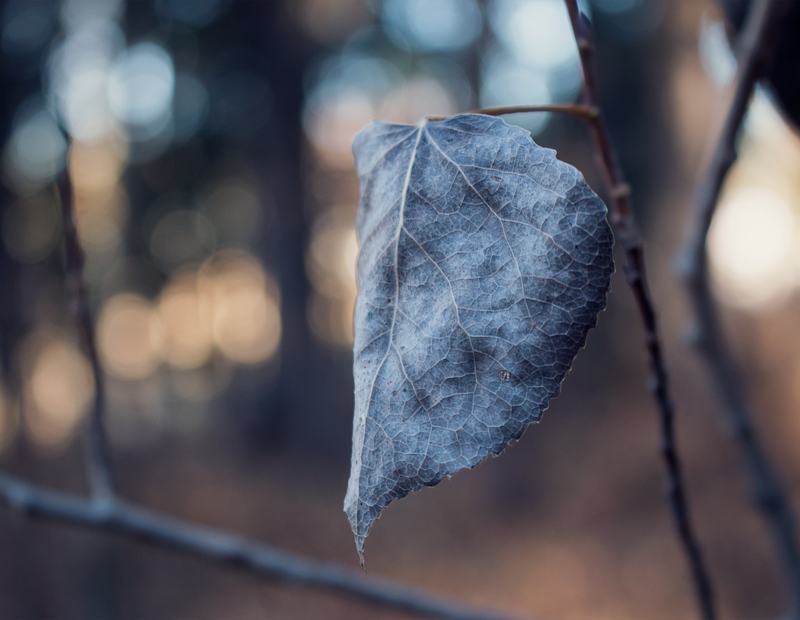 Photography by Nathan Labrecque. 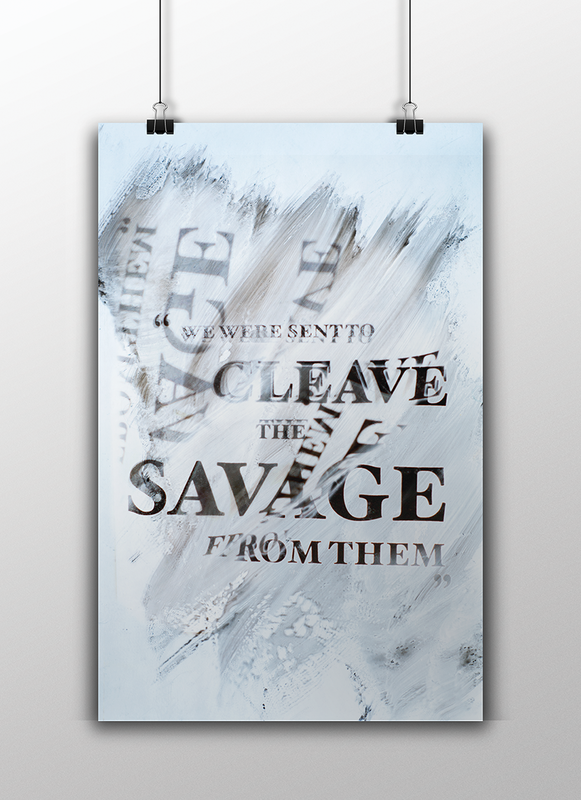 3D typographic poster utilizing a form of visual metaphor. 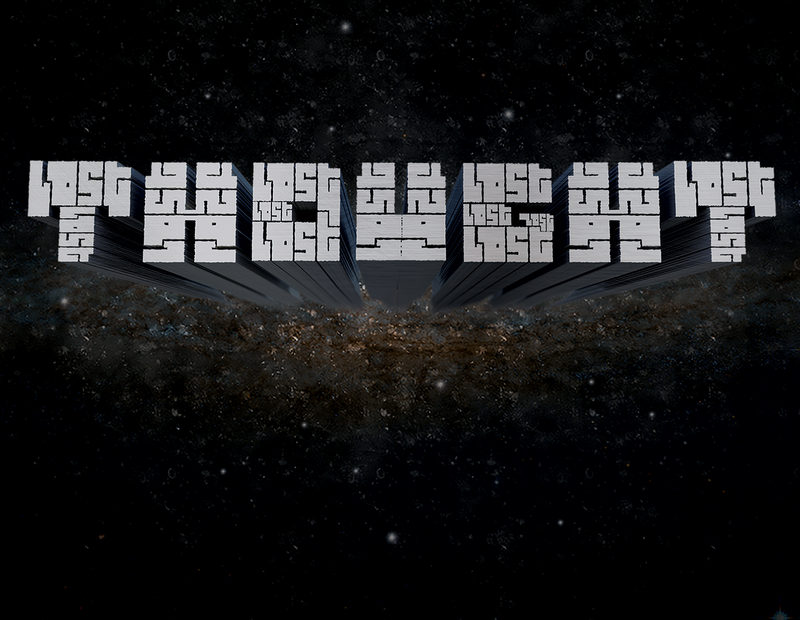 The word "Thought" is made up of smaller iterations of the word "Lost", thus implying the phrase "Lost In Thought" without actually saying it. 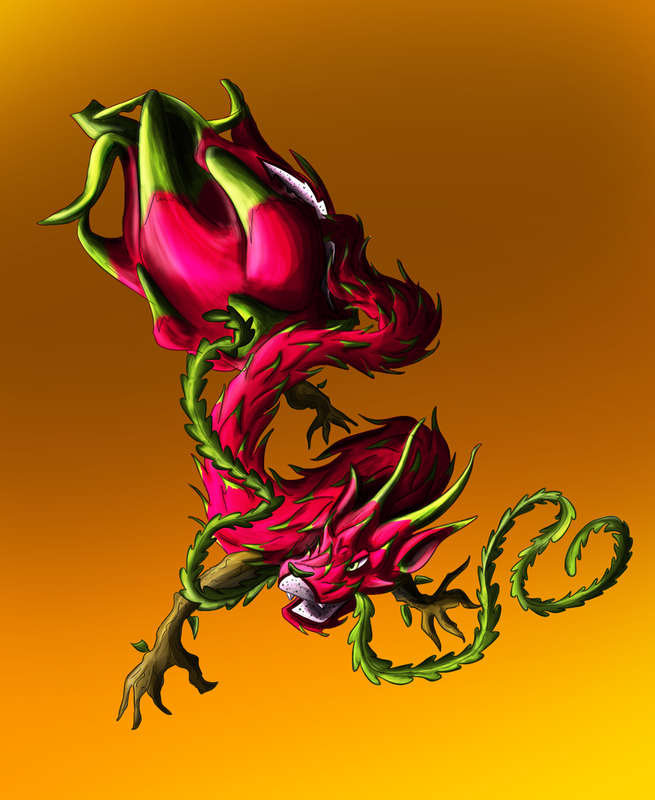 A digital illustration of our interpretation of an unusual word. 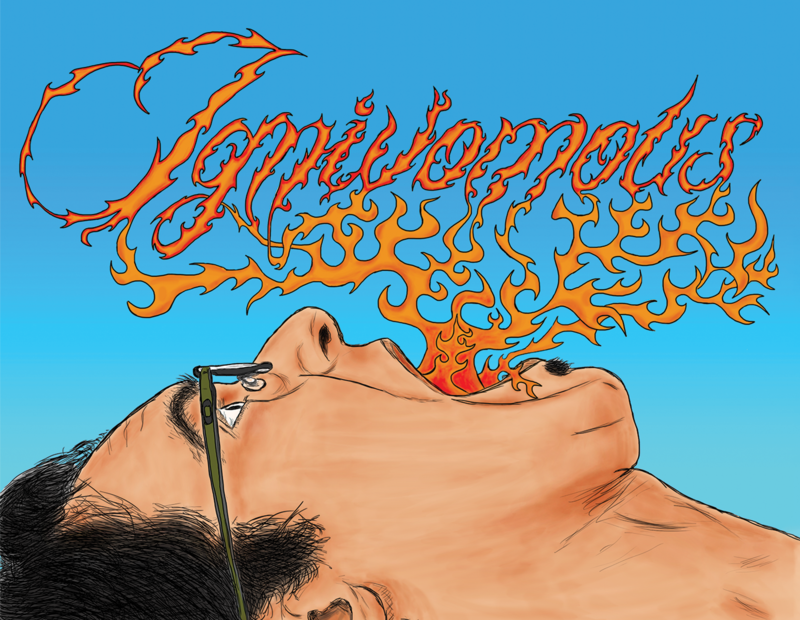 The word chosen was "Ignivomous", which means "vomiting fire". 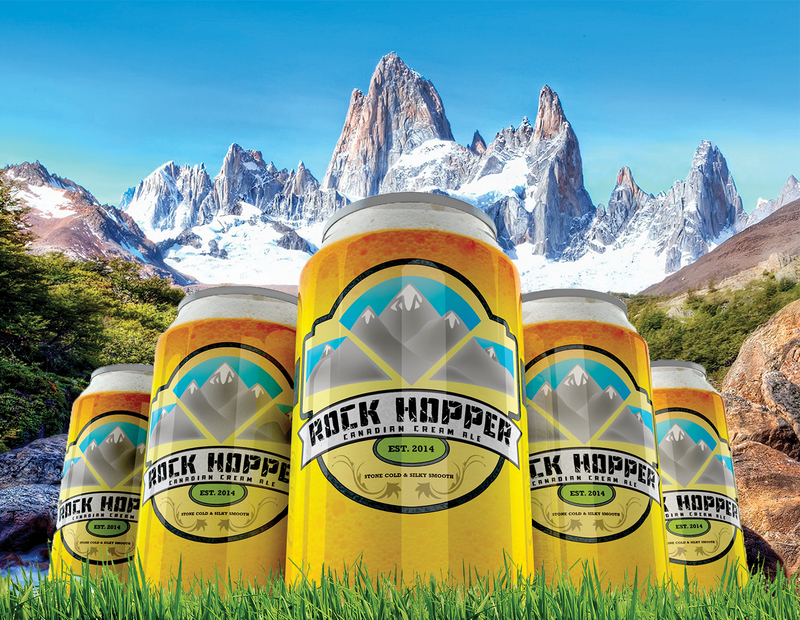 Beer can label design for a new Canadian beer. Beer cans were modeled and rendered digitally. Background photography for concept use only. I started travelling at a young age, and became endlessly fascinated with the world. I needed to experience more of it. It became a habit for me to document my adventures, which grew my love for photography. My passion enhanced each time I explored a new place. Being immersed in the cultures of over seven different countries has vastly opened my eyes. Through my photos, I hope to capture the personality and charm of each new place that I visit. Through my studies, I have acquired a stronger vision for documentary and strong skills in other photographic mediums. I’m inspired by people, the hardships they’ve had to overcome, and the way they chose to carry themselves today. The lights were low and we were unable to agree on a position. Suddenly we clicked: it was electric. We produced magic… photographically. A colourful studio portrait that captures the innocence of our youth. 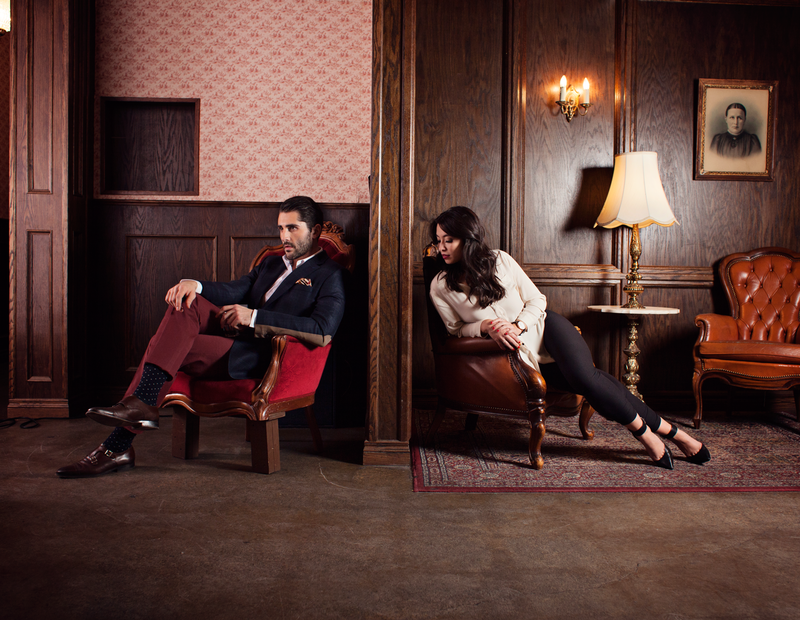 A photograph from an editorial spread that portrays the separation of values through studio lighting. An exploration of detail with the use of framing with light and shadow. 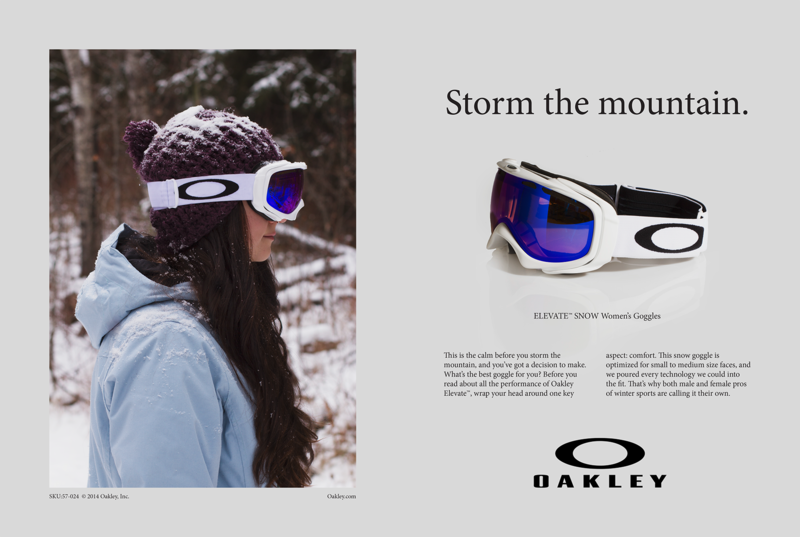 Product magazine layout for Oakley googles that displays a lifestyle and product shot. I grew up in Sherwood Park, Alberta where I was given opportunities to explore art and travel to new countries. With these opportunities I was able to better understand myself and my own style, while developing an interest in design. Design easily drew me in as it allows me to explore my interests in a more technical way while providing opportunities for me to continue to travel and explore by not holding me down to one place. I am inspired by the places I visit, people I meet, and the work of others. It was scary and unlike anything I had ever done before. However, after my first breath underwater, I became addicted to scuba diving. 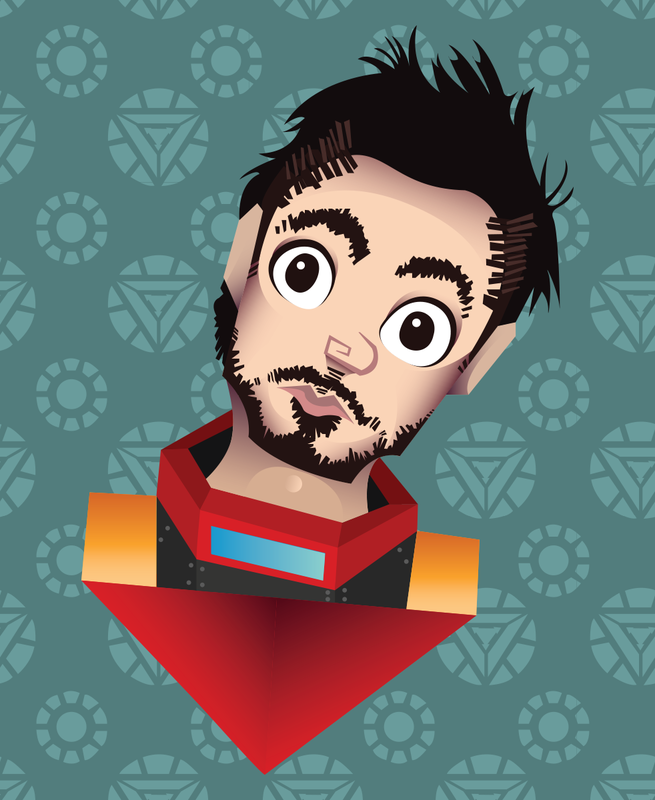 Vector caricature of Robert Downey Jr. as Tony Stark, using a couple of Arc Reactors to implement the patterned background. 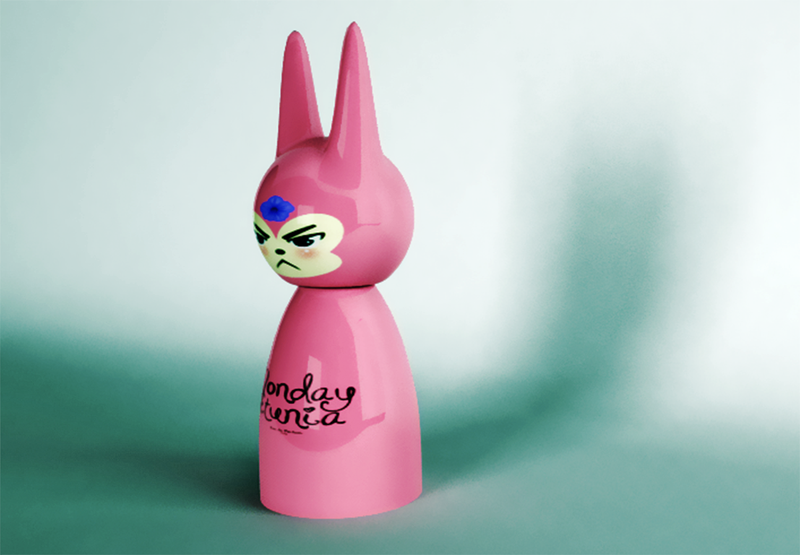 Package and product design for a perfume bottle inspired by a character that was previously designed. 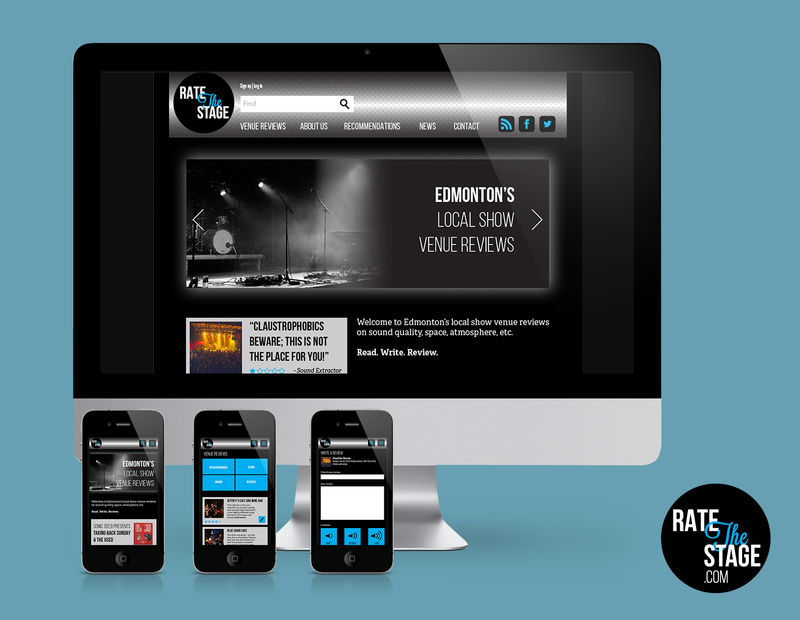 Edmonton-based website for helping young adults find locations and events for entertainment based on peer review and ratings. 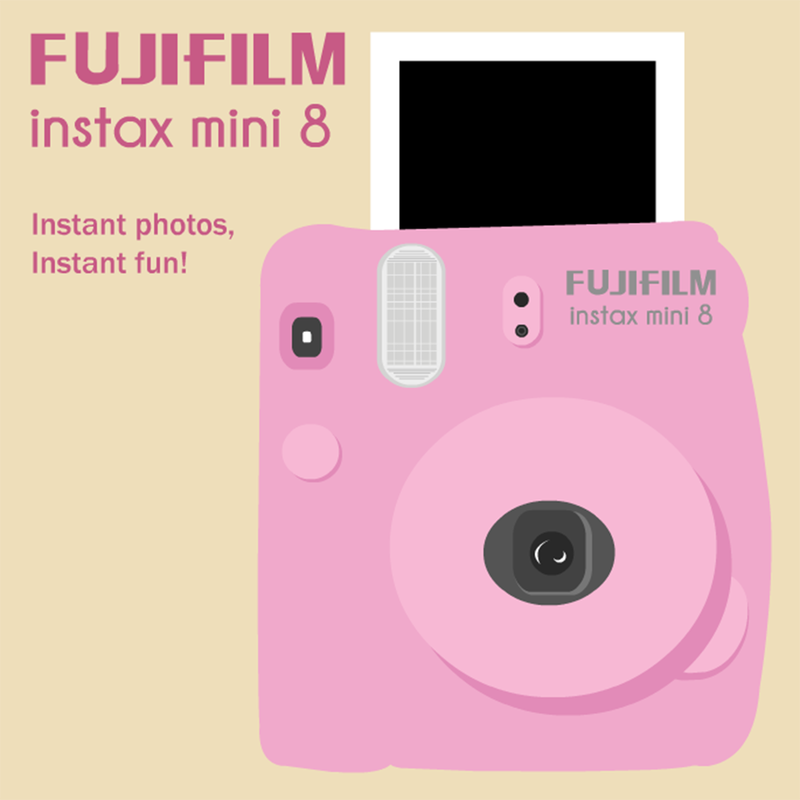 Initially a flash ad for Fujifilm Instax Mini 8. Animation demonstrates the function of the camera, targeting girls to young adult women. Born and raised in Millwoods, migrated downtown, lover of the prairies. 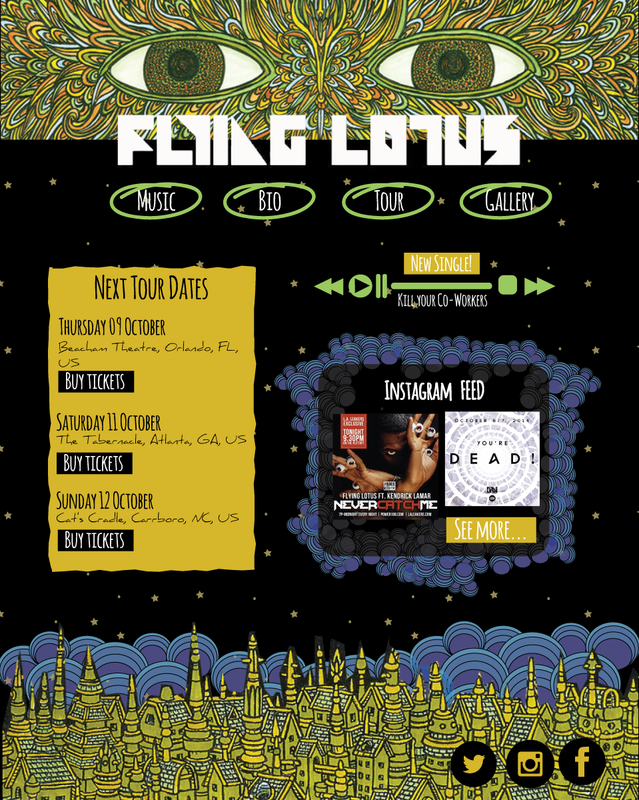 As a child my passion for MS Paint and Geocities, stoked my lifelong interest in designing digitally. When I'm not working away at my computer, you'll usually find me in my smithing workshop creating custom copper jewelry, taking a photo walk or enjoying a nice glass of wine. My dream is to one day sail the North West Passage in search of the greatest adventure. Rarely in the same place twice. Strange dreams, camping trips, Scandinavia, the view from my balcony and antique malls. Camp Counselor is a rating and review website that help campers choose the best campgrounds in Alberta. 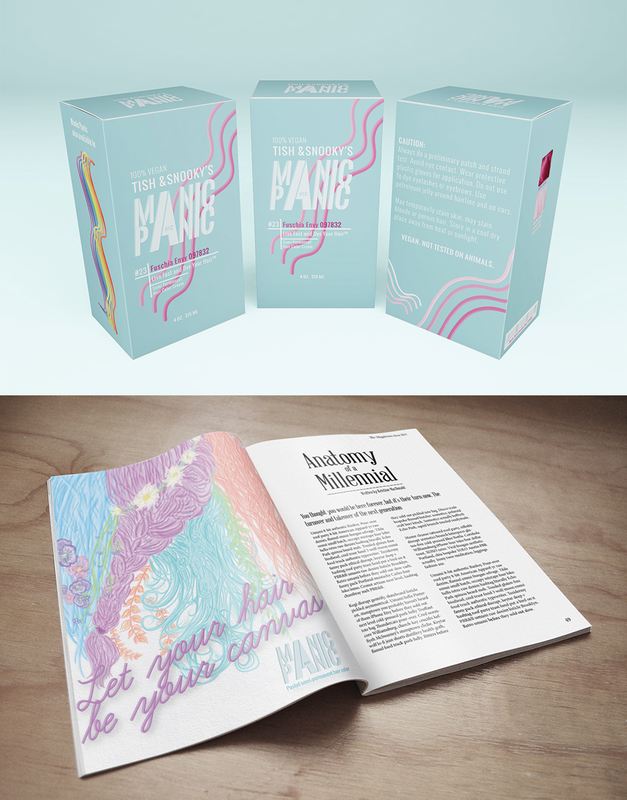 A complete rebrand and new visual identity for the colourful hair dye Manic Panic. The identity and website for my coppersmithing and jewelry design business. 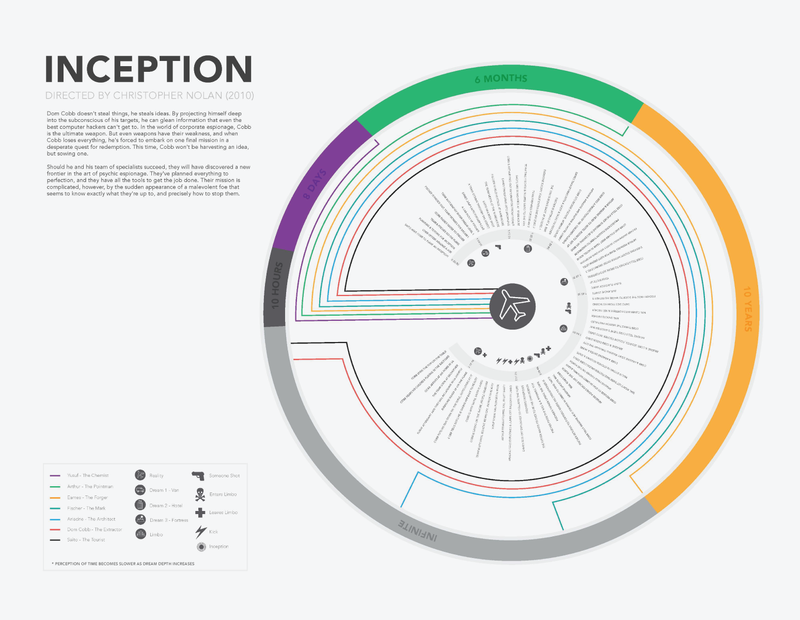 An infographic timeline of the film Inception. 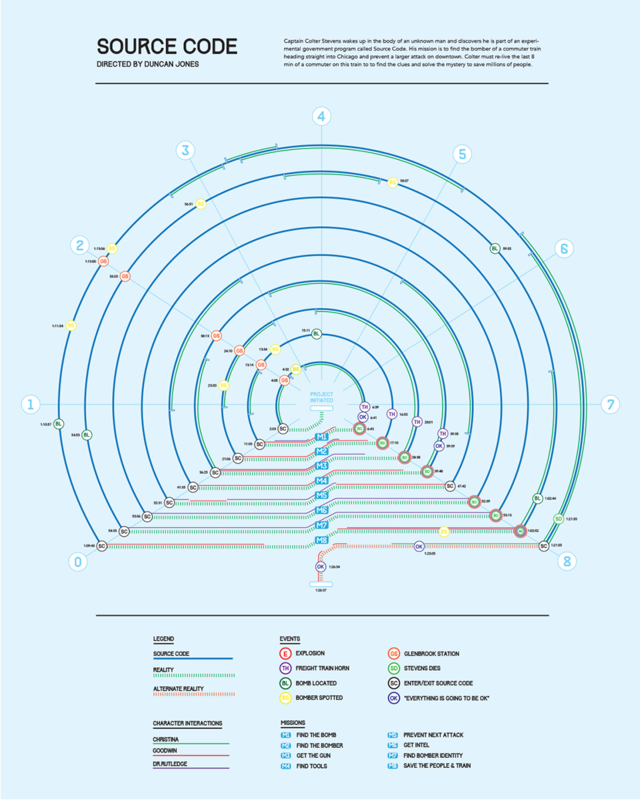 The focus is on displaying connections between scenes, characters and symbols in the movie. Róisín has been a creative since forever. She is a passionate photographer gone rogue, studying illustration to further understand the essence of what she sees. She’s eager to delve into any project full force and puts in every amount of effort time can allow to make a piece as loud as possible. Design is the vessel in which she fuses the elements of art and communication emerging them as one. My teacher asked us to draw trees. Then told us we wouldn't be able to, because we aren't trees. I still can't draw trees. Now I understand. 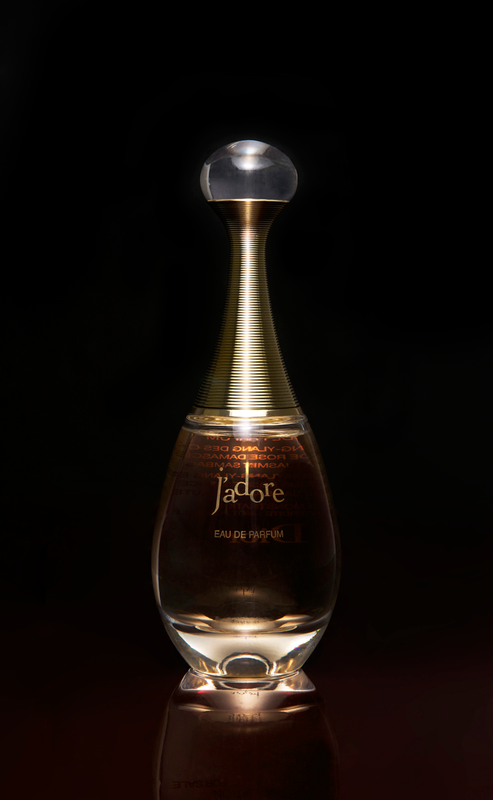 This is an ad showcasing the J’adore Dior perfume line. 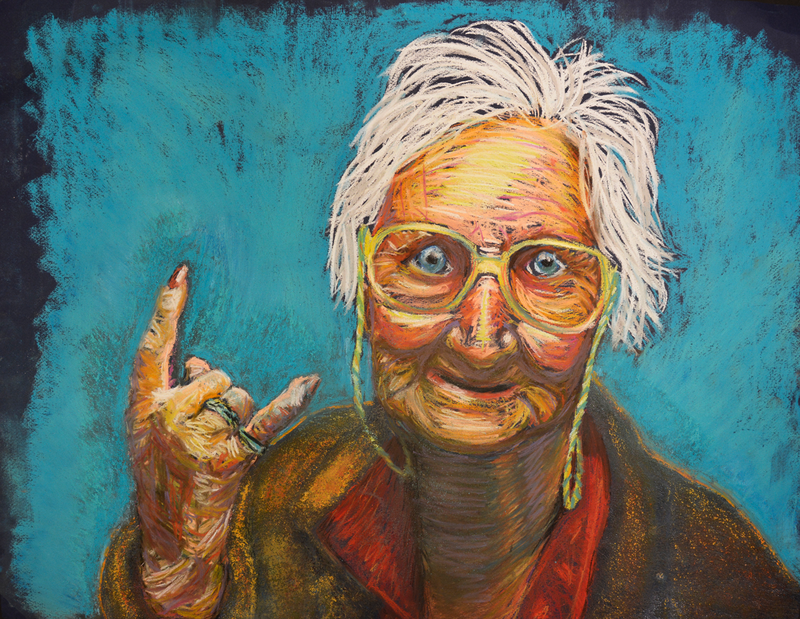 A pastel and mixed media illustration of a rocking lady. 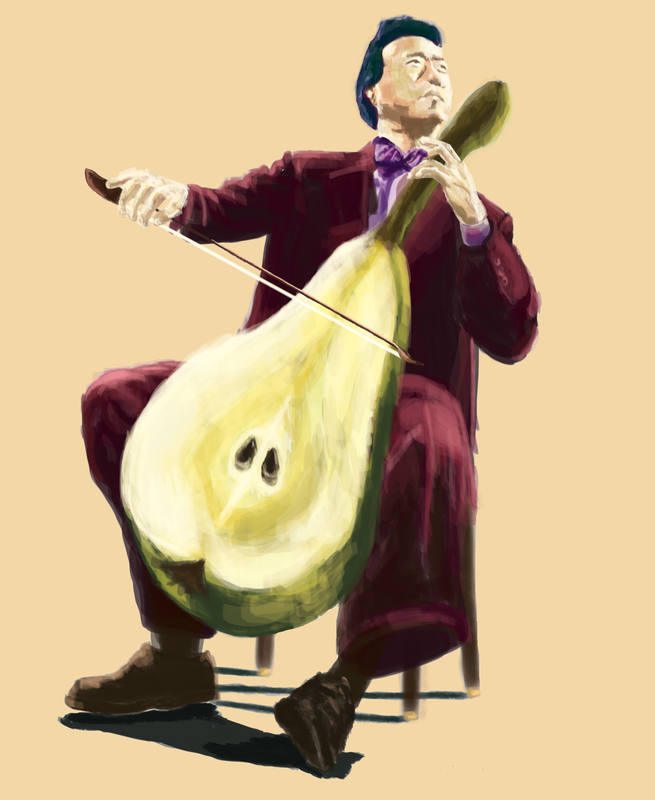 A digital painting of Yo-Yo Ma playing a pear! A selection of cards from the Devil’s Dictionary inspired by influential figures portrayed as cats. I love videogames, movies new and old, fine and street art, and all things nerdy. I have a passion for finding great and sometimes weird music. I try to take all the cool and different stuff that I like and add it into the personality of what I illustrate or design. I am also a strong believer that design is more then making things look pretty and is more about problem solving and doing it elegantly. It’s honestly a lot of stuff, but mostly music. It has always helped me push past a block or come up with an idea. I was nervous. Put the wrong thing in the wrong place, I couldn’t breathe, sweated the whole time, but in the end I got a good mark on it. This piece is a product redesign of Chef Boy-ar-dee and making it more professional and geared towards a 20 to 35 age range. 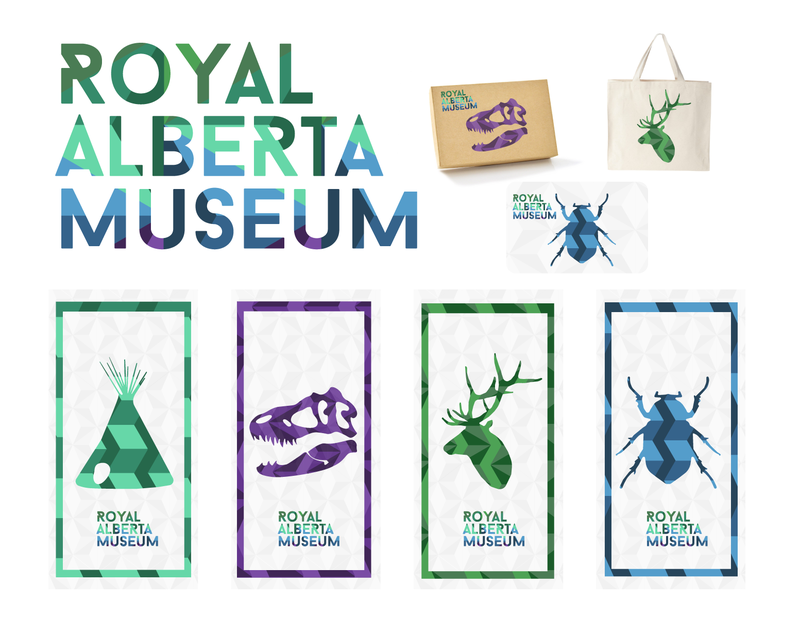 A redesign of the Royal Alberta Museum inspired by the colors of the northern lights represented in a reductive geometric pattern. 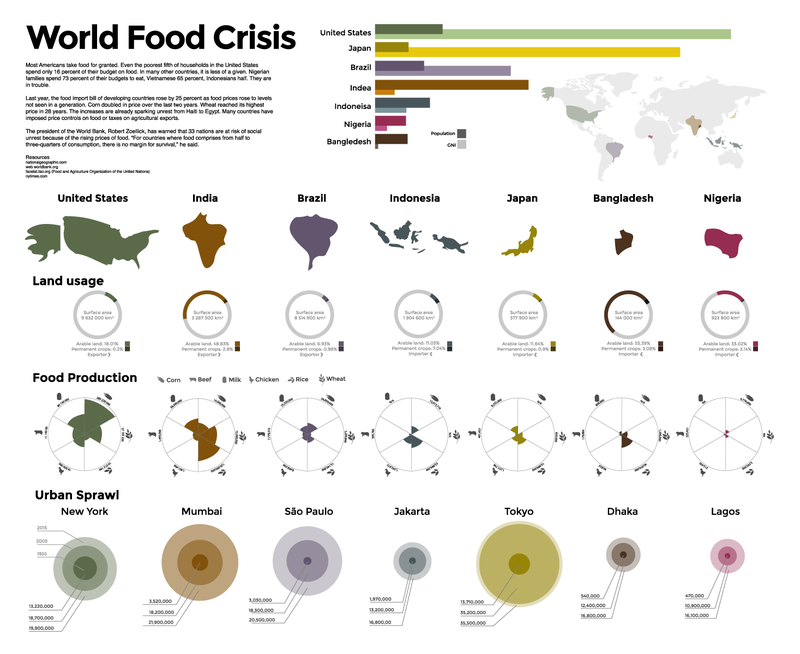 This infographic is depicting the food crisis across the globe, A reductive clean way to compare each of the given countries and their varying data. Hey! I’m Kelsey. I’m a sucker for mood lighting, singing in my car, and intended puns. I’m obsessively curious, especially when it comes to understanding people and discovering how weird they actually are. Sometimes I ask way too many questions. Maybe an inappropriate amount. I also have a thing for plants, but have a really hard time keeping them alive because I water them too much. Yet I still buy them, knowing that eventually my love will kill them. Interpret that as you will. Being around people who are unapologetically in love with the world. 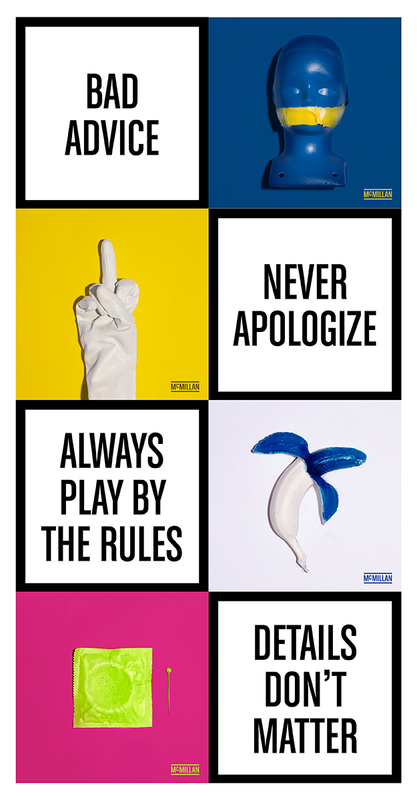 This set of self promotion cards features a piece of “Bad Advice” on the front and an image on the back. 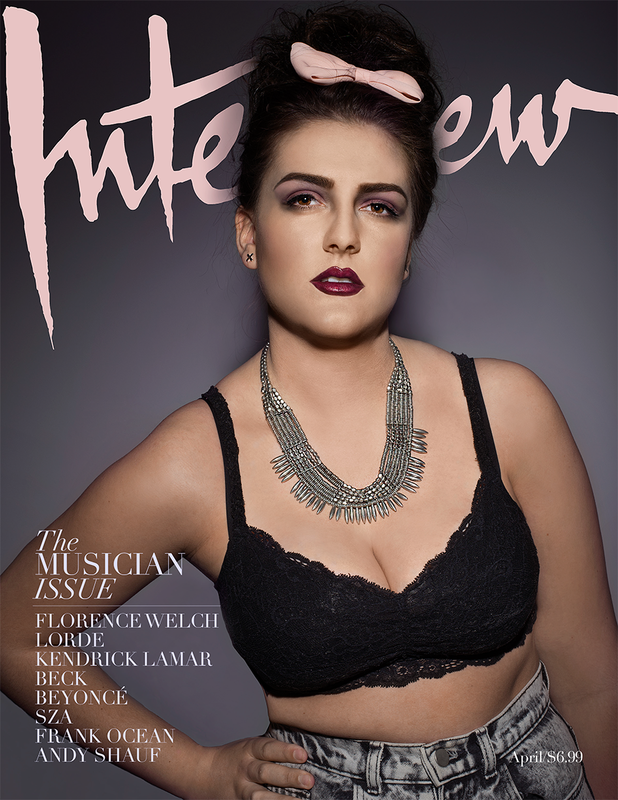 A mock magazine cover for Andy Warhol’s Interview Magazine. 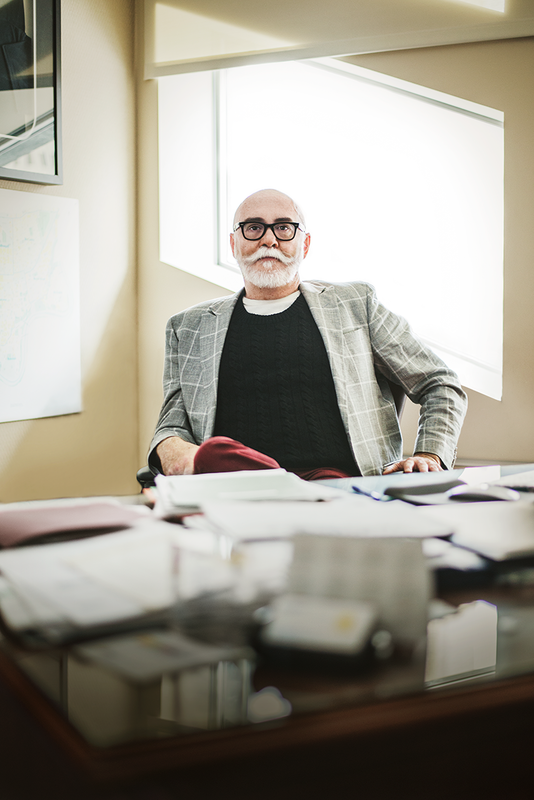 A natural light portrait of Edmonton city councilor Scott McKeen. 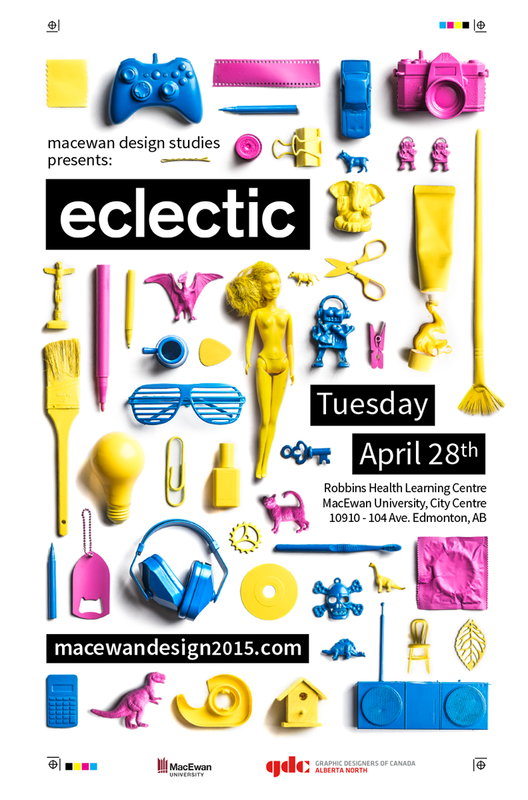 The visual identity for the MacEwan 2015 Design Studies Grad Show. Being born in the later 90s, I grew up on cartoons and educational shows that helped me expand my mindset on viewing the world around me. Ever since the car accident that scared me, back in 2007, I view things with even more of an open mind and I thrive on seeing the beauty even in the ugly. I find great inspiration from nature, literature and cinema. The very first time I had ever considered a career in design was back when I was 10, I wanted to be a cartoonist. 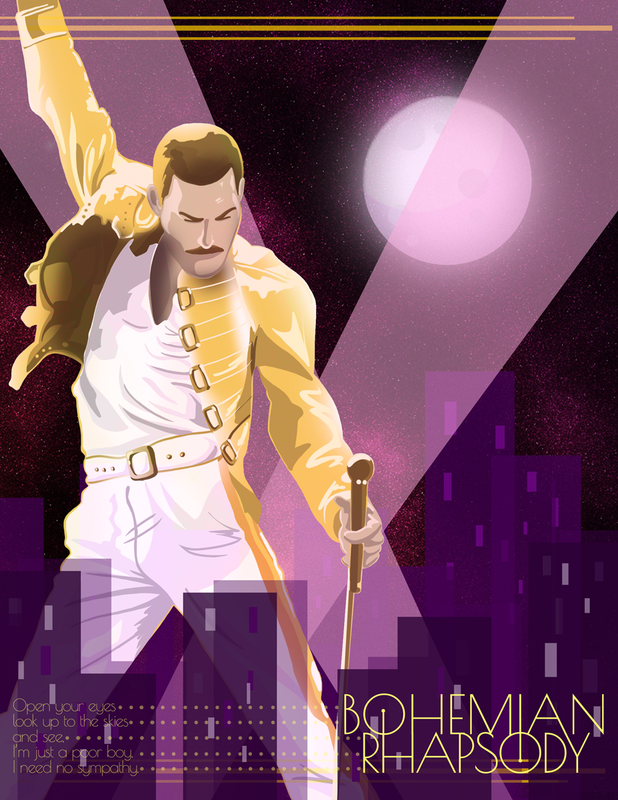 A lyric poster on Freddie Mercury’s most popular song. An ink and acrylic wash project that displays one of my illustration styles. An exercise in Photoshop brushes. A satirical ad based off of a popular company. I was born July 18th 1990 in Edmonton Alberta. In 1992 I was diagnosed with leukemia, later developing dyslexia and ADHD as a result of treatment. I graduated from Eastglen High School and was awarded the stantack youth award in 2008. Then in 2009 I was enrolled at ACAD. In 2010 I had health complications but returned to my studies in 2011 at Grant MacEwan University. It’s hard to summarize what inspires me but it is often fixated in the fantastical or the immense variety of concepts the world provides us. The first time I knew I wanted to be a designer was when I was in an art class in high school and was tired of the quiet drawing period. 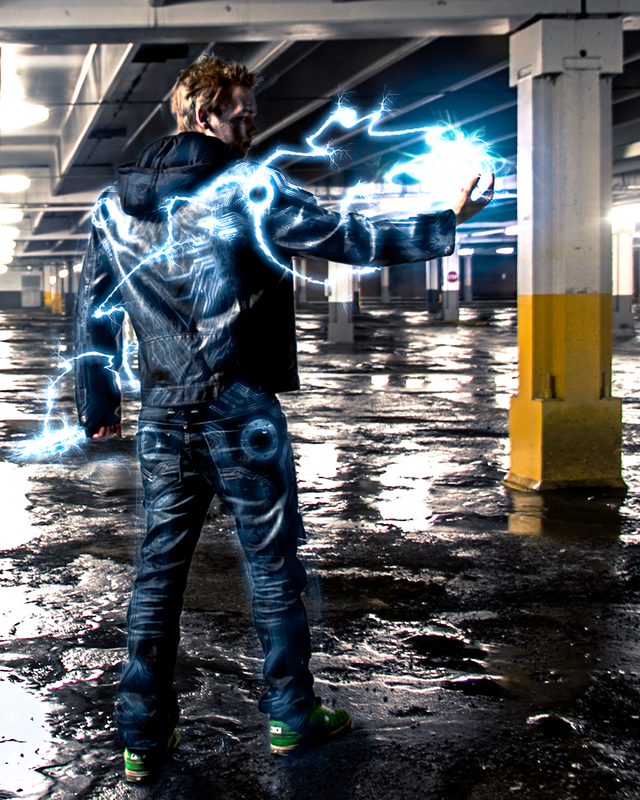 A photo where we created a narrative of a superhero. Aug is a hero based off the concept of him augmenting his body with technology. 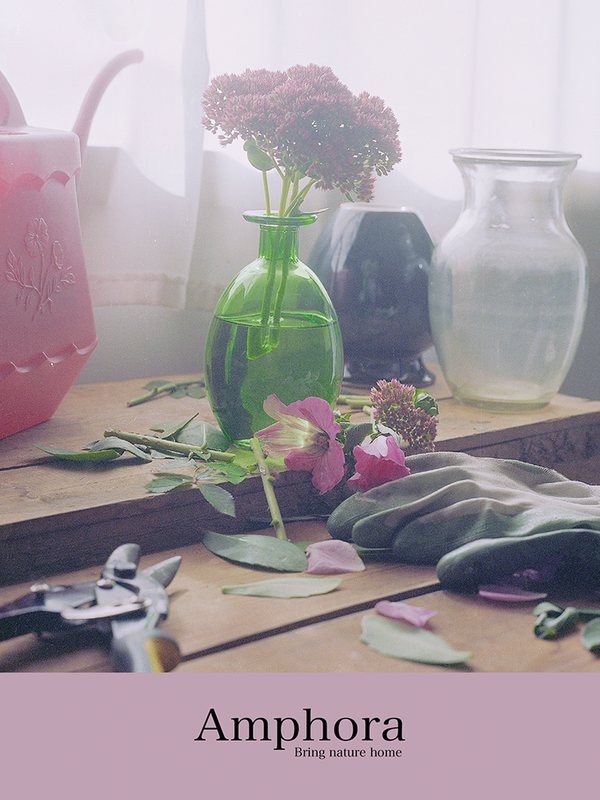 A commercial style photograph where we were directed to sell a product. This sells the adventurous nature of the product. 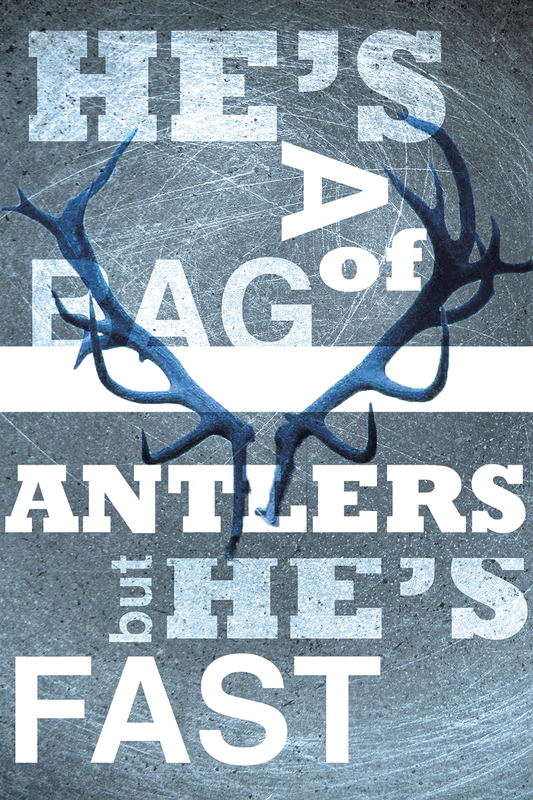 A project where we created text and images using real world elements to create a book cover. 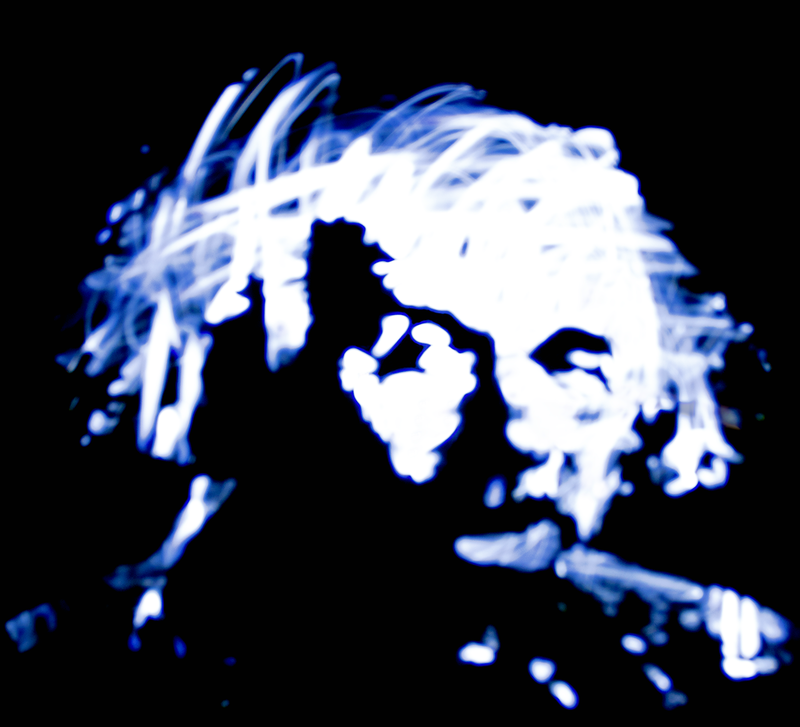 The photographic light painting creates the image of Einstein. 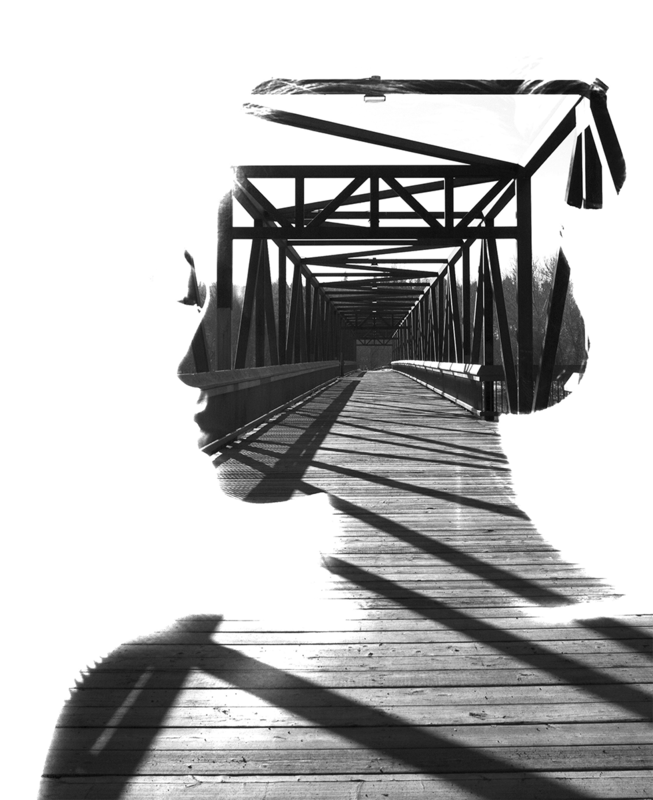 A photograph in an editorial style of photography from the photo illustration course, where the goal was to capture and show a mood with a product. I was born and raised in Saskatoon, Saskatchewan where I quickly developed a love for getting my hands dirty. 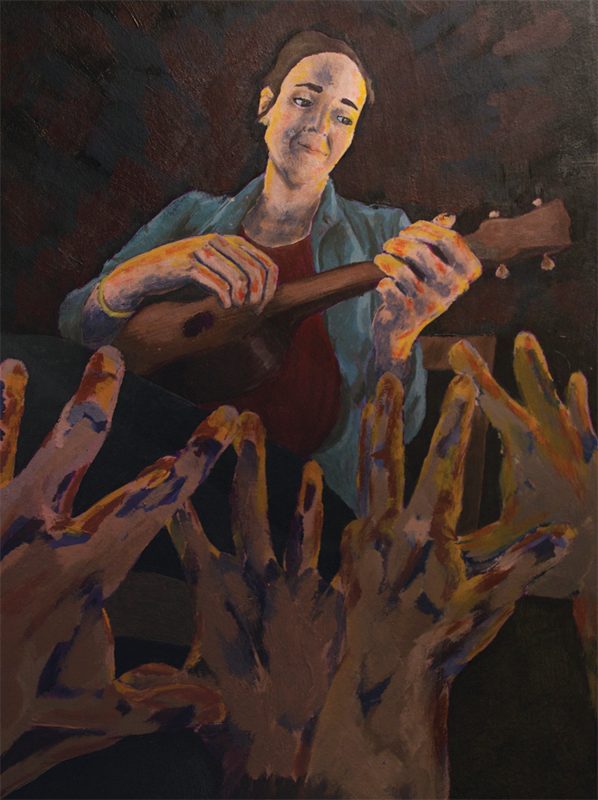 My love for working with my hands led to a developed interest in the arts. What started as making mud pies soon progressed to a fascination of drawing, painting and sculpture. 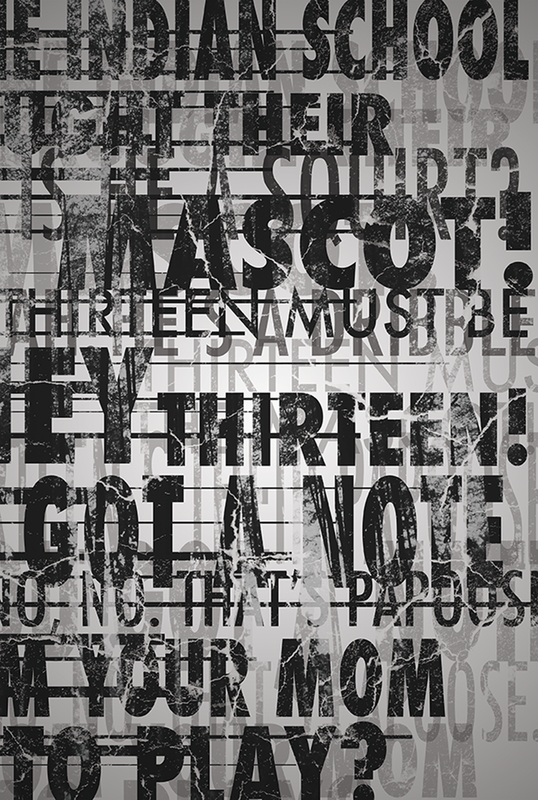 After I entered the MacEwan Design Studies program, I discovered a love/hate relationship with design. My first time using Mr. Sketch smelly markers was a delightful and confusing time. How could something that smells so good taste so bad? 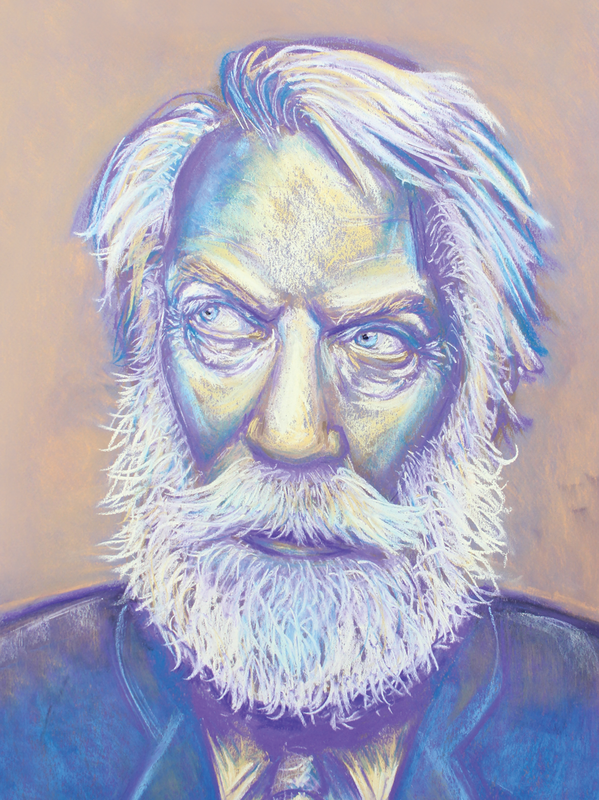 Portrait of Donald Sutherland using chalk pastel. 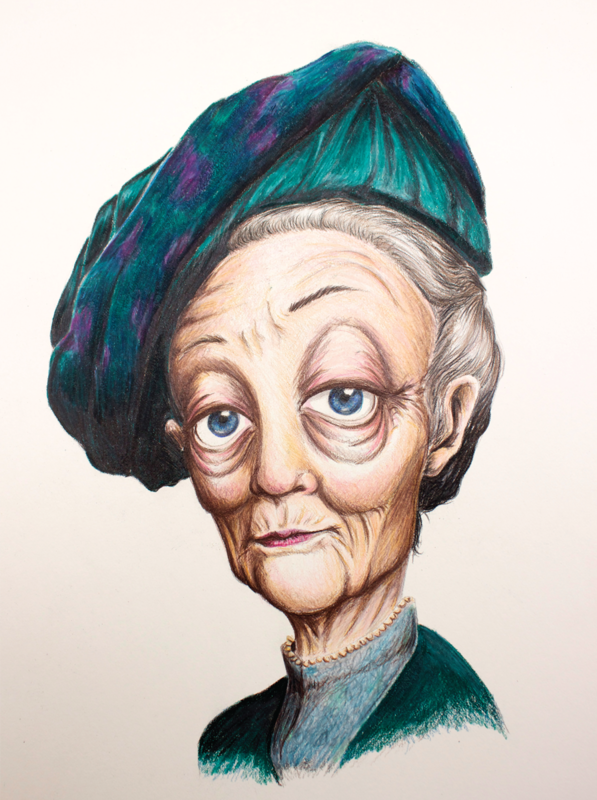 Caricature of Maggie Smith in character as the Dowager Countess of Grantham using pencil crayon. 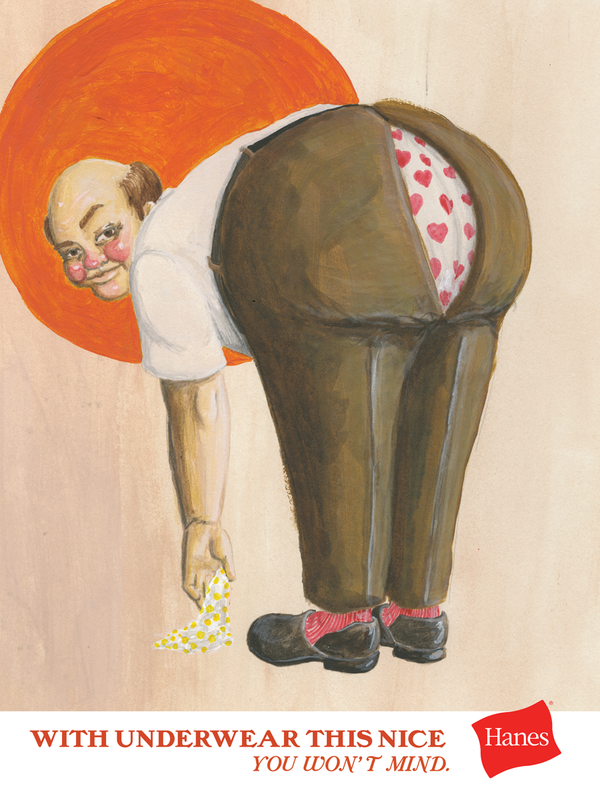 Magazine ad for Hanes brand underwear in the style of Norman Rockwell using acrylic paint. A book cover for the short story The Curious Case of Benjamin Button. When I enrolled at MacEwan I wasn’t sure if it was the right decision. I didn’t exactly know what design was or what I would be studying for the next three years, just that it was a subject that briefly captured my wandering interest. I was under the impression that design was just about making things look pretty or something like that. I couldn’t have been more wrong. Three years down the road since that fateful enrolment date I’d have to say that I’m very satisfied with my ill-informed decision. Many things inspire me. A few examples of such things: clouds, trees, intricacy, amplitude, the concept of perception, and squirrels. The first time I filled out the form for this information I did it wrong. Turns out the criteria was a max of 140 characters, not words. 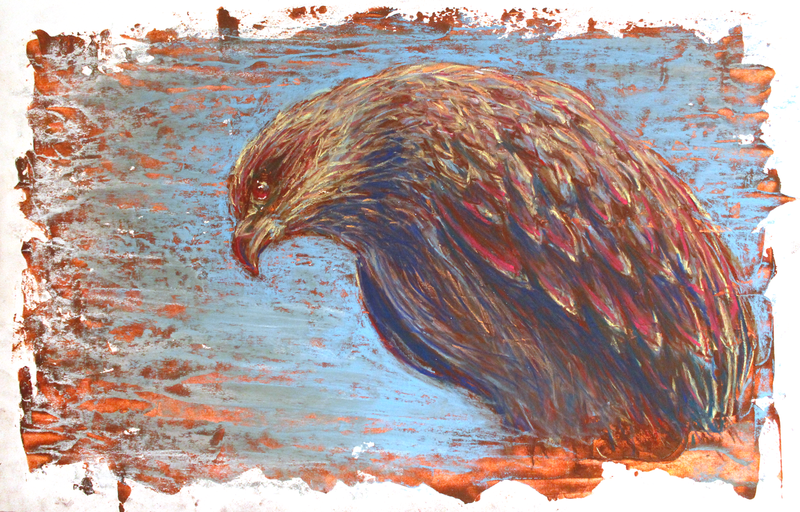 One of my first pieces done in pastel. I was resistant at first, but I must say I’m a fan now. 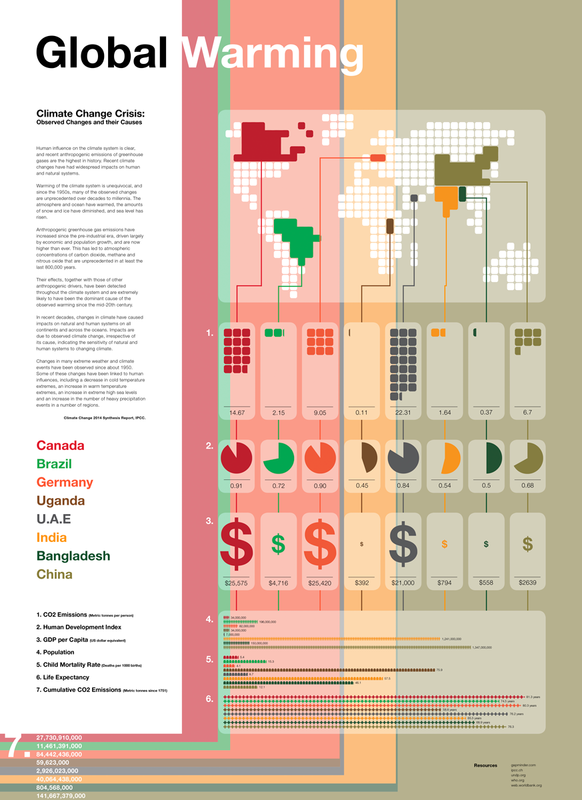 An infographic on global warming. Apparently it’s not a good thing (global warming, not the infographic). Some people say that the body in this painting looks like me, other people wish it was. 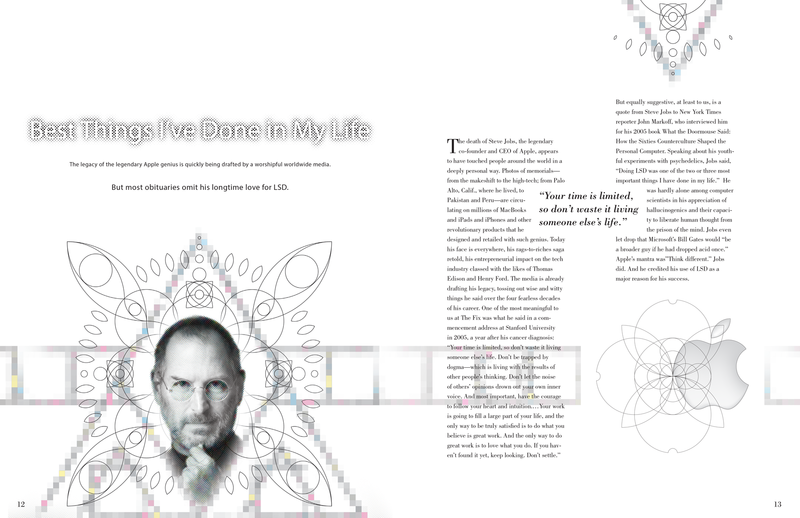 A magazine spread I made for an article about Steve Jobs and LSD. This is my interpretation of Apple's aesthetic with a little bit of psychedelic. My name is Casey Pollon and I am a visual communication designer located in Edmonton, Alberta. Graphic design has been a deeply rooted passion of mine for as long as I can remember. Ever since elementary school the projects where I got to create something visual - like a poster or a booklet - excited me the most. Typography, publication design and branding are my strengths but I am always eager to learn new skills and experiment with fresh techniques. Everything and anything inspires me. I can be walking down a familiar street or in another country and feel inspired. My first time was crazy, intriguing, new and full of passion. What an unreal feeling it was to fall in love with design. 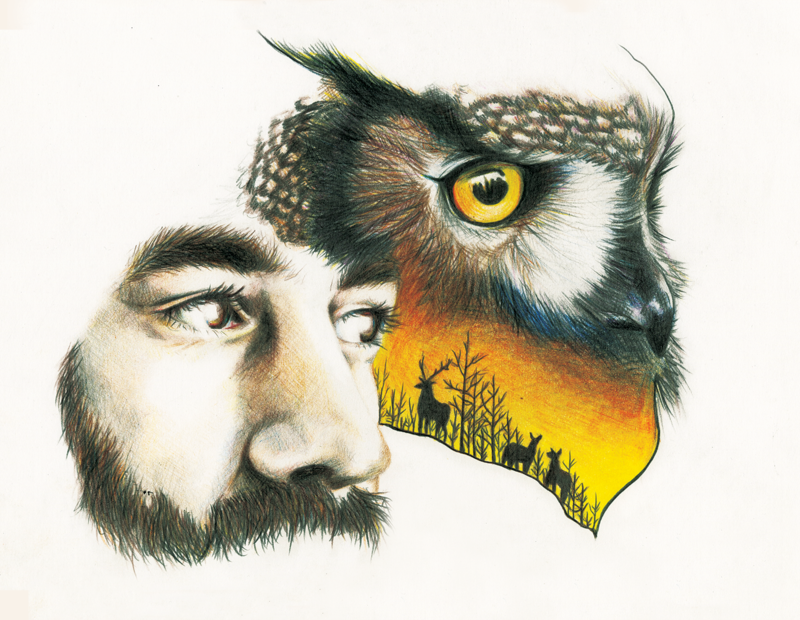 A poster created to promote the book of the year "Indian Horse". 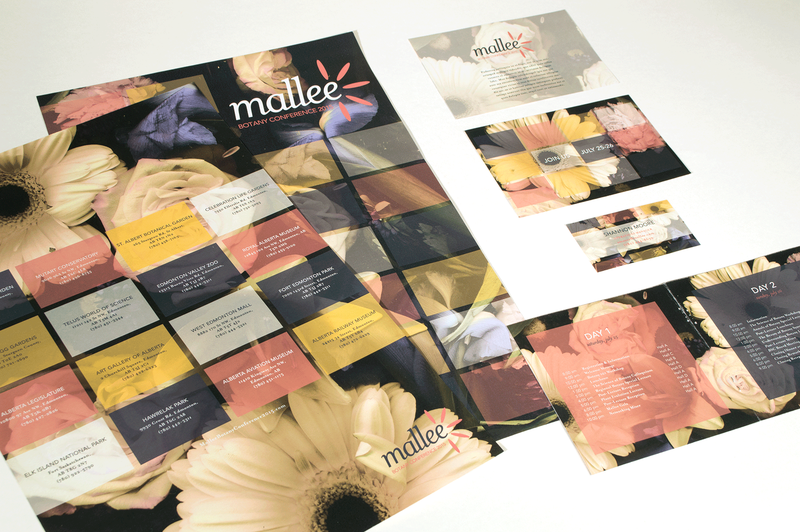 A conference package created for the annual Botany conference, “Mallee”. 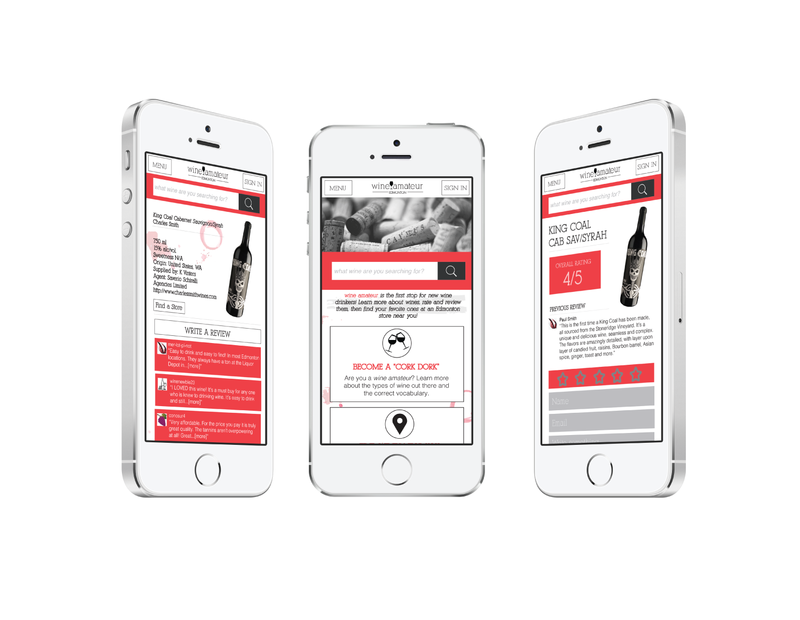 An ad campaign to promote Barefoot wine. I was born and raised in Shanghai, China and have been Edmonton, Canada for almost four years. Besides design and drawing, I enjoy playing badminton, basketball, and singing. I am also lazy and like sleeping under the warm sunshine in the afternoon. 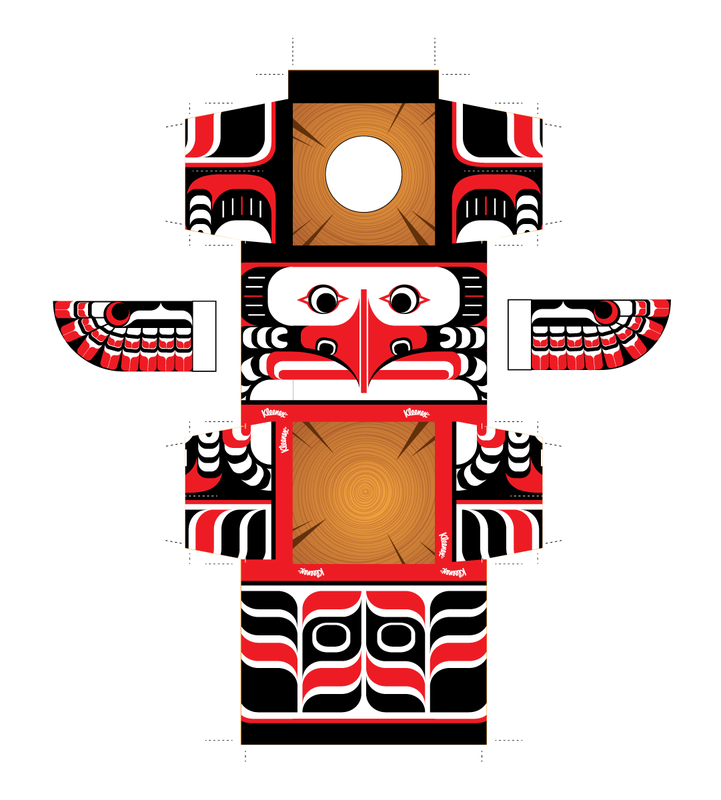 I will try my best to connect Chinese culture and North American culture together in my design. I always listen to the music when I am designing. Sometimes I throw my idea in the garbage so I push myself to produce a new better idea. The first time I drew I was 5. The first time I hated drawing I was 5. The first time I pushed myself to study design I was 18. 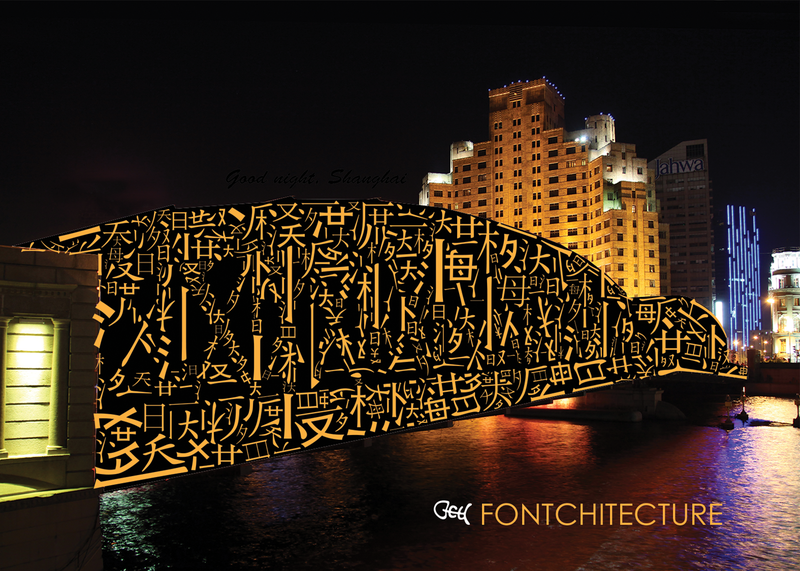 Using each stroke of the Chinese name of the bridge to replace the real bridge lets people imagine its true features. People could go on a trip to that place or research online to see it. 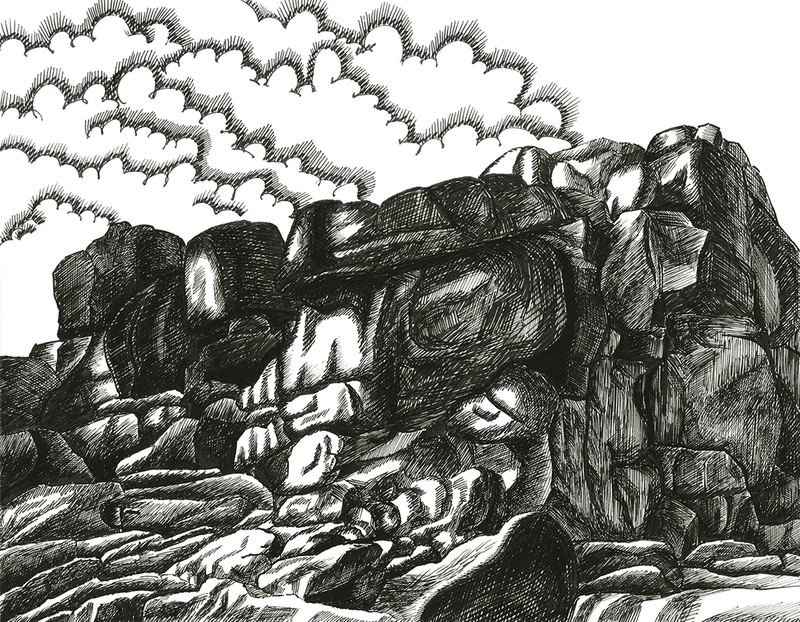 I chose ink technique to finish the landscape and tried to use a different drawing style to do the cross hatching. It cost two hours to complete. I read a book called Indian Horse and translated it into a poster using typographic technique for the main elements. I used key words or sentences to express the inner feeling. 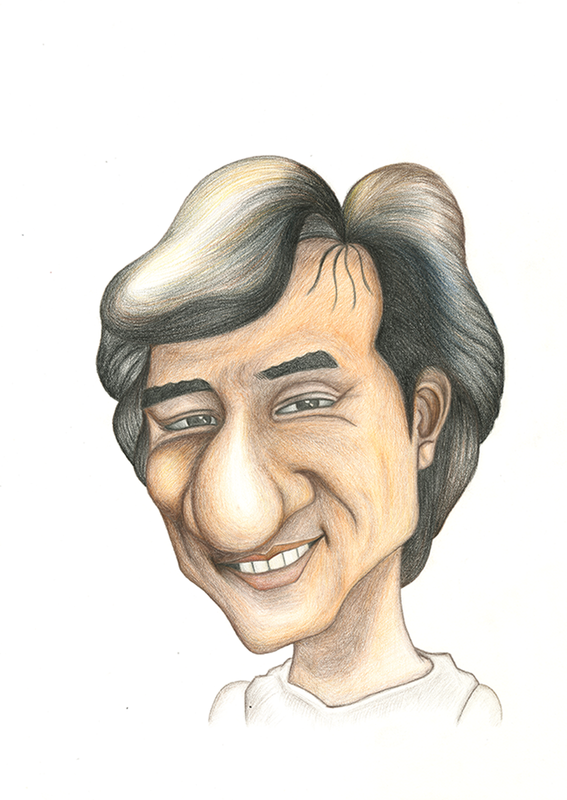 I used distortion and scale change to create Jackie Chan’s face but keep his face recognizable. I’ve been drawing longer than I could walk, so from an early age I knew art was an inherent part of my life. I chose Illustration because it spans across so many mediums and platforms, the possibilities are infinite. I also enjoy the fact that you never peak, you always improve. 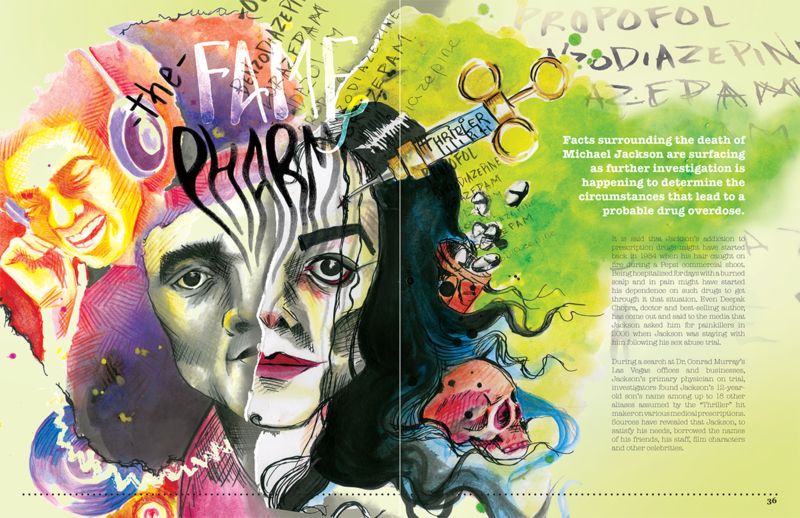 Editorial spread talking about celebrity deaths due to prescription drugs. 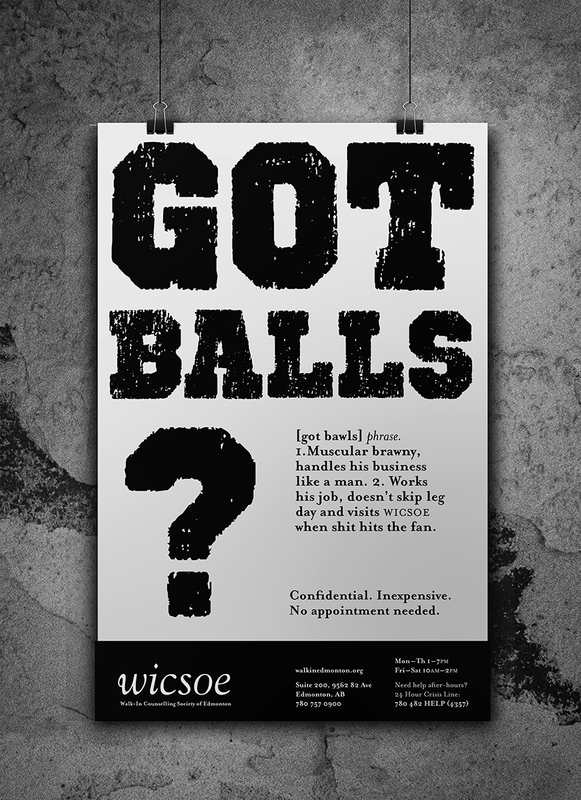 Make a poster incorporating type and image. Pencil crayon and graphite on Bristol. Congrats, you clicked my photo and now you’re reading this! The name is Chris and these past few years have been thought provoking, challenging, inspiring, and highly caffeinated. I’m an avid coffee drinker, a type lover, an illustration fan, a photography enthusiast, a music fanatic and I’m heavily influenced by modern and vintage design. The best thing about design that I’ve learned, and continue to do so, is that it can be anything and has the power to do anything. Because of that, I know I’ll always have a passion for design. I would have to say people. Whether that’s having a good conversation with someone or helping someone in need. Fourth floor. Room 411. September 29th 2013, late night. I used Comic Sans for the first time. I still regret my decision to this day. 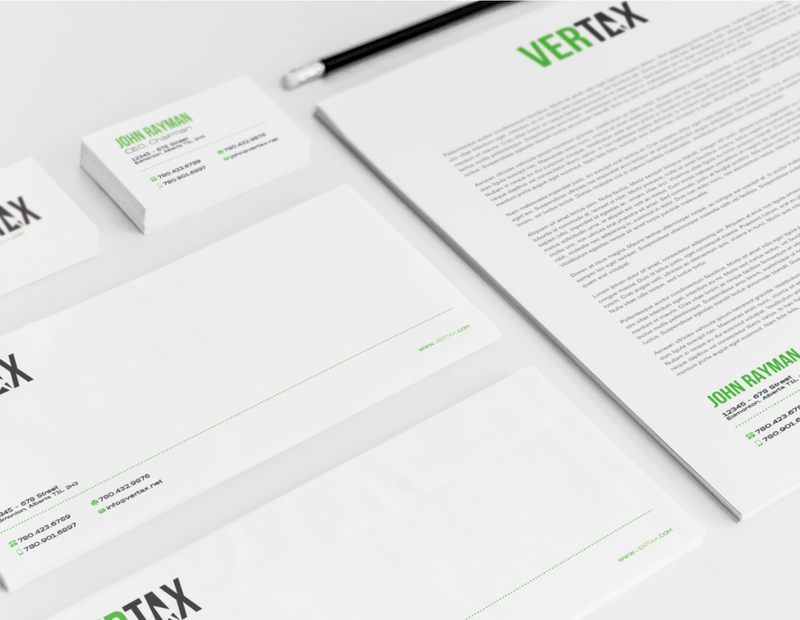 A branding project aimed to create a very clean, and professional brand for an innovative tax company. A strong visual of a single word made 3D. A rating website created for venue owners, event attendee, and sound techs who want to better the experience of local venues. 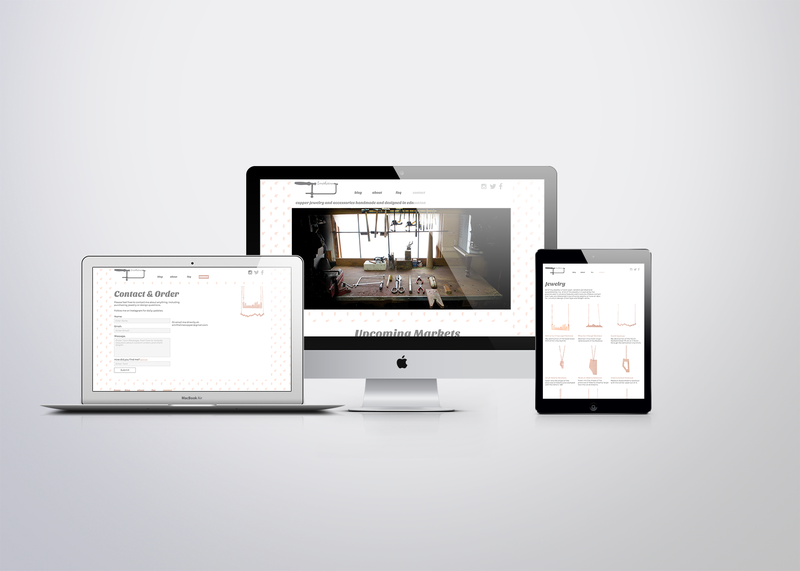 A website inspired by an album of the artist that achieves a unifying design. I grew up on a farm with a brother and sister. Everyone in my family had some natural artistic talent and my brother and I would often draw together. My brother came to this design program first and I followed in his footsteps. Drawing has always been a passion of mine and I try to draw every day. Skiing is another thing I do with my spare time, but sadly, not every day. Besides that, I enjoy laughing and making jokes, even though I take a bit to open up. Anything from really tiny intricacies to grand landscapes. The first time I picked up a paintbrush, I wished it was a pencil. “Thumbelina” fairy tale children’s book spread. 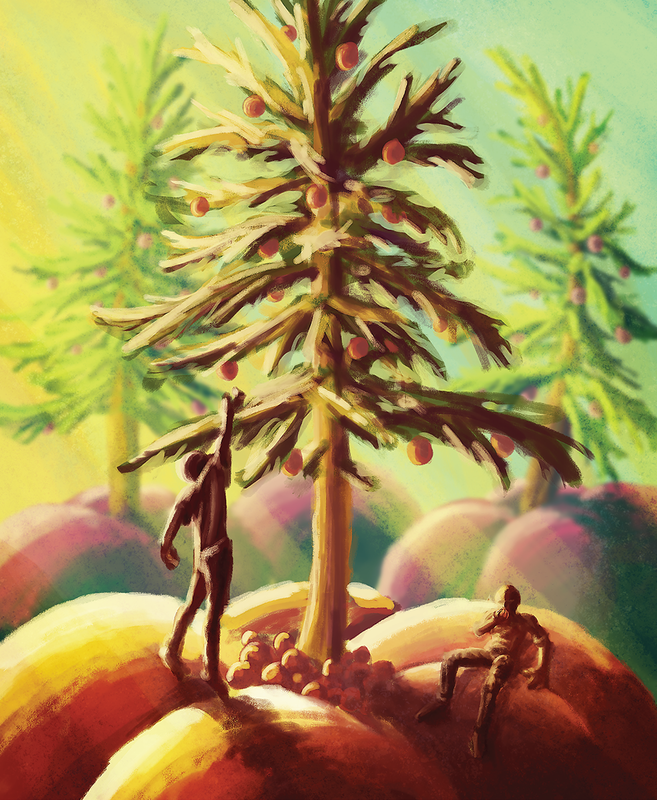 “Pine Apple” conceptual digital illustration. 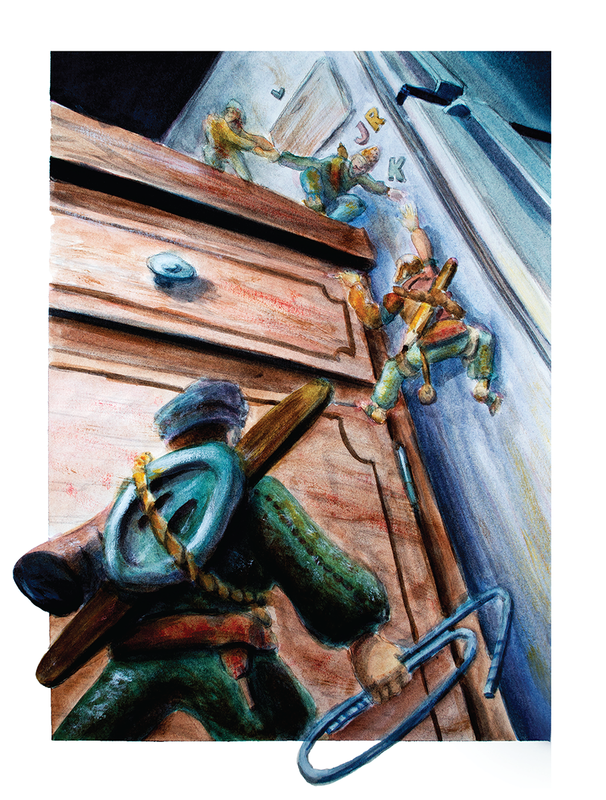 “Borrowers” conceptual illustration demonstrating use of perspective. I was born in Edmonton, Alberta. My career in illustration started early – as a child I sold my first drawing (a rainbow snail) for a whopping ten cents. I became inspired that someone would like my drawing so much that they wanted to keep it, and so my passion began. Since then, I have pursued many different styles of illustration, and I often remember the excitement that comes from seeing someone enjoy my work! I am really inspired by people and our incredible diversity - it is exciting that there are so many different perspectives out there! My first freelance “job” was a drawing of a snail made with scented markers. Selling it for ten cents was the start of it all! 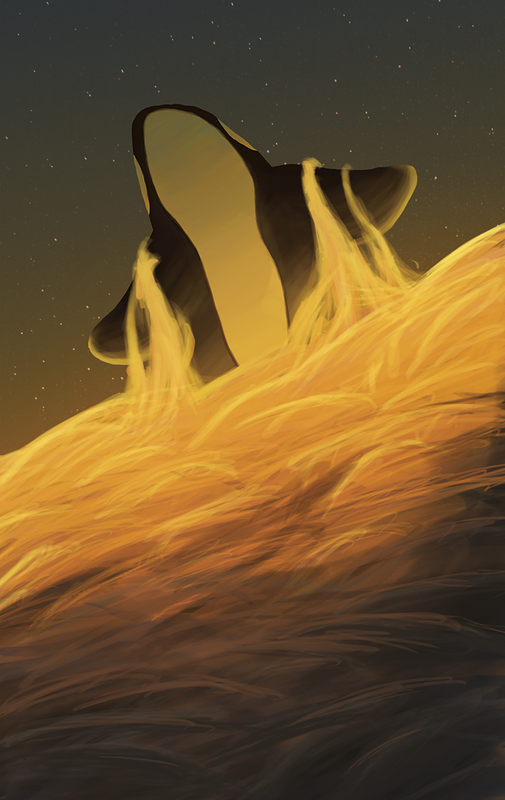 An illustration created for an interpretive drawing class, Breathe was created digitally in Adobe Photoshop. 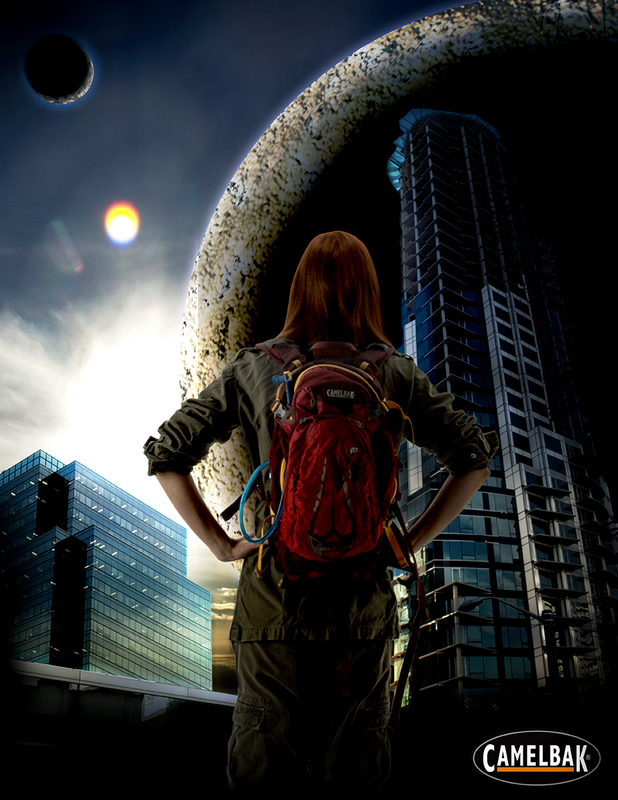 An ad created for a photo illustration class. 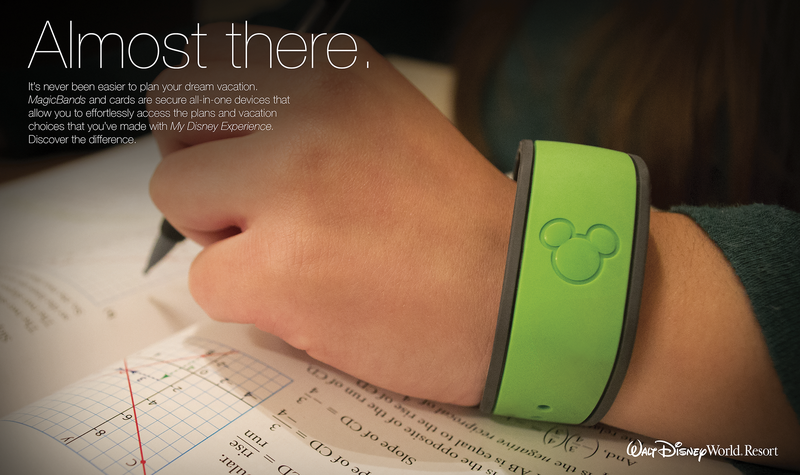 Almost There features a MagicBand from the Walt Disney World Resort in Orlando, Florida. The Walt Disney World Resort logo is owned by The Walt Disney Company. 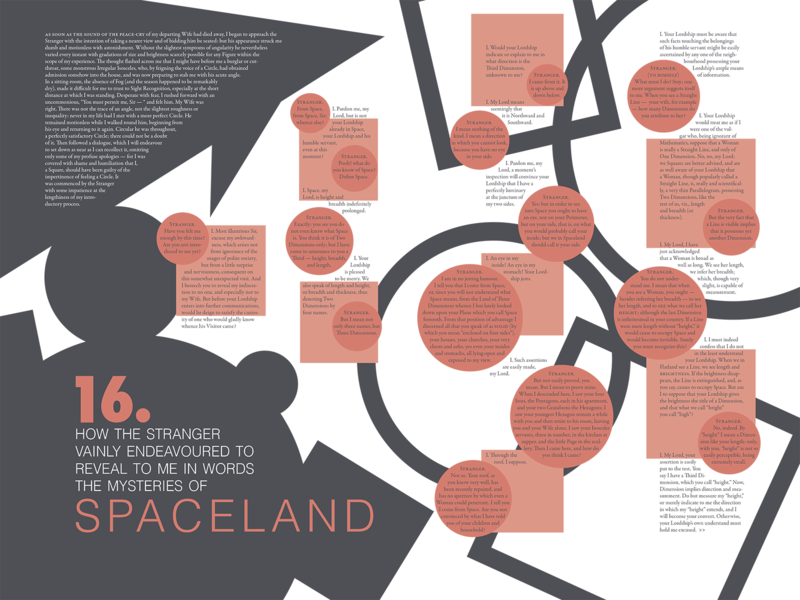 A collaborative typography project, Flatland is a spread created for the story Flatland by Edwin A. Abbott. 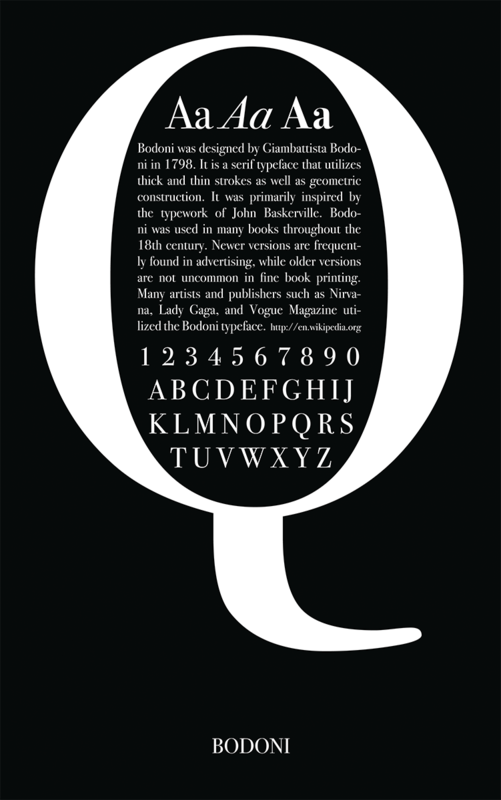 A poster created for a typography class to feature the Bodoni typeface. My motivation is to create and inspire. I was raised around movies, music, and magazines— mediums that I viewed larger than life itself. In their world, everything seemed perfect and precise, something so amazing that it captivated the very foundation of my imagination. I became fascinated with colour, style and composition, and most importantly, how all these areas contributed to life itself. All these curiosities have really molded me on to pop culture and influenced my work and its high attention to detail— not to mention helping me establish a great sense of humour about things. Art, magazines, books, music and movies— basically anything that has some form of imagination and creativity laid upon it. When I was 4, I got my first ever experience with evil clowns thanks to Stephen King. From then on, I became fascinated with the macabre. 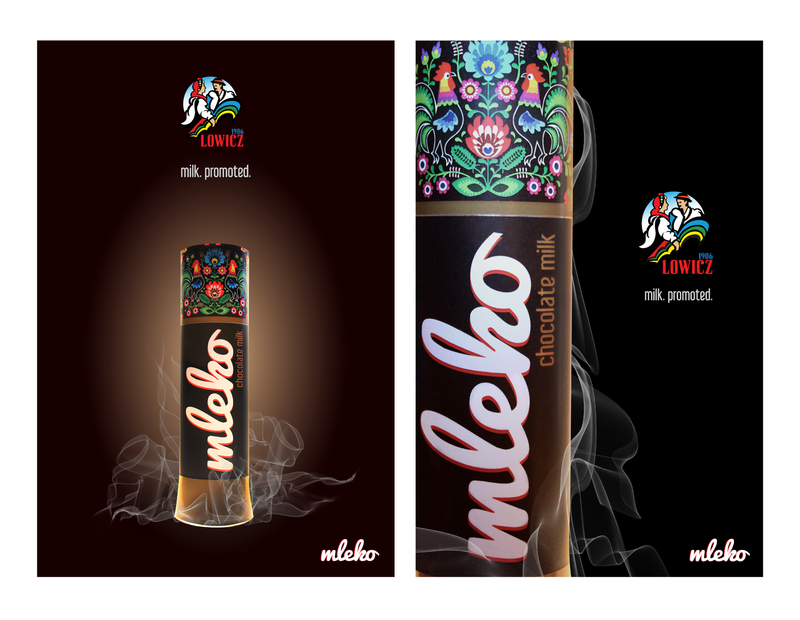 Advertisement for Lowicz "Mleko" brand. Taking your every day conventional chocolate milk product and maturing it for high-end consumers. 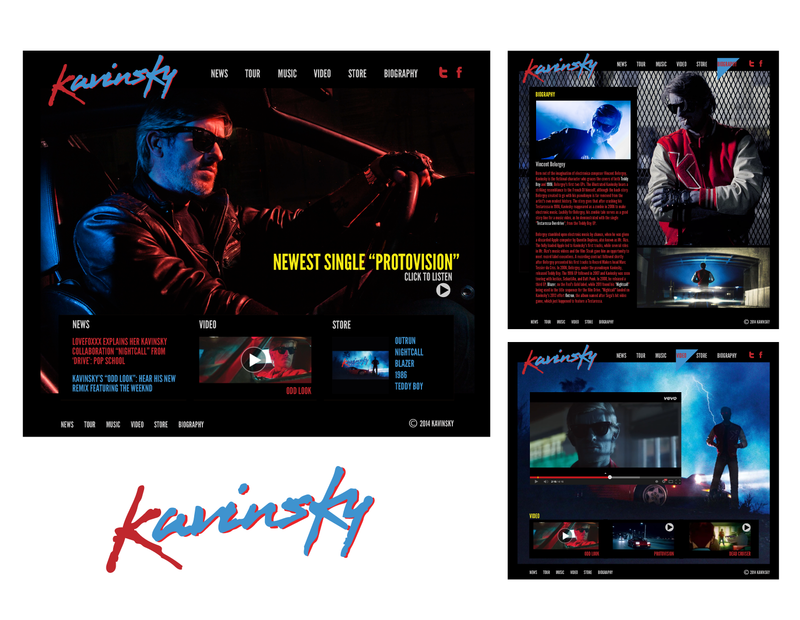 A web presentation of Kavinsky's latest album "Odd Look" depicting its nostalgic retro theme, look and feel. 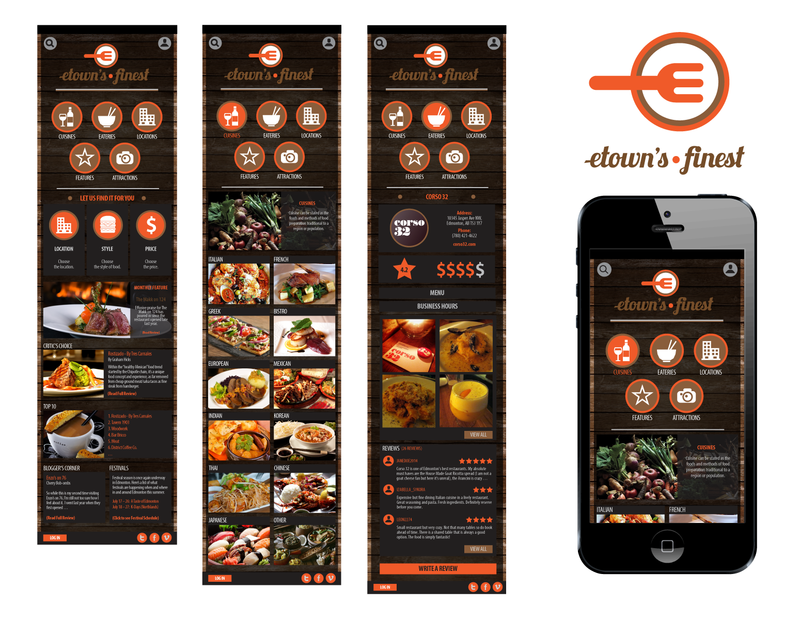 A mobile website design that aims at searching and finding local eatery establishments based on user preferences. 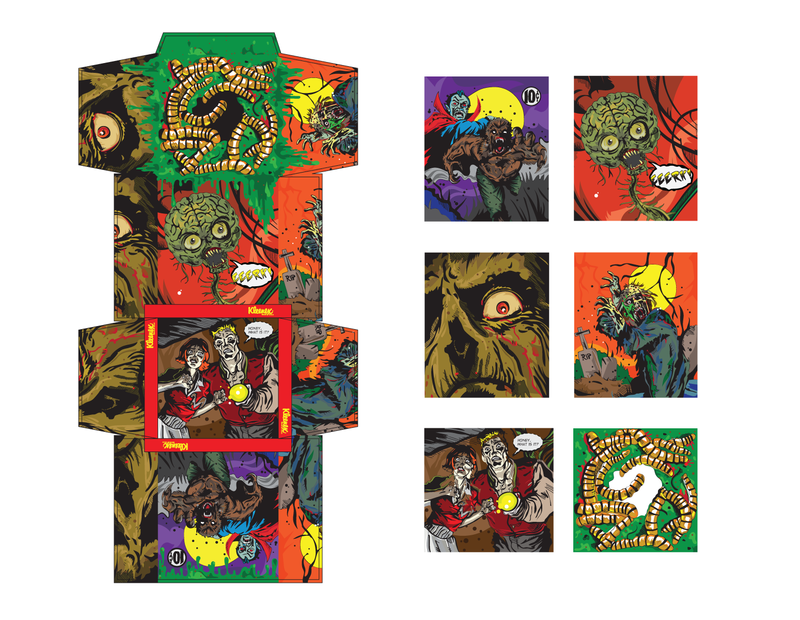 A fun and entertaining sci-fi/horror themed Kleenex box aimed at children who love the classic look of 1950s comic books. in the bright orange building is where I spent most of my days. and shootin’ some photos outside of the school. you’ll be jealous of my square crop. yea man, you’ll see I’ll be designing e-town. I’m inspired by: pretty mugs, muted colours, winks, corny jokes, quirky people, baby plants, skydiving, brutal honesty, and Beyoncé. 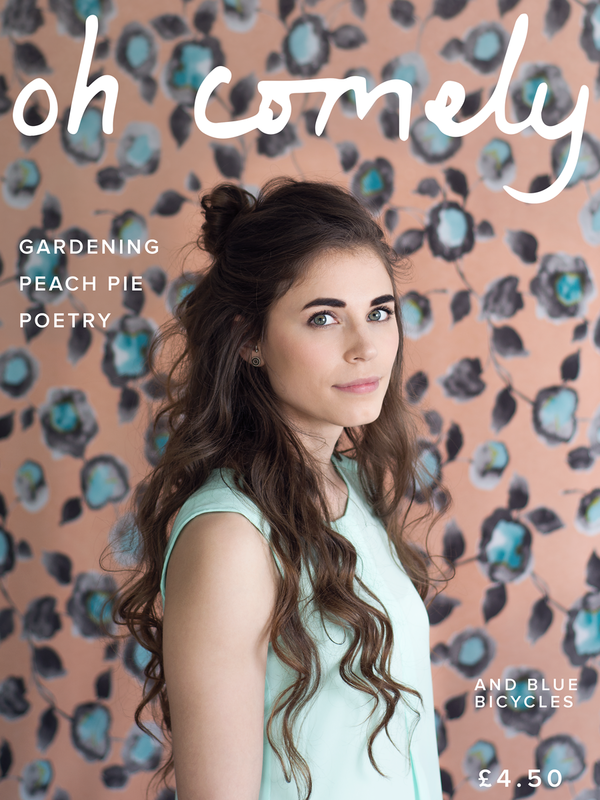 An editorial portrait and layout for Oh Comely Magazine, a magazine that promotes creativity and adventures. 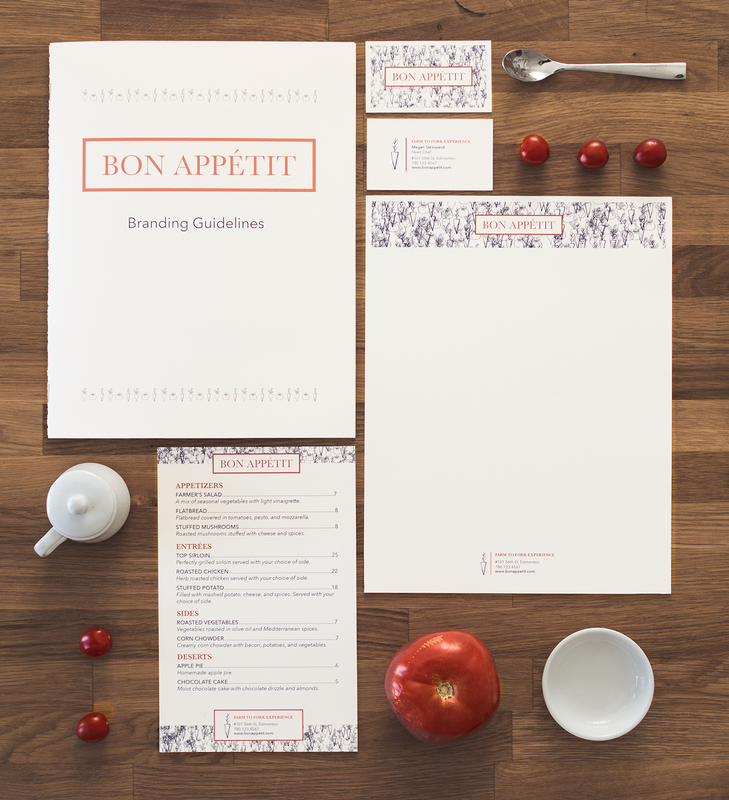 An identity system and stationary created for a local restaurant with a farm to fork concept. Part of a series of editorial fashion showing a love of denim. 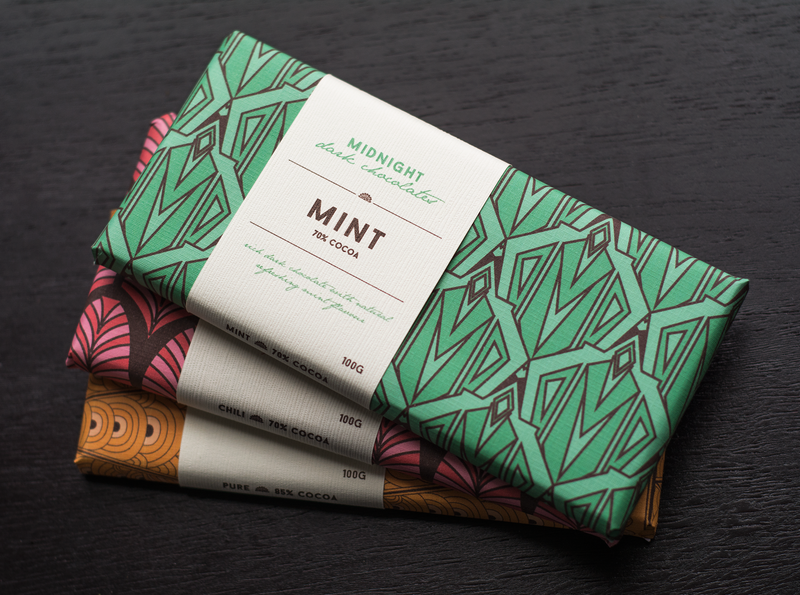 Chocolate packaging and identity design for a high-end dark chocolate company. 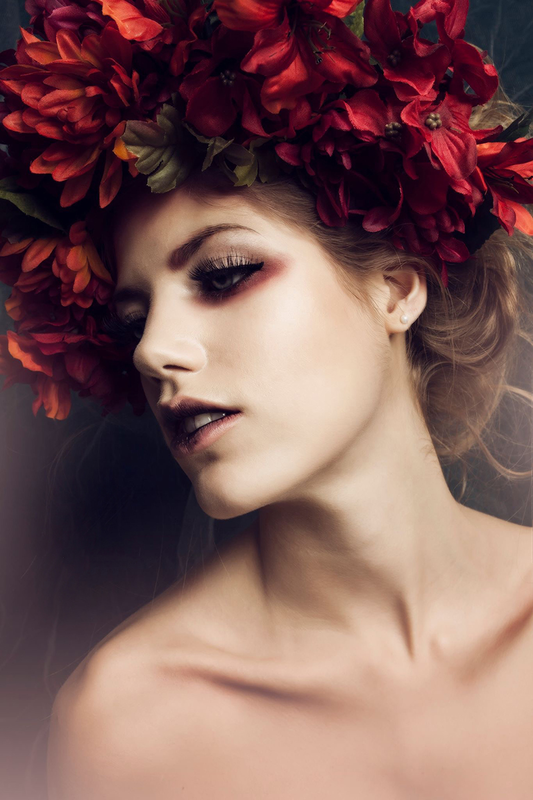 I am an international student from Hong Kong, specializing in fashion, beauty and conceptual photography. I am extremely quiet, a Capricorn, love cats, love Hong Kong, love chocolate and dessert. I am currently on the shortlist of photography in Emerging Media Award 2015. 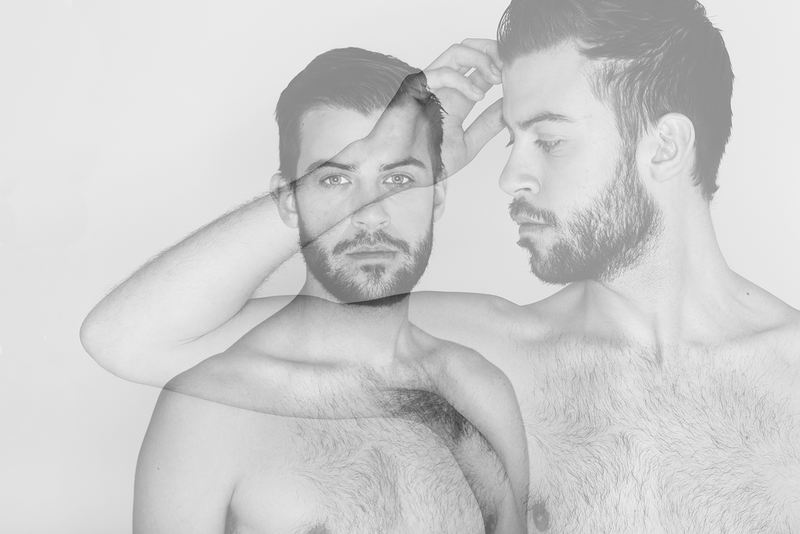 Photo inspired by Albert Watson by mixing area light and continuous light. Image shoot for self-promotion package design with a theme of horoscope. This is the Capricorn. My mom tells this story of when I was little about when we had people over and they were walking in and out of the yard, I was sitting there watching them very closely trying to figure out how the latch of the gate worked. Since then I have been trying to figure out how everything works - including people. 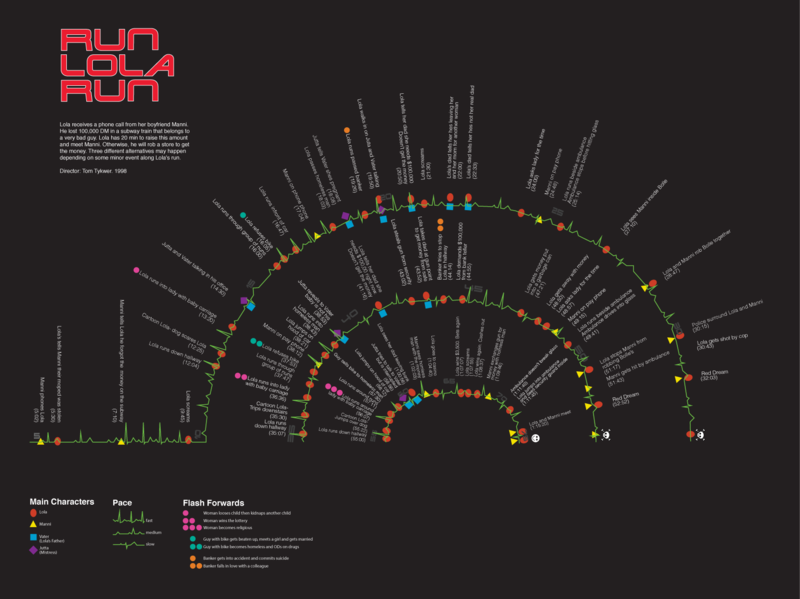 I'm discovering what makes a person tick and how to elicit emotion through design. I think that people lose their filter on Twitter and the things they say in that context are very inspiring. Clumsy, super awkward and did everything wrong – my first time using Photoshop. 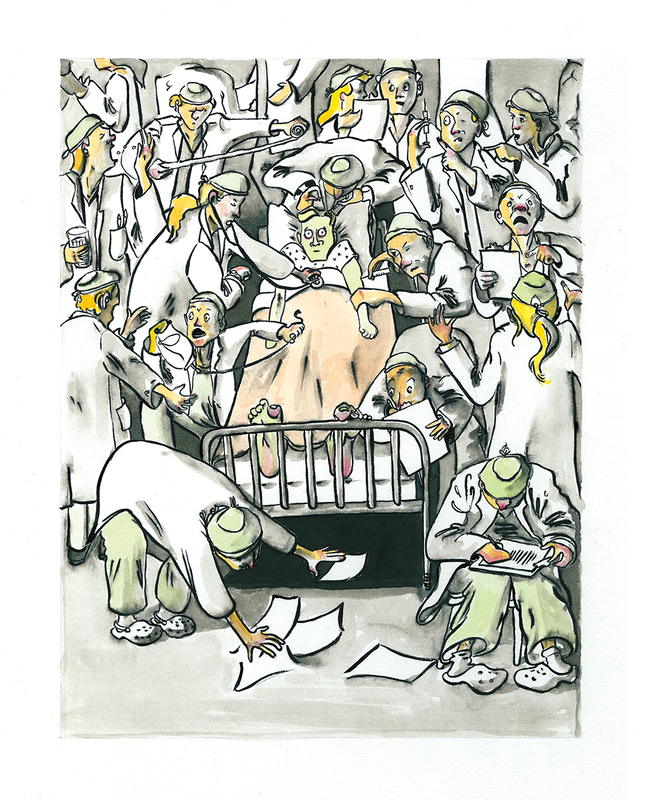 An illustration inspired by observation of patient's experiences in the hospital. I have witnessed many terrified patients looking overwhelmed by the sheer number of experts surrounding them and performing activities they know nothing about. Poster as part of an ad campaign proposal for the Walk In Counselling Society of Edmonton targeted at men working in oil and gas. Received an ACE Award of Distinction. 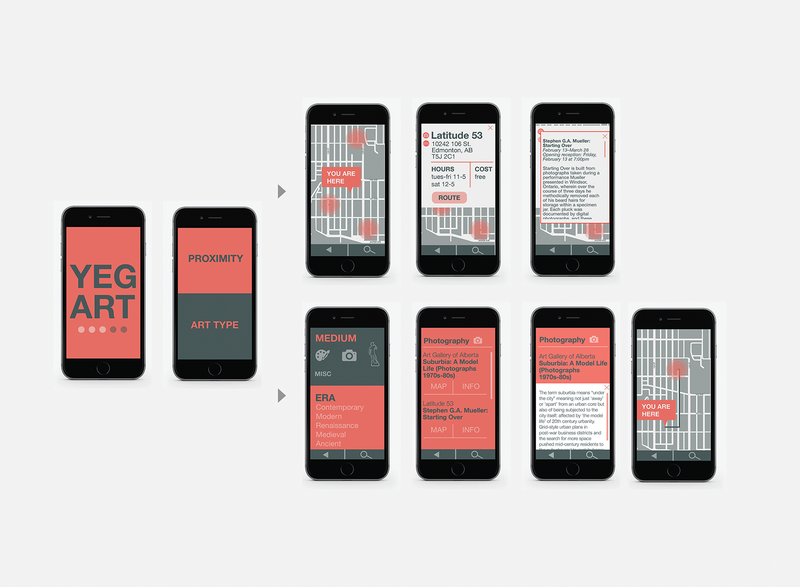 Wayfinding system to help people discover art galleries in Edmonton. I am an illustrator, designer and most importantly a creative. I have always enjoyed drawing and can be found in my own world when working on a piece. When it comes to an outlook on life, I’m very optimistic and most likely to find the positive aspects that can become the foundation to a project. When I’m not designing, I can be found playing soccer or enjoying a glass of milk with some friends. I draw inspiration from the environment around me. Whether in nature or society and observing life. Fantastic. Never could I imagine that one font would work so well. Helvetica has become a favourite of mine. Live long and prosper. 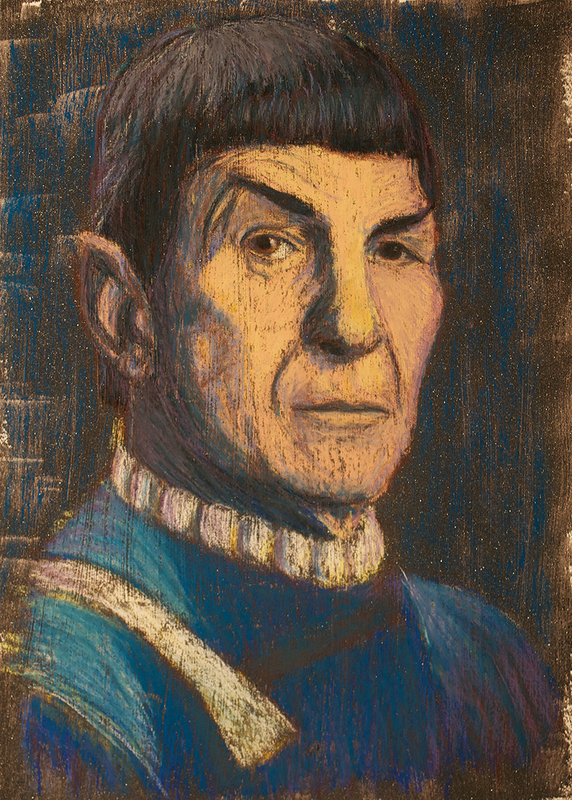 A pastel painting of the legendary Leonard Nimoy. 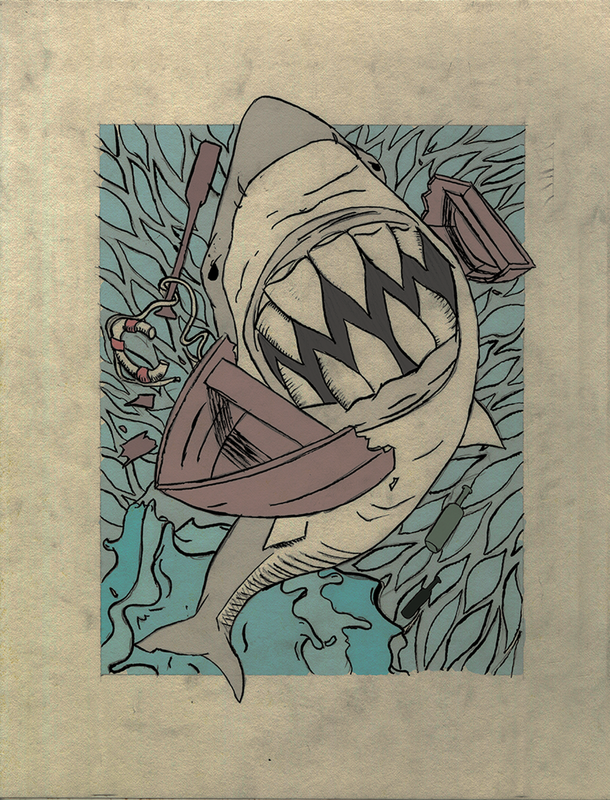 An ode to the power of the shark. 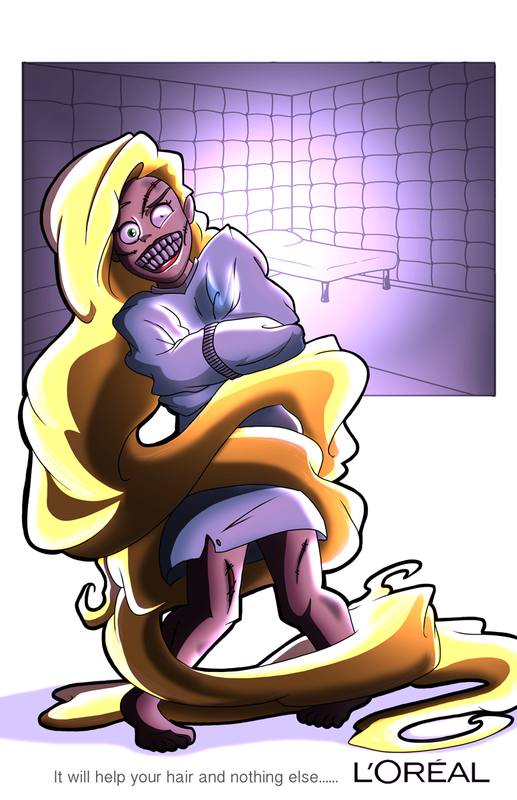 Inked illustration then digitally painted. Based off the book, Indian Horse. Capturing the destruction of culture that occurred. The fan base is blowing up. 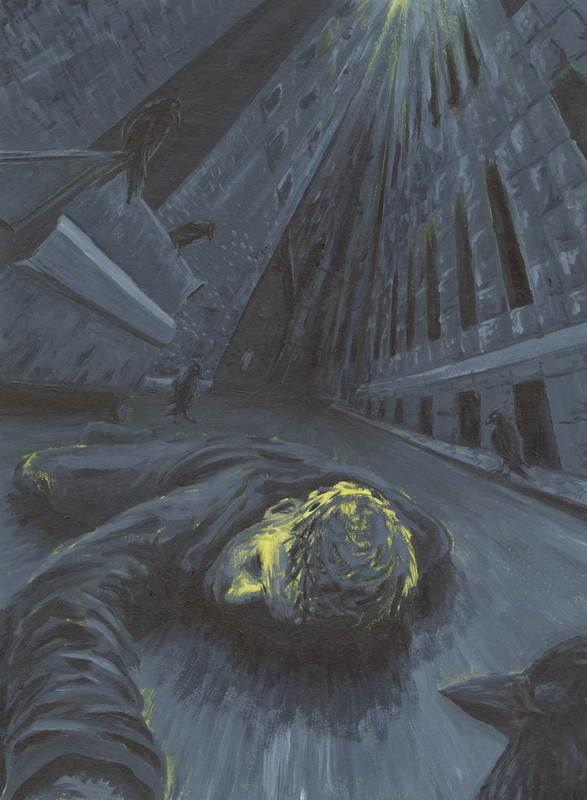 This acrylic painting uses three point perspective and a bold colouring. 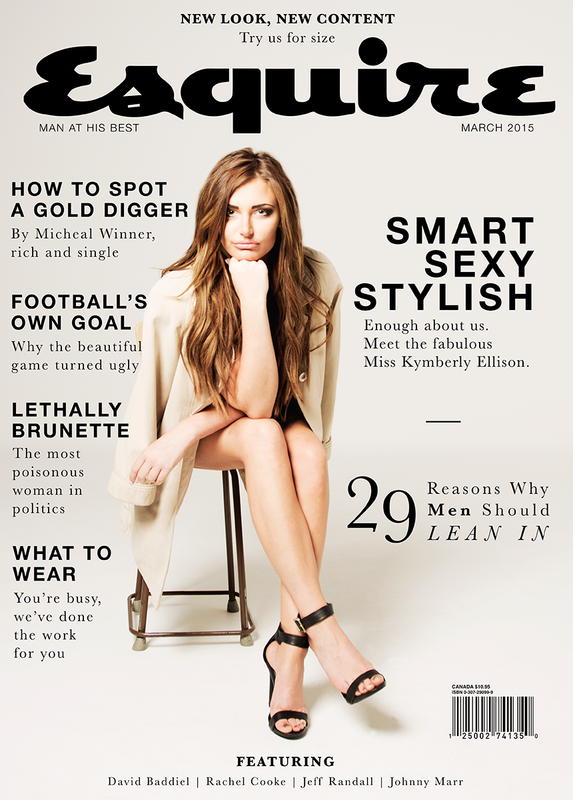 My name is Michelle White and I am a graphic designer from Edmonton, Alberta. I have a passion for how things are laid out and what materials were used. You can catch me studying the menus at restaurants for their choices of type and the feel of the paper or the logos on business signs when driving. I am a recent grad from MacEwan University and cannot wait to improve my skills out in the working world. I draw inspiration from the people around me and the activities I participate in outside of school. At first it was confusing and I had no idea what to do. 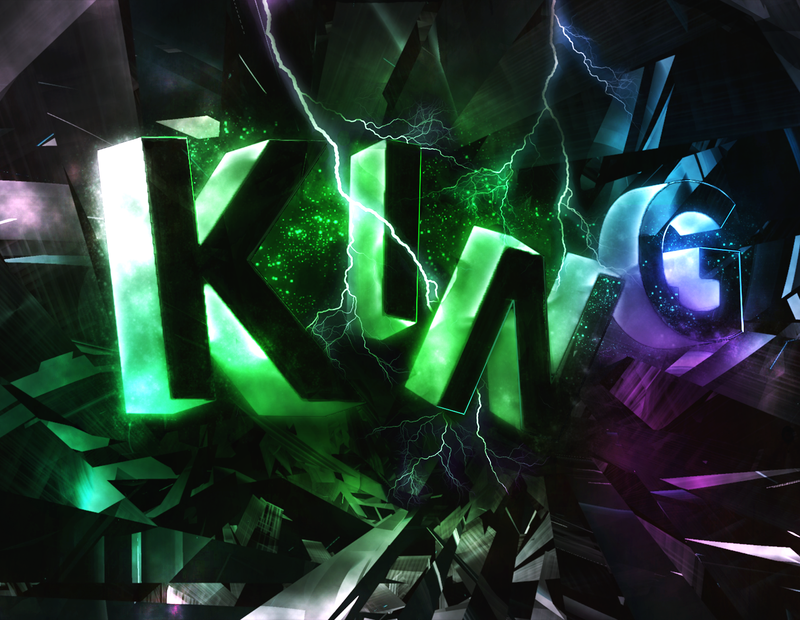 After some practice I got the hang of it and decided that Photoshop isn’t that bad. 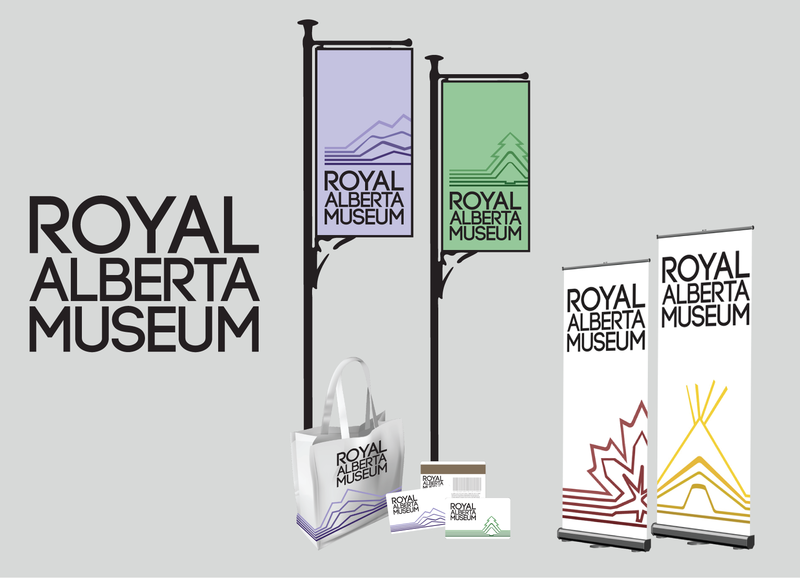 A new identity and collateral pieces for the Royal Alberta Museum. The pieces included pop-up banners, street signs, gift cards, and gift bags. 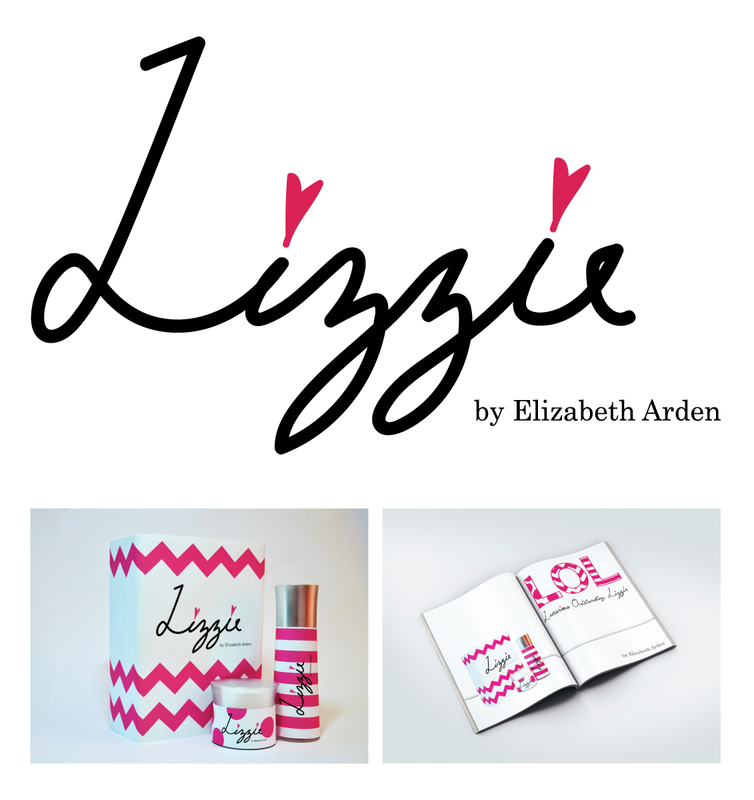 A re-design of Elizabeth Arden targeting a younger audience. 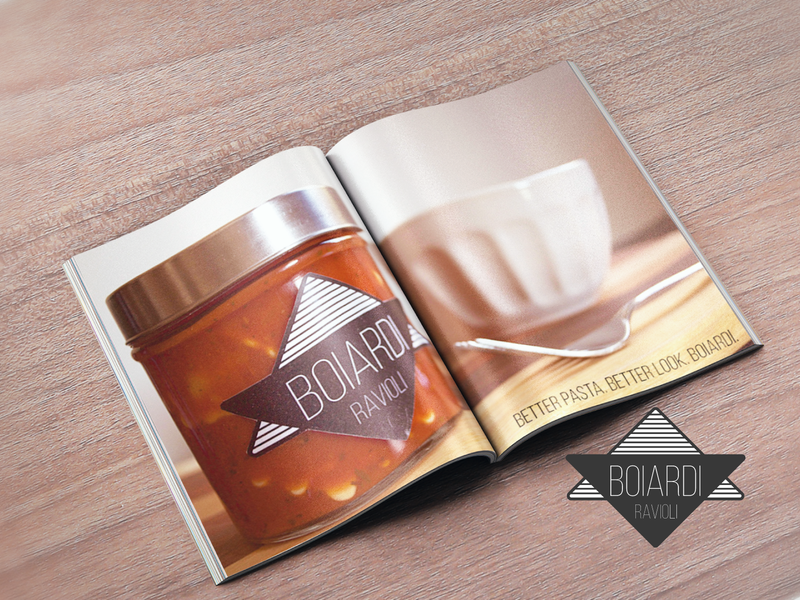 A new identity, packaging and magazine ad were designed. Bang! Zap! Pow! 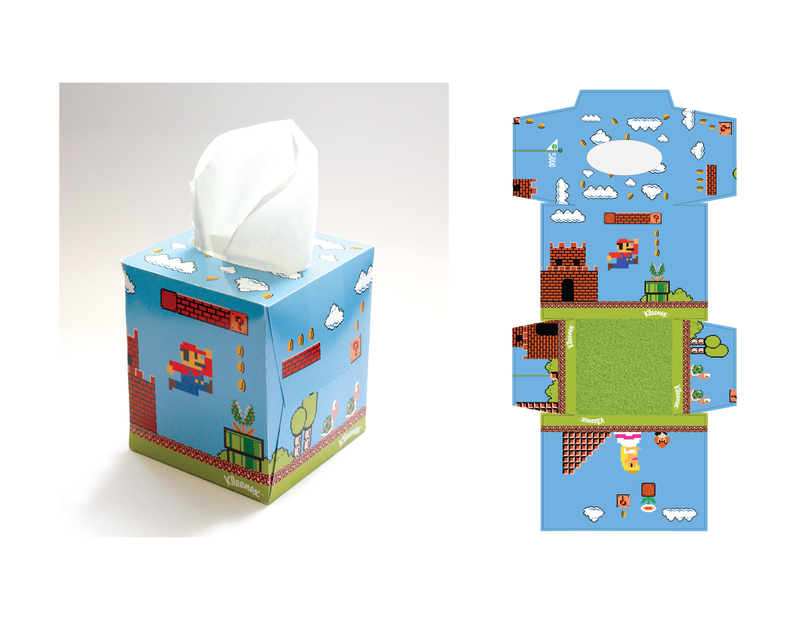 A tissue box design for Kleenex brand tissues. 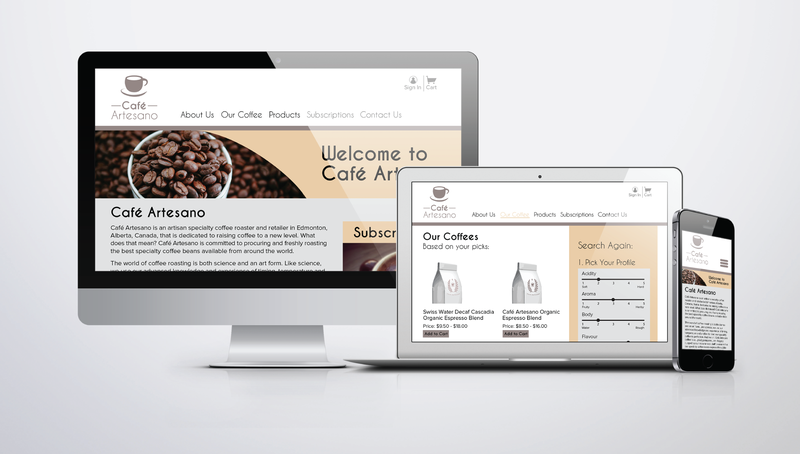 A website mock-up for café that offers an online shopping experience. 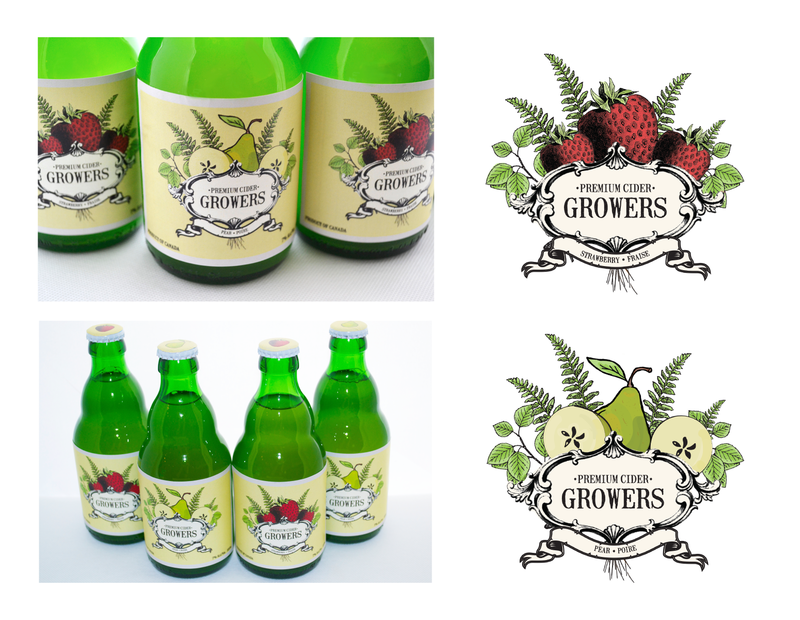 All photos used were used for mock-up purposes. I am a born and raised Edmontonian with a strong heart for my city. I love exploring the streets, meeting new people and continually discovering the hidden gems. This constant exploration of the seemingly mundane has creeped into my designs and my perspective on life. I love design and I love finding the beauty in the small details that make the big picture. 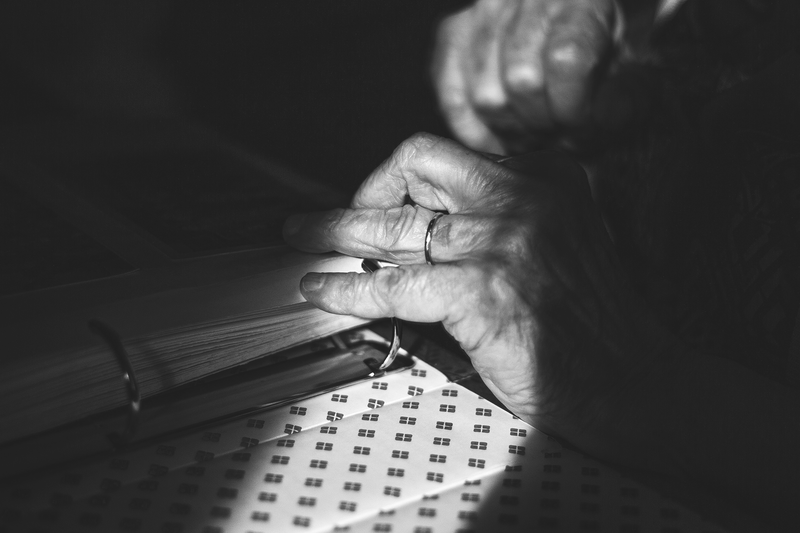 The people who allow me a glimpse into their lives and share their stories with me. A lady never designs and tells. 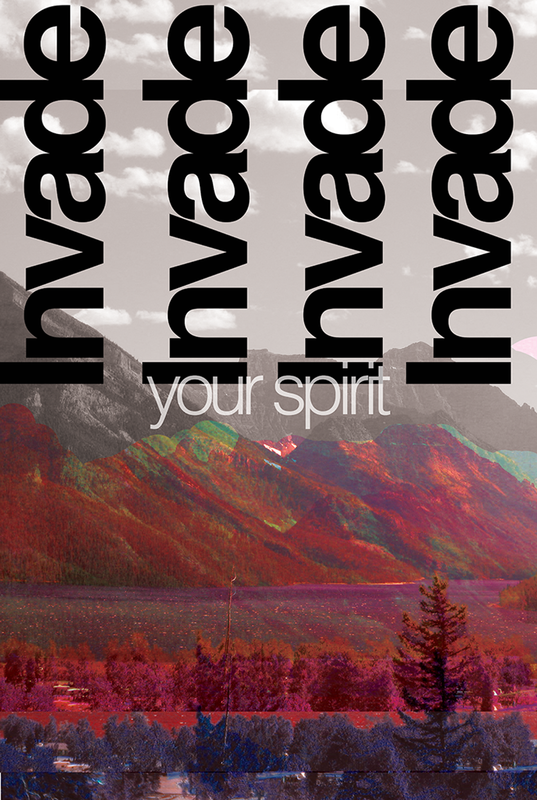 A broadening package for a fictional young adult conference located in Canmore, AB. 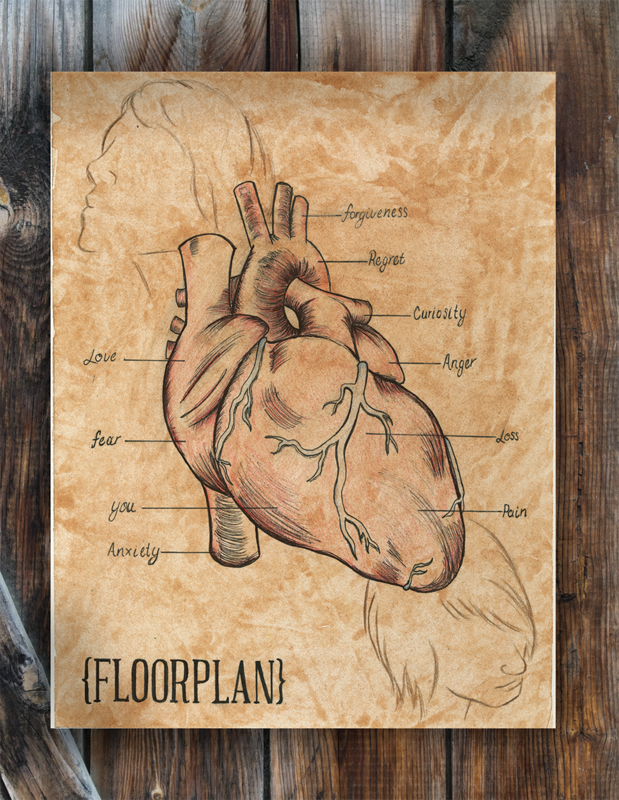 Interpretive illustration based on the song “floorplan” by Tegan and Sara rooted in the growing pains of wavering relationships. An editorial illustration reflecting the mood and essence of life on East Hastings Street. 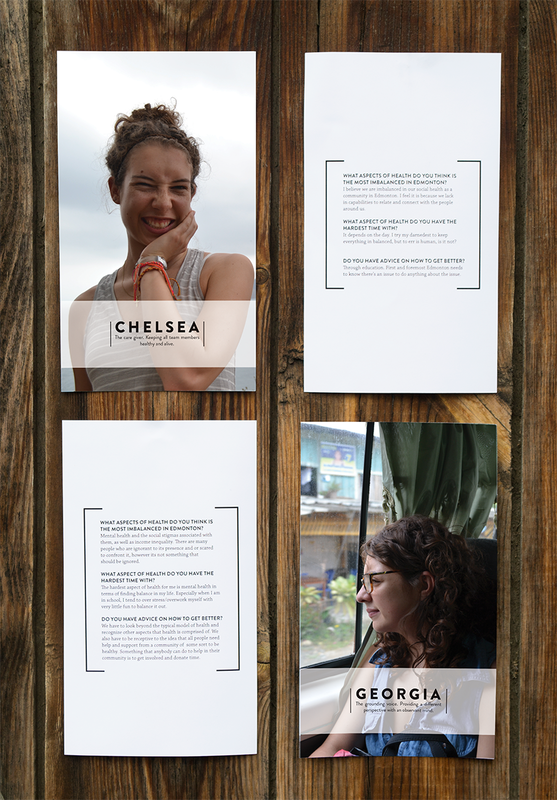 A series of postcards reflecting each team member and their insights into the overall state of wellness in Edmonton. Copyright MacEwan University 2015. All rights reserved. The content of this website may not be reproduced in any way or through any medium without the written permission of the publisher. Copyright for individual student work remains with the student.